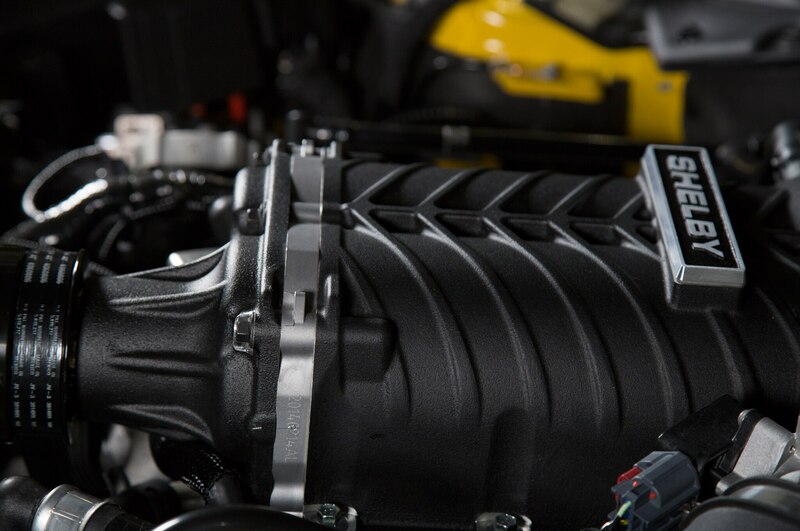 Muscle without the lactic acid buildup. 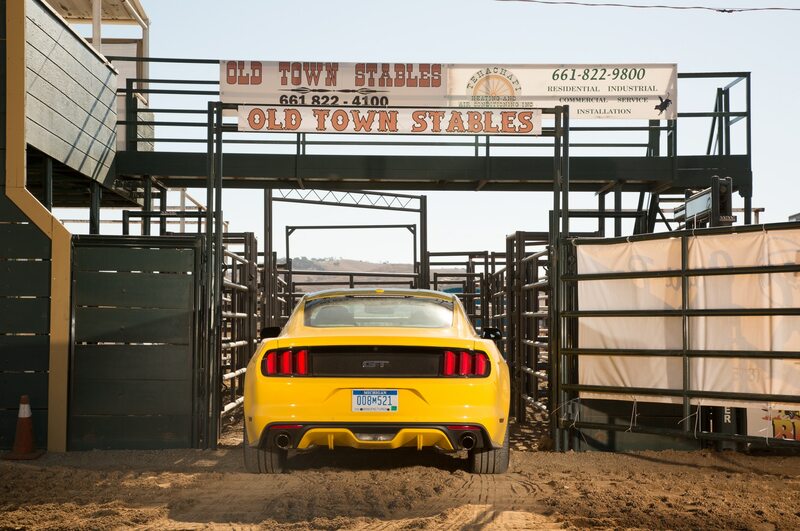 It’s 50 miles from 6405 Ensworth St., at the south end of the Las Vegas Strip, to 3601 State Highway 160, just outside Pahrump, Nevada, with its odd contrast between brothels and Mormon ward houses. 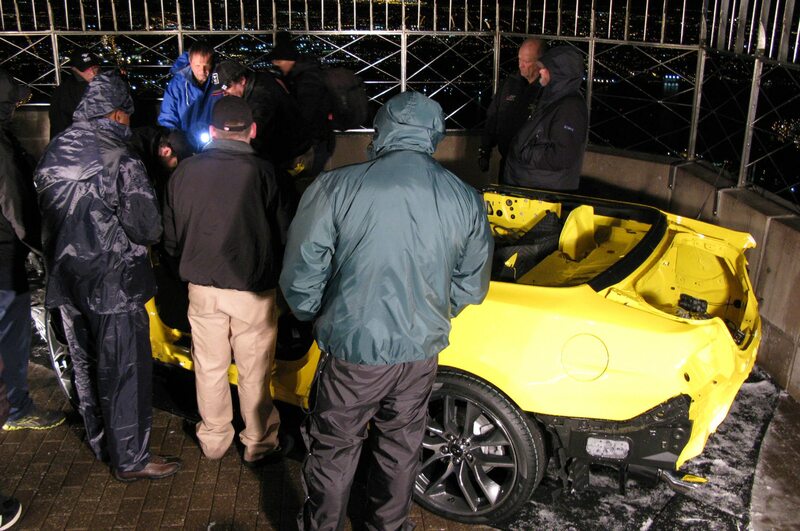 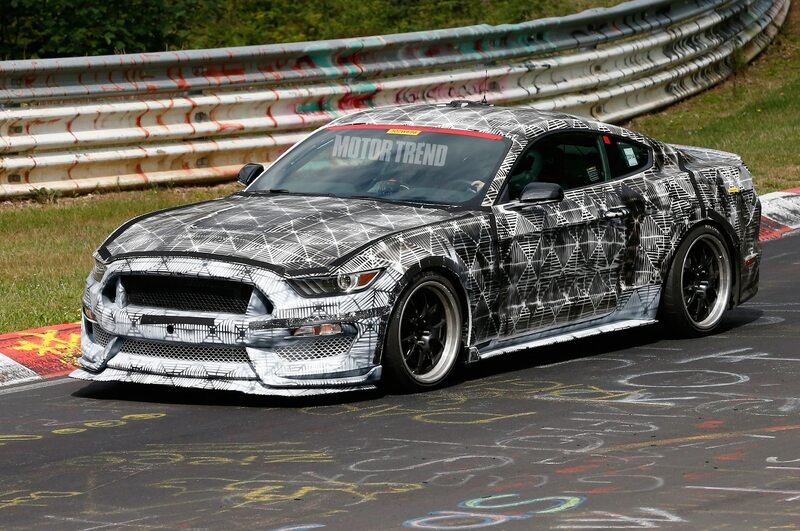 Neither looks like it could have much to do with a car, let alone a good one. 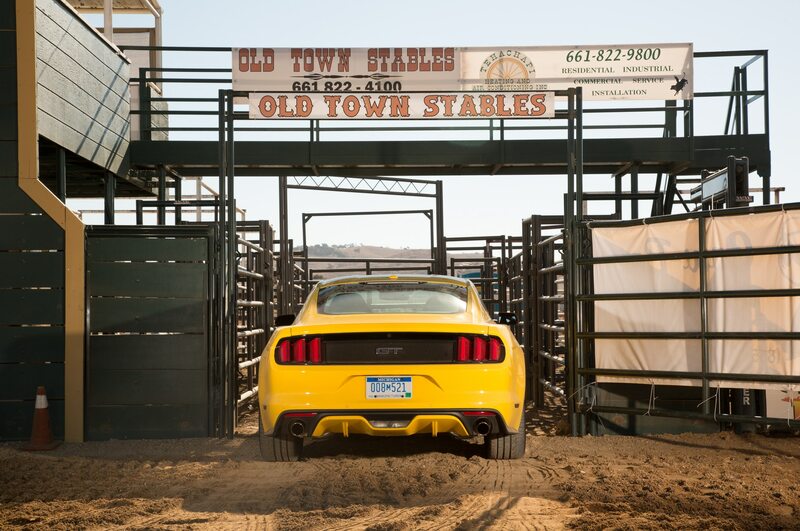 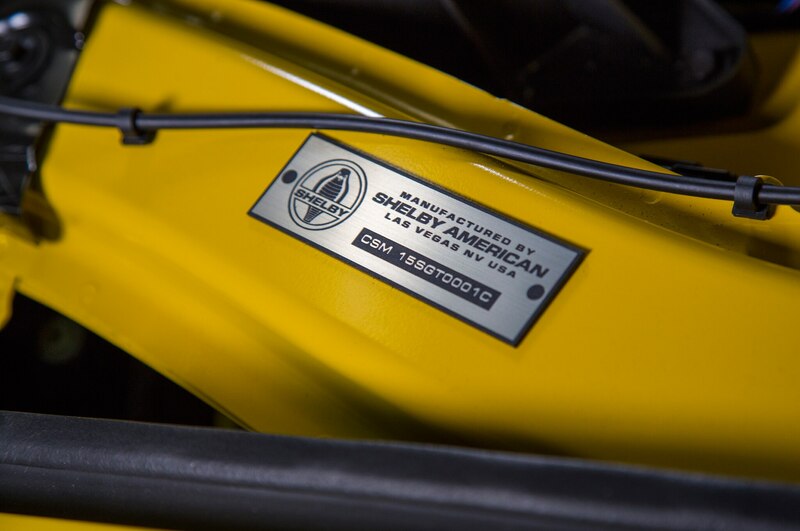 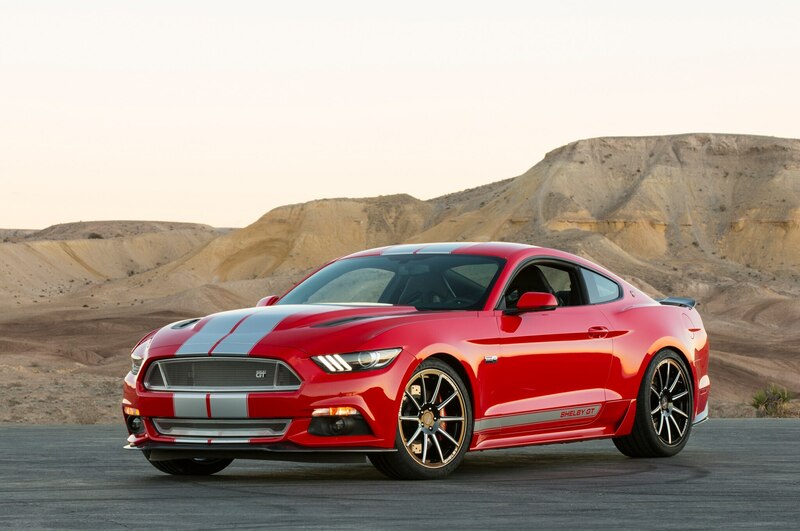 Yet the former address is the location of Shelby American, a 135,000-square-foot building where Ford Mustang GTs become 2015 Shelby American GTs. 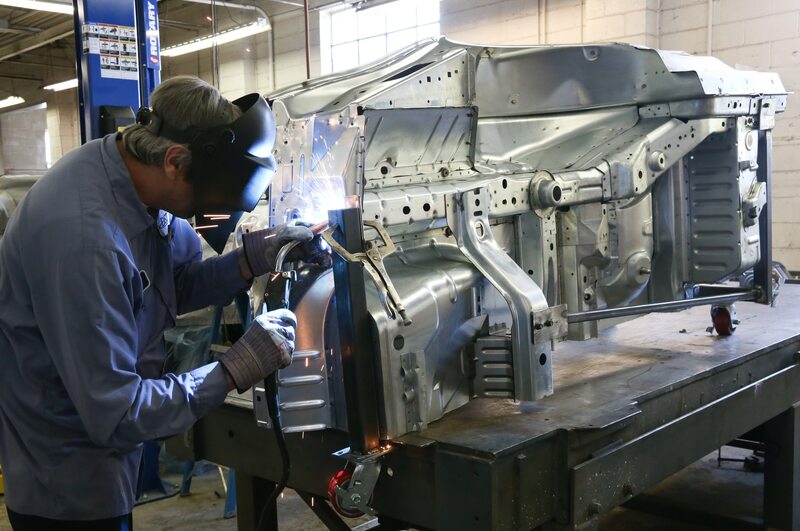 The latter is home to Spring Mountain Motor Resort and Country Club, where we’ll get to thrash several freshly built prototypes of the car. 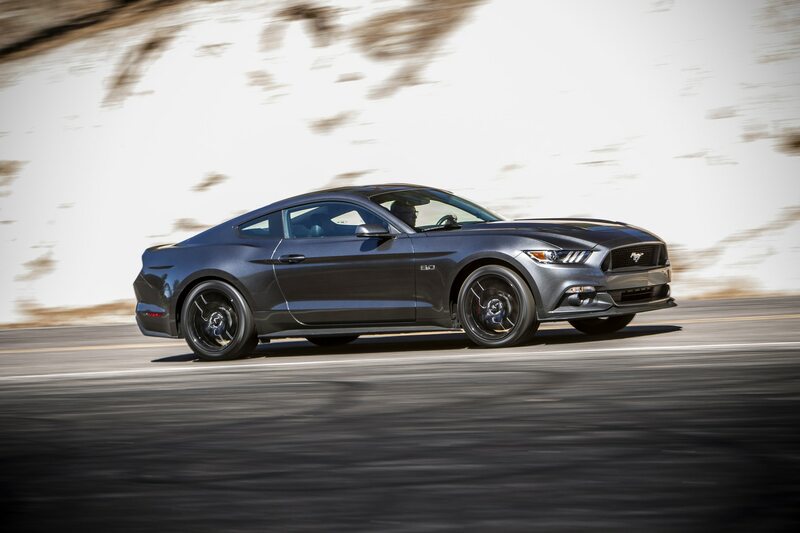 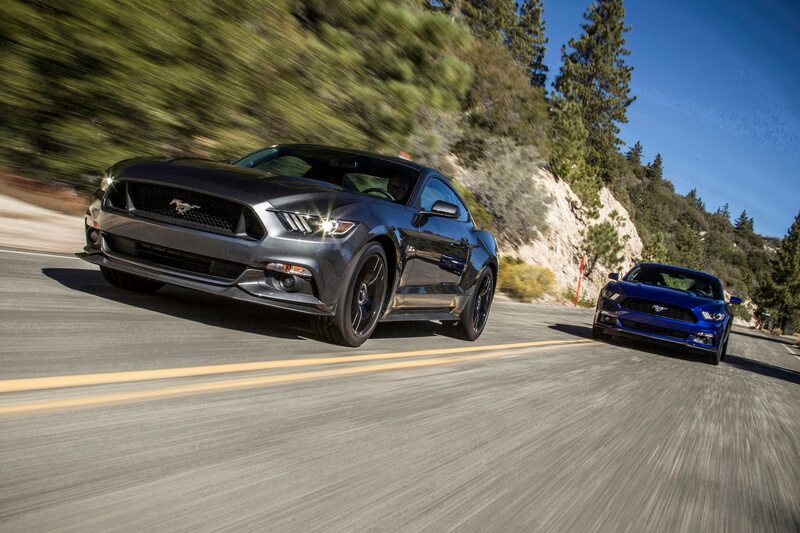 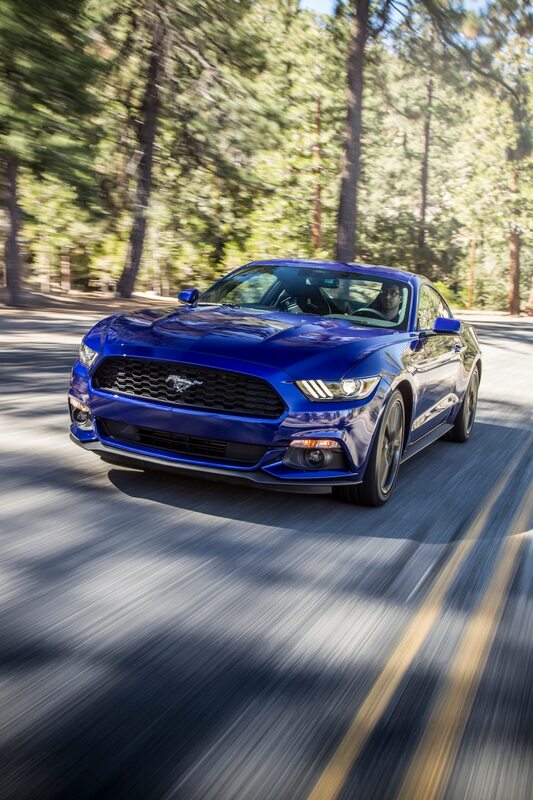 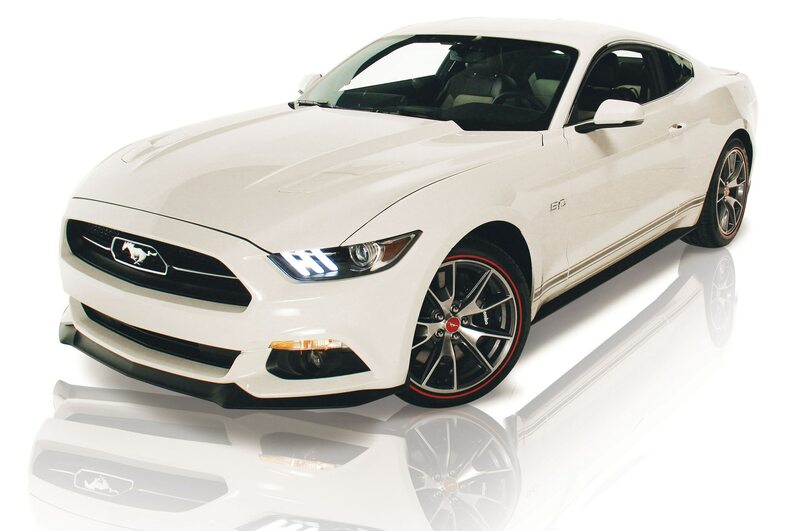 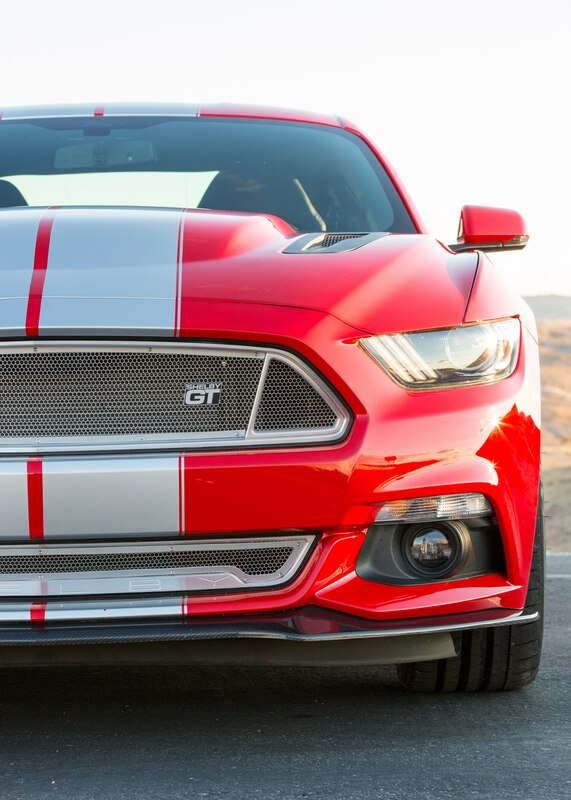 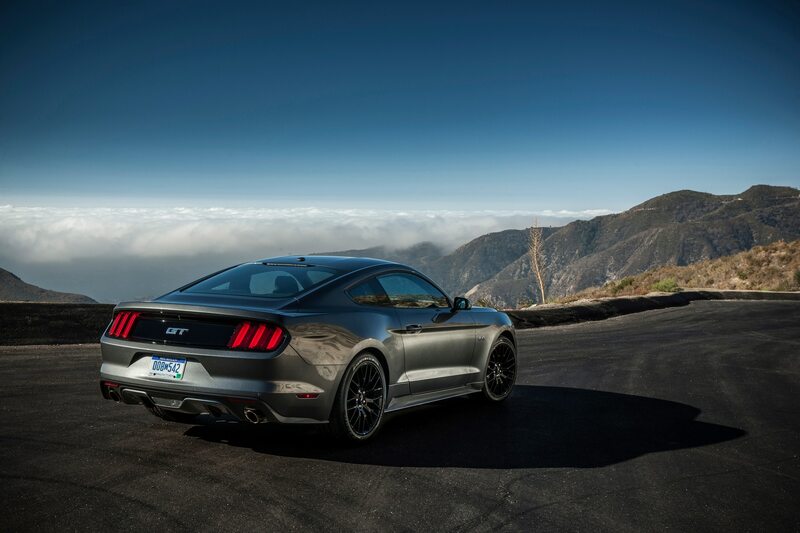 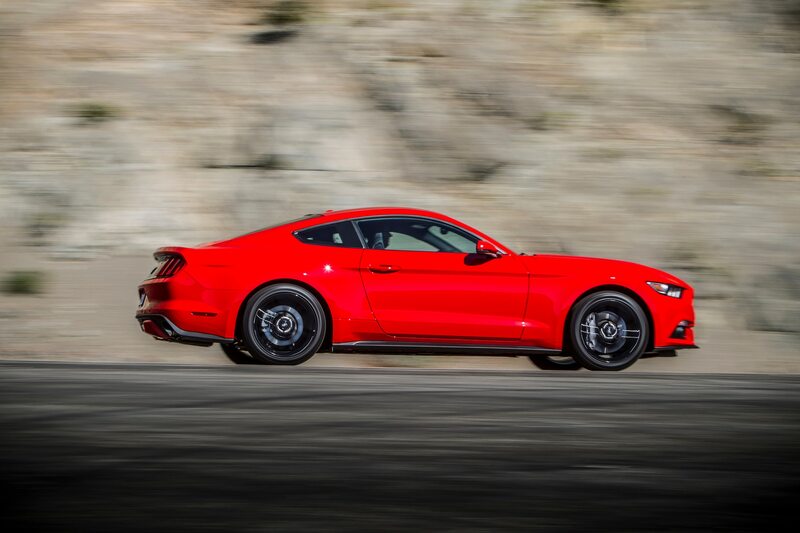 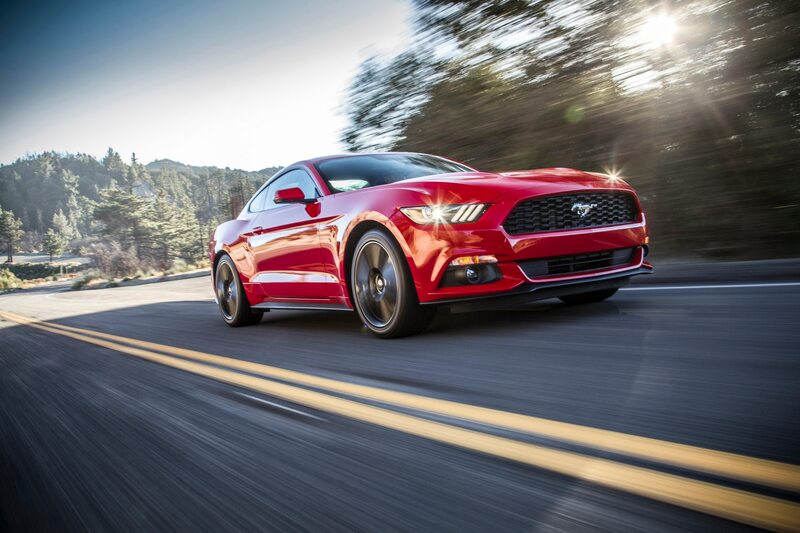 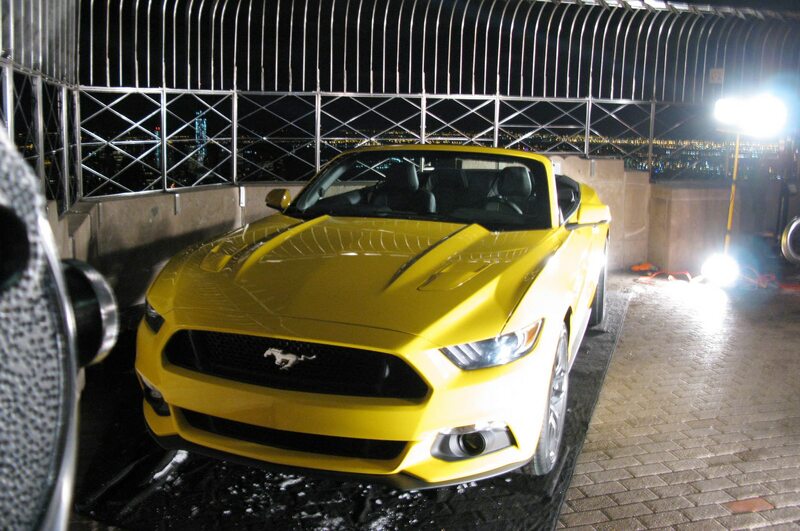 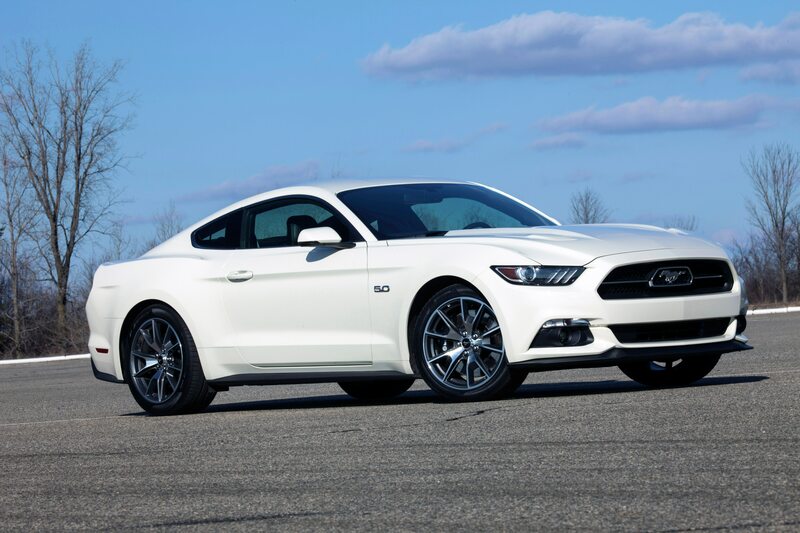 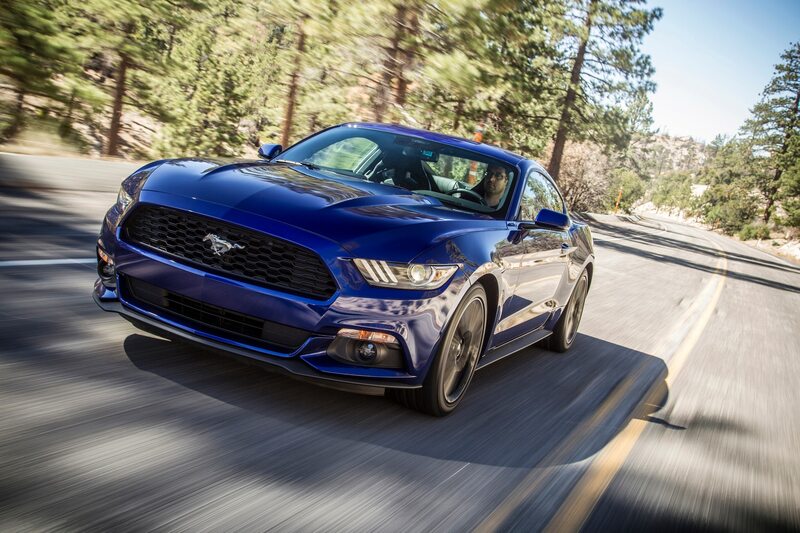 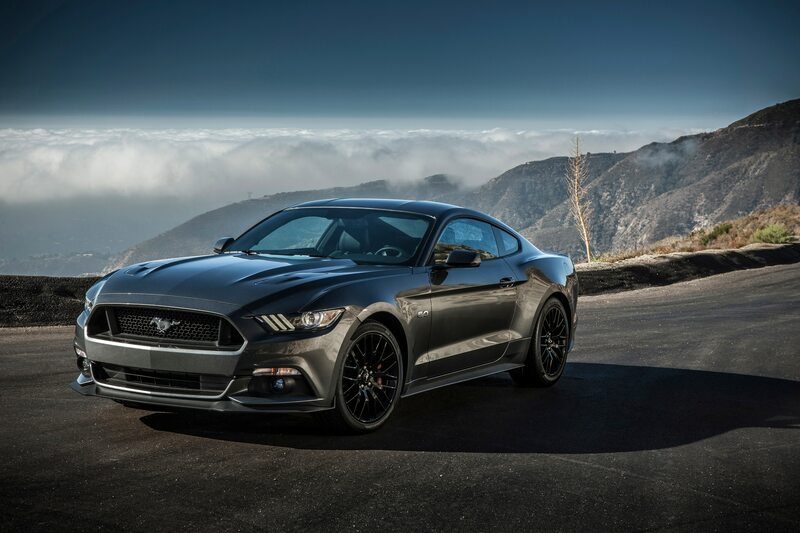 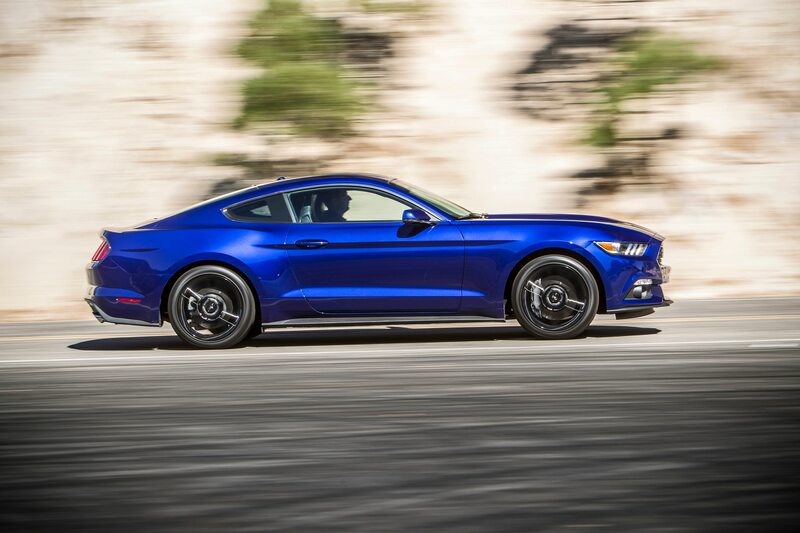 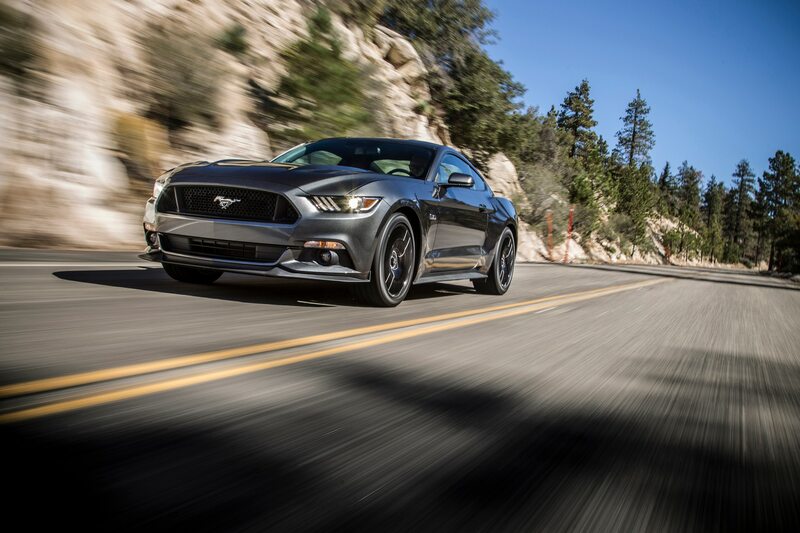 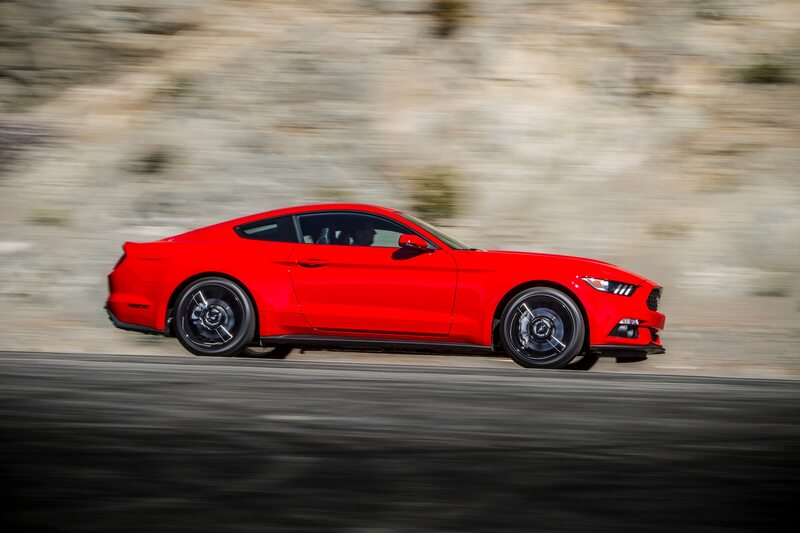 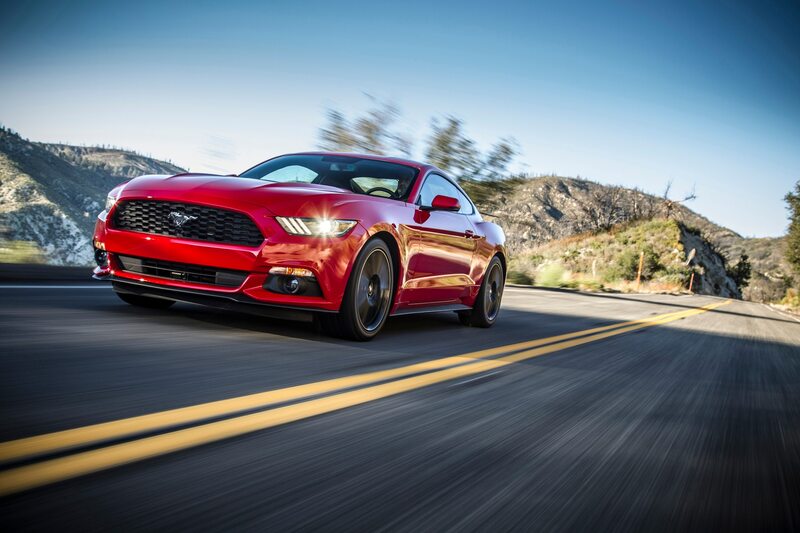 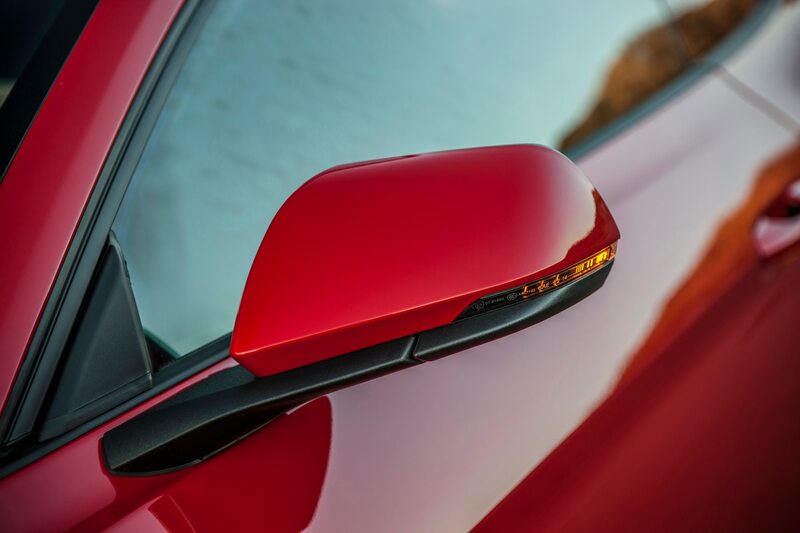 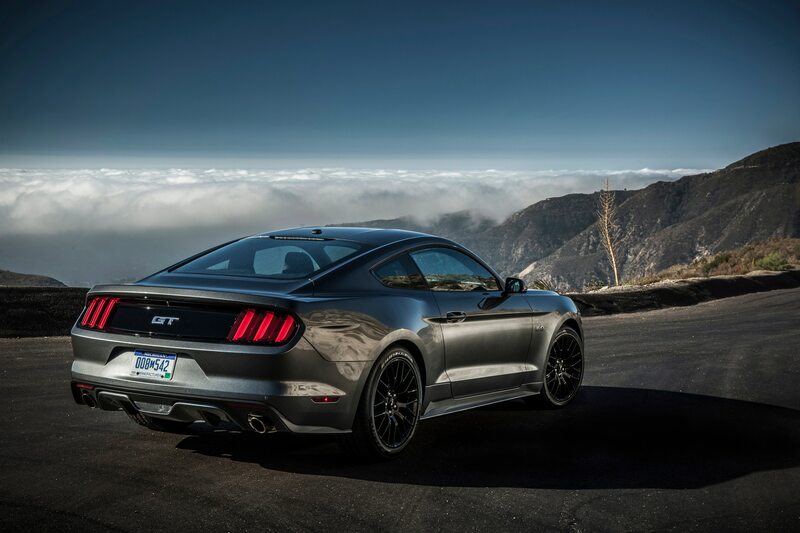 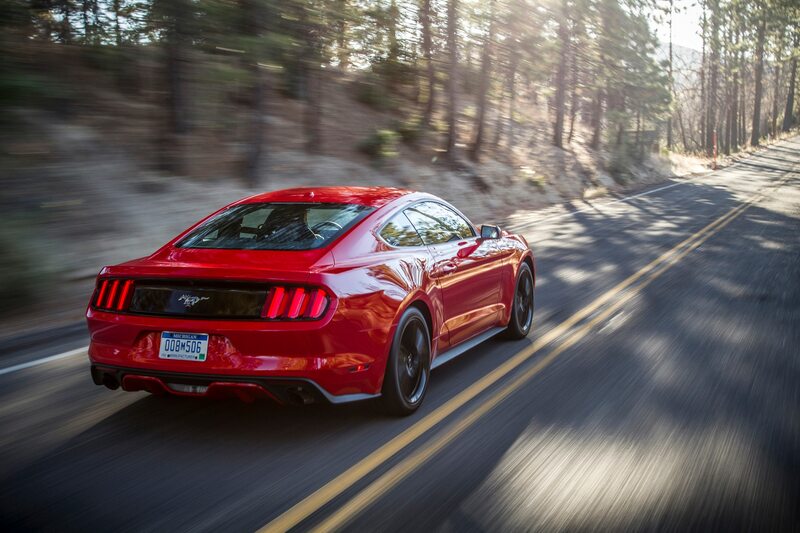 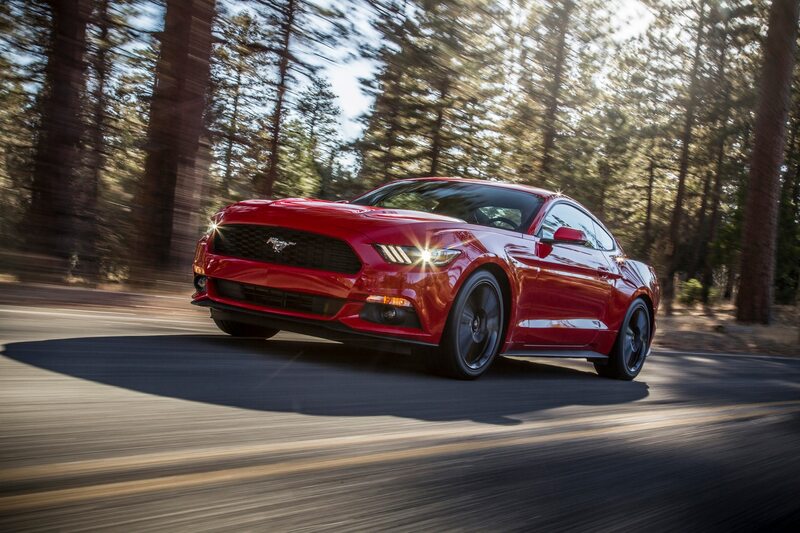 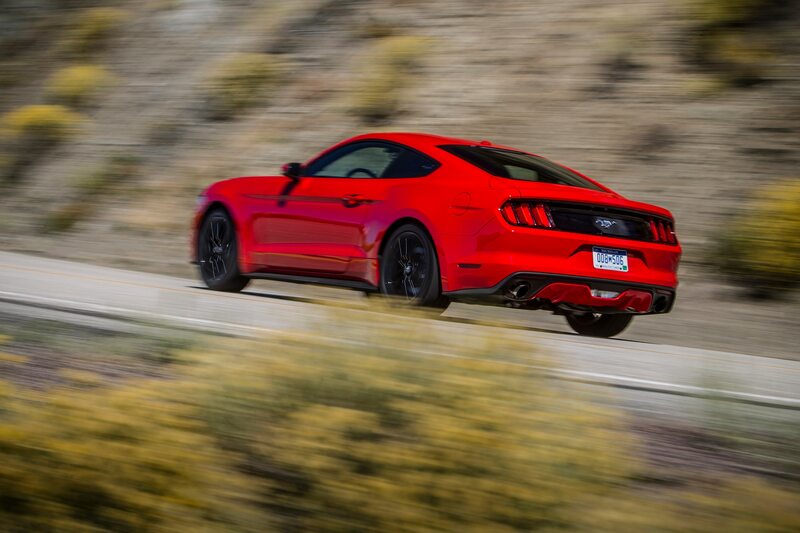 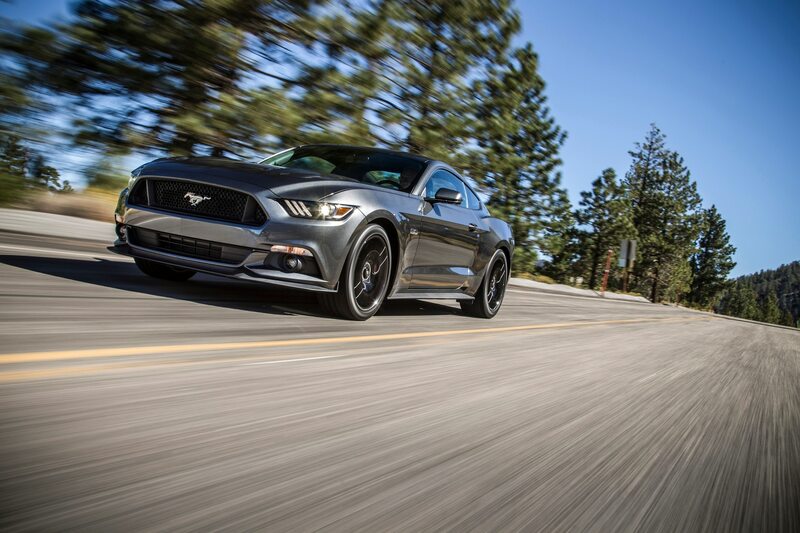 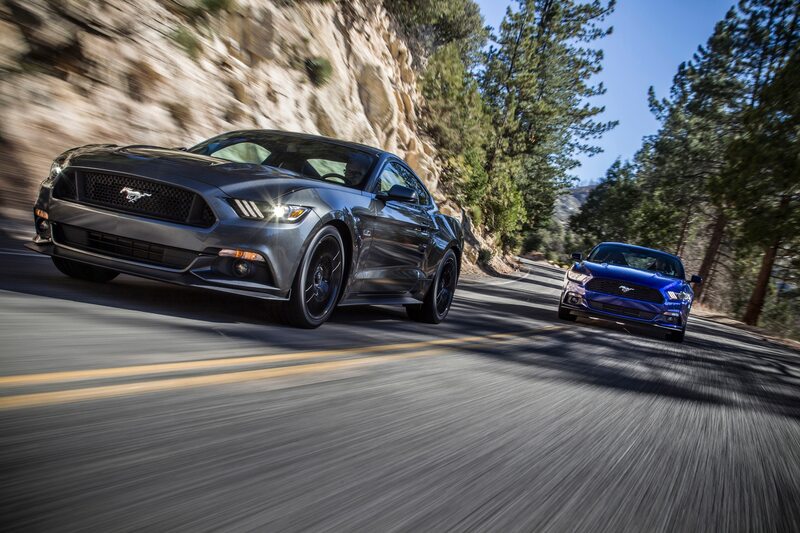 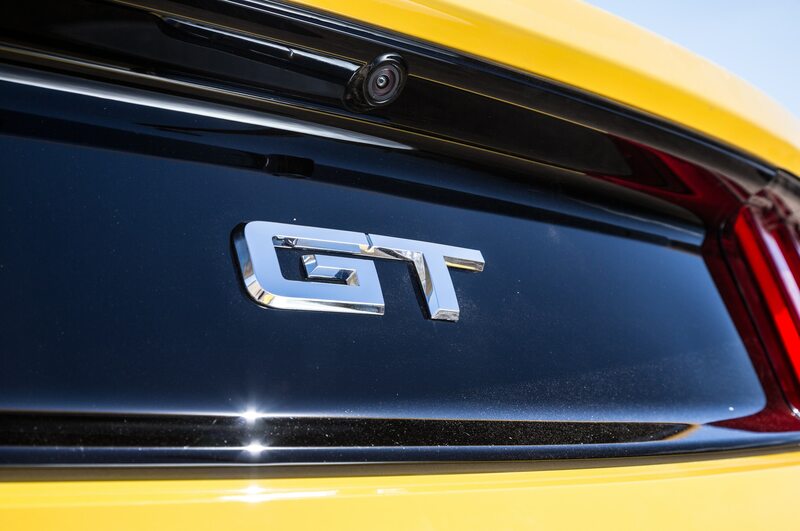 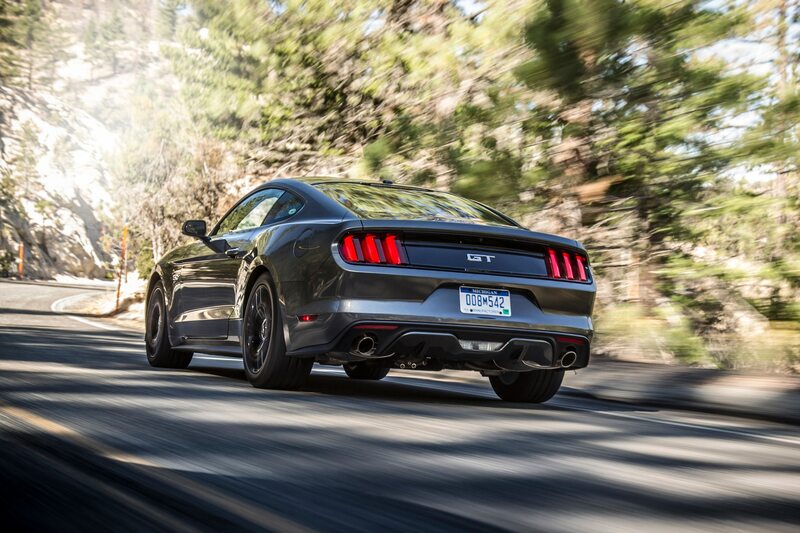 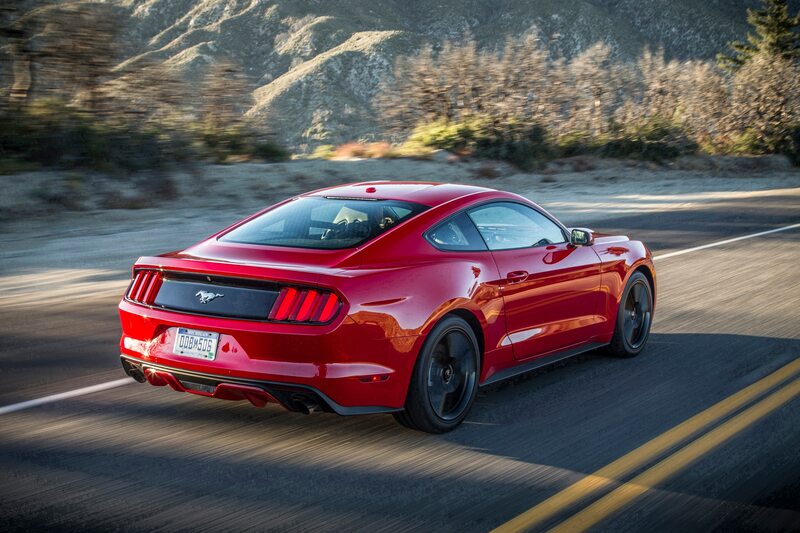 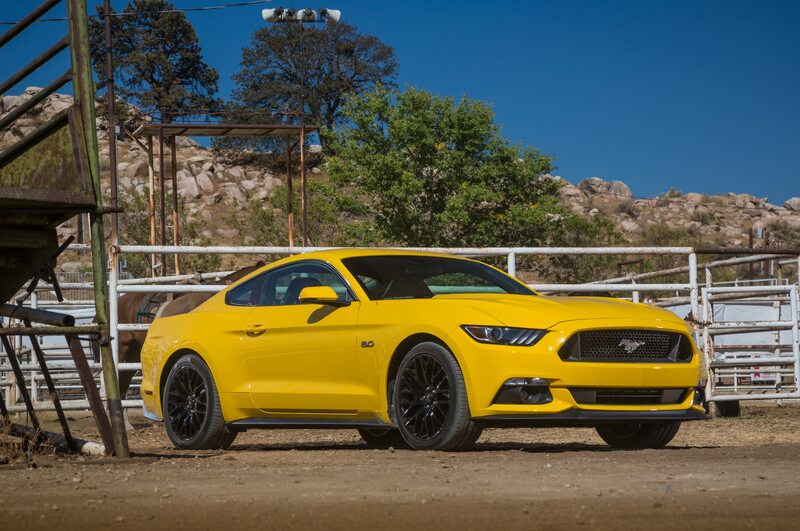 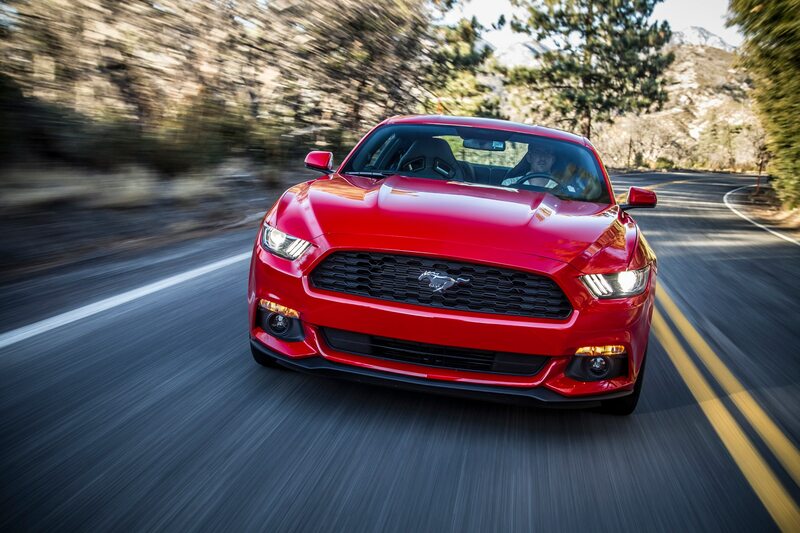 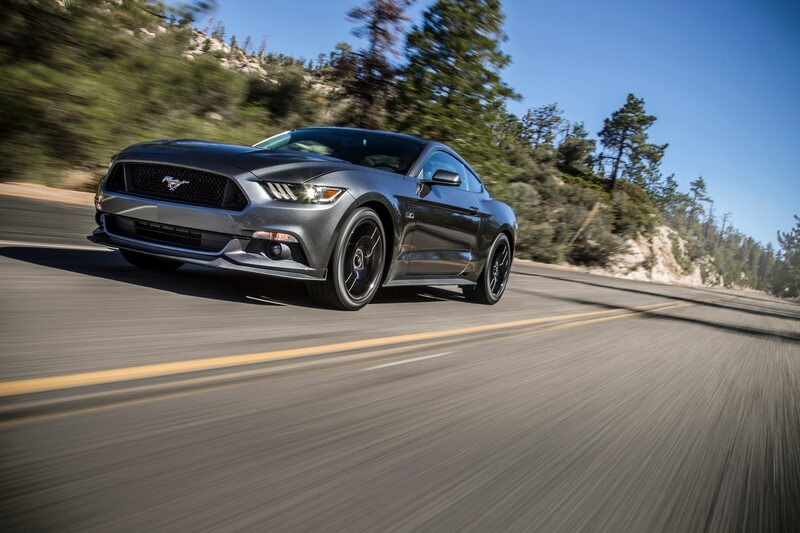 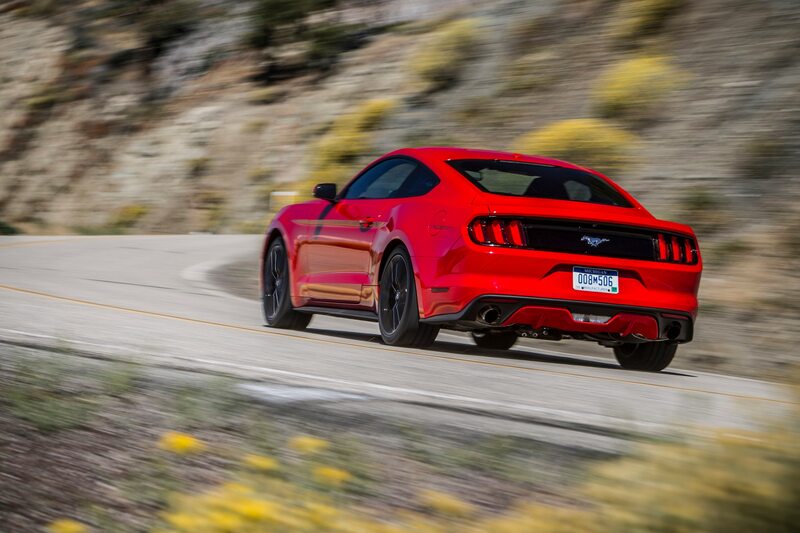 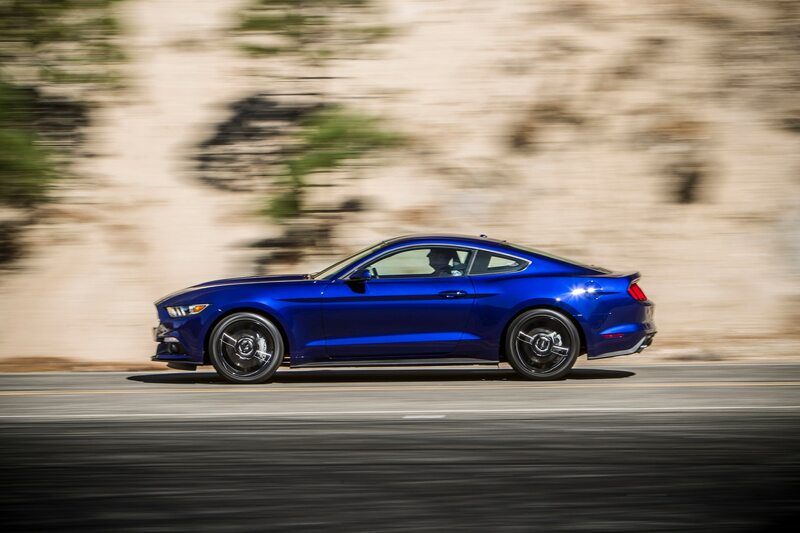 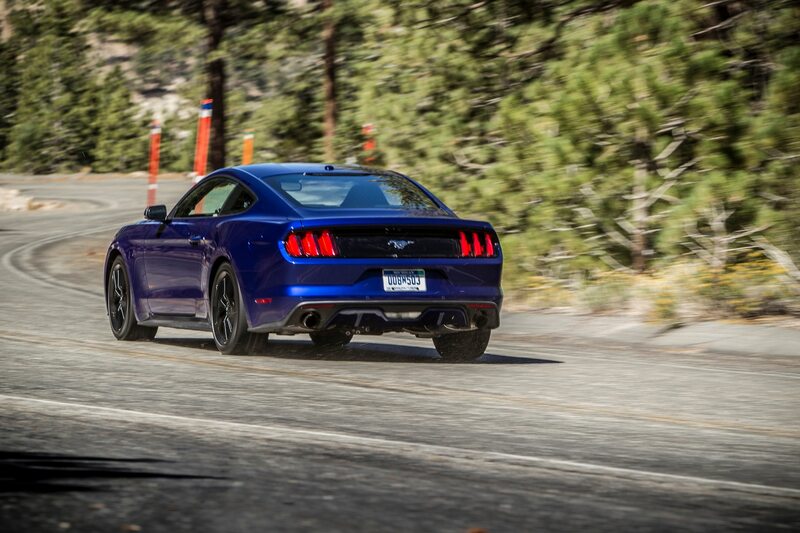 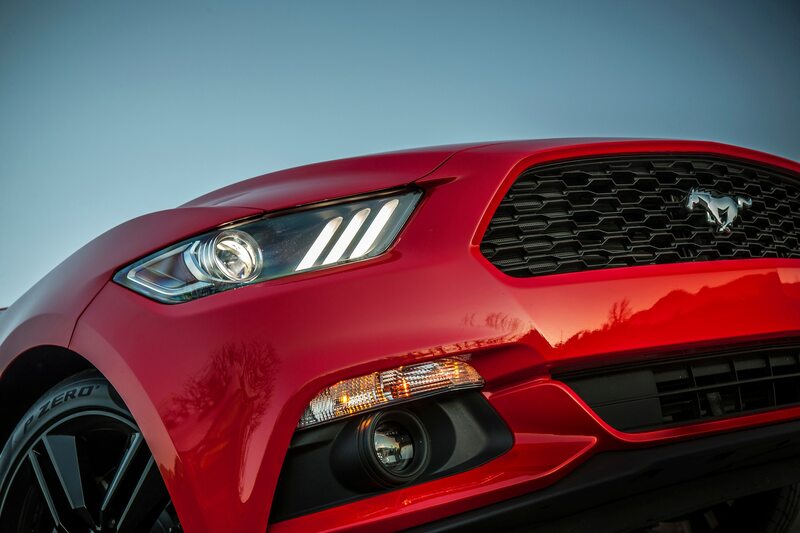 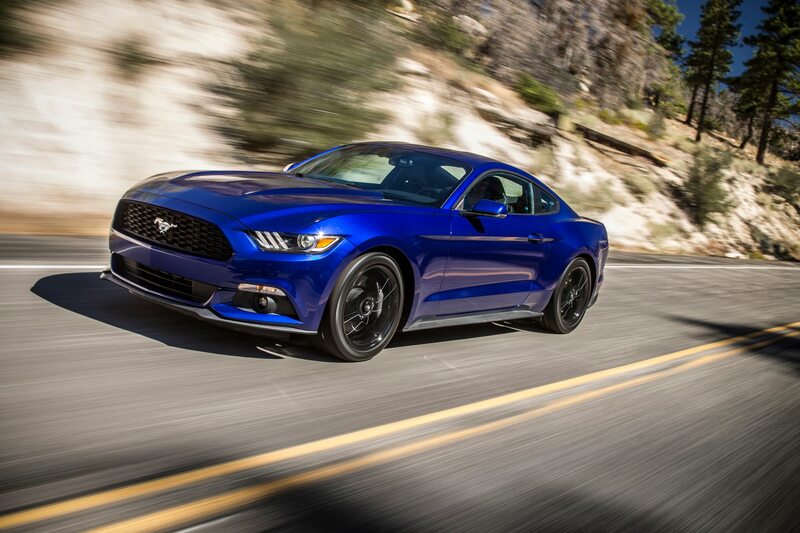 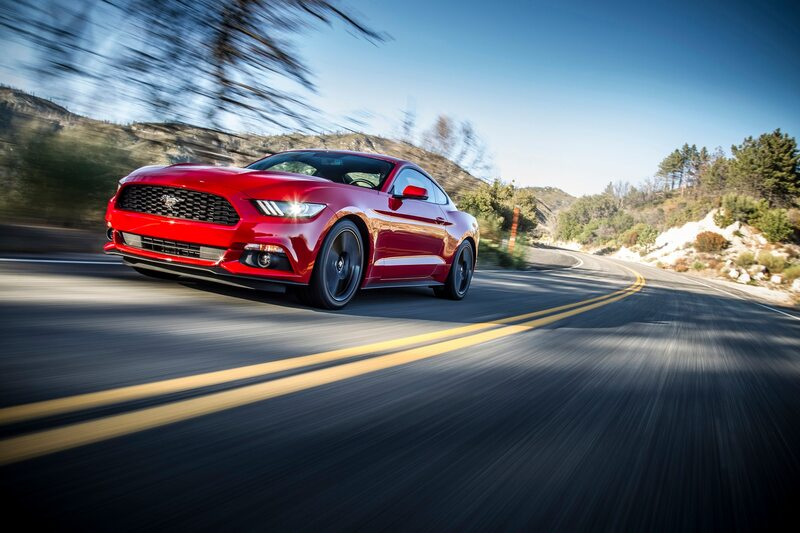 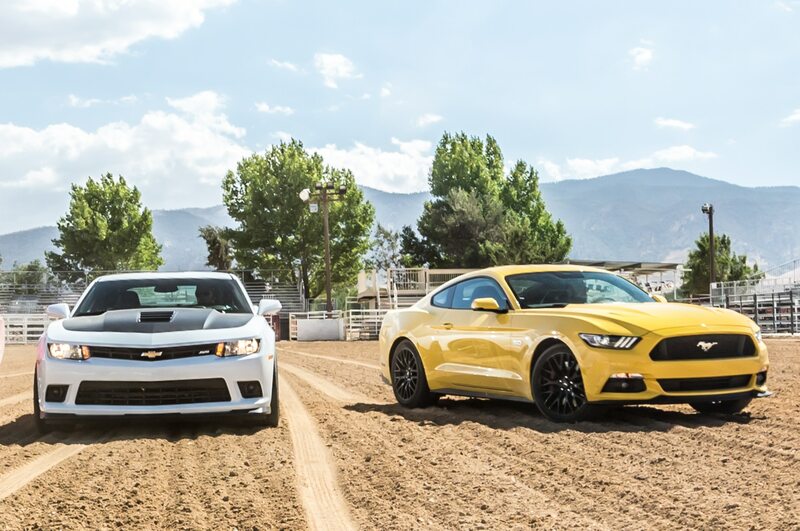 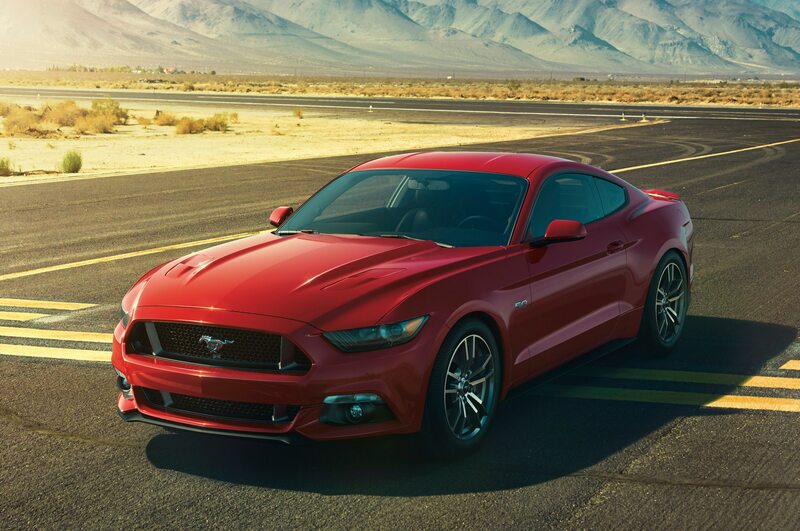 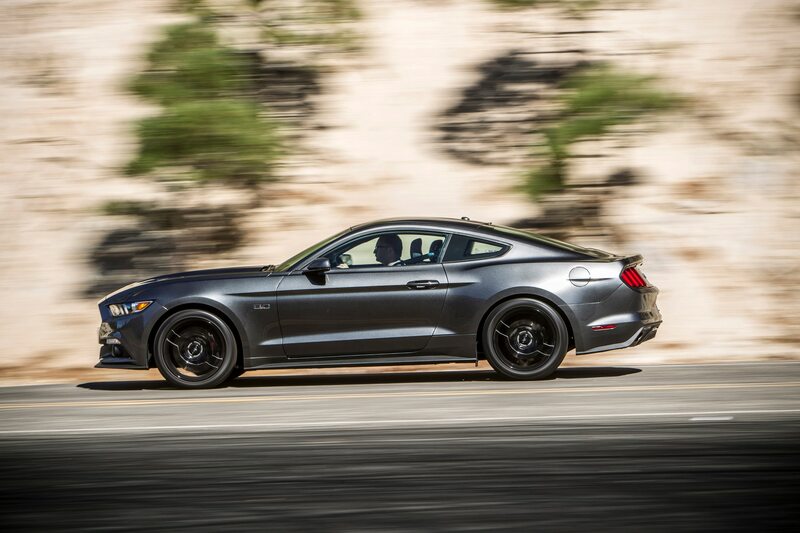 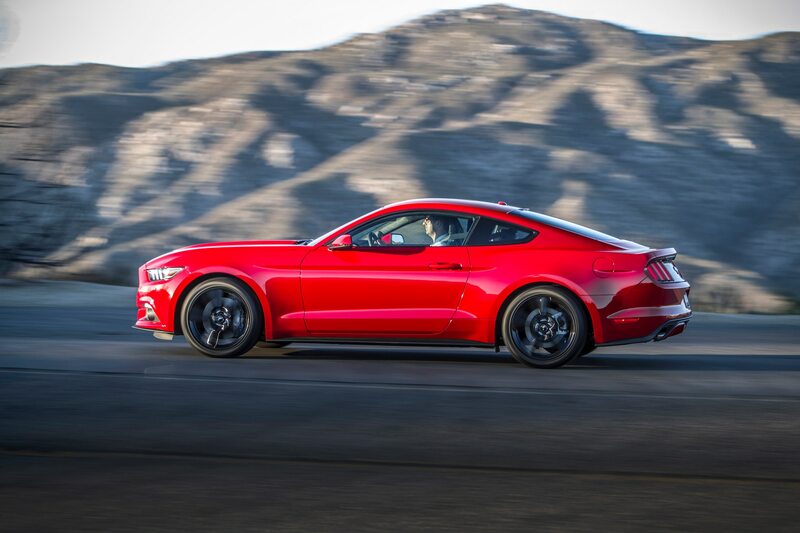 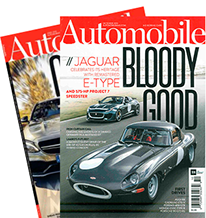 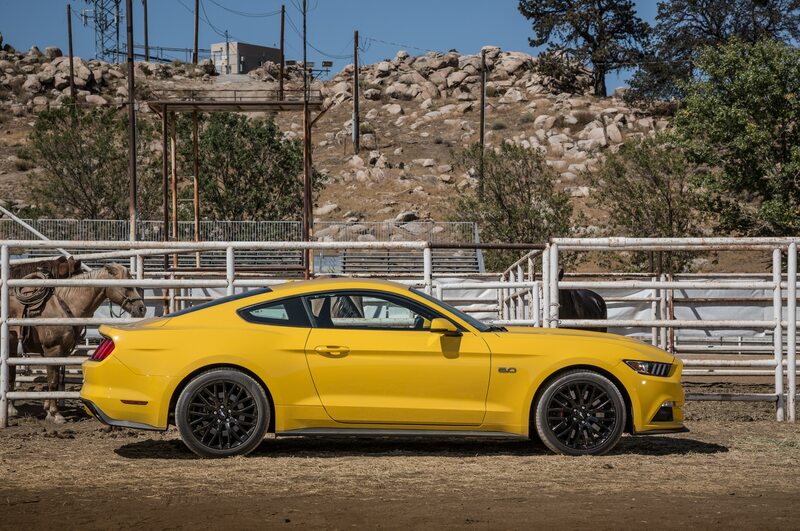 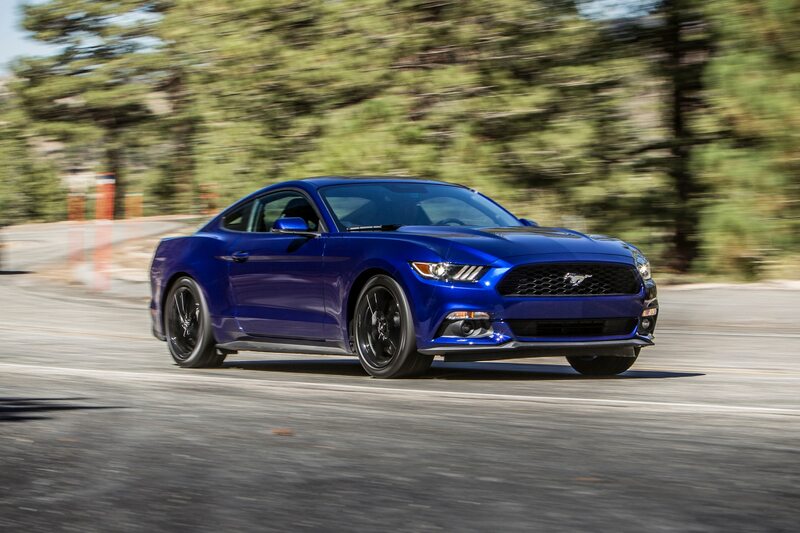 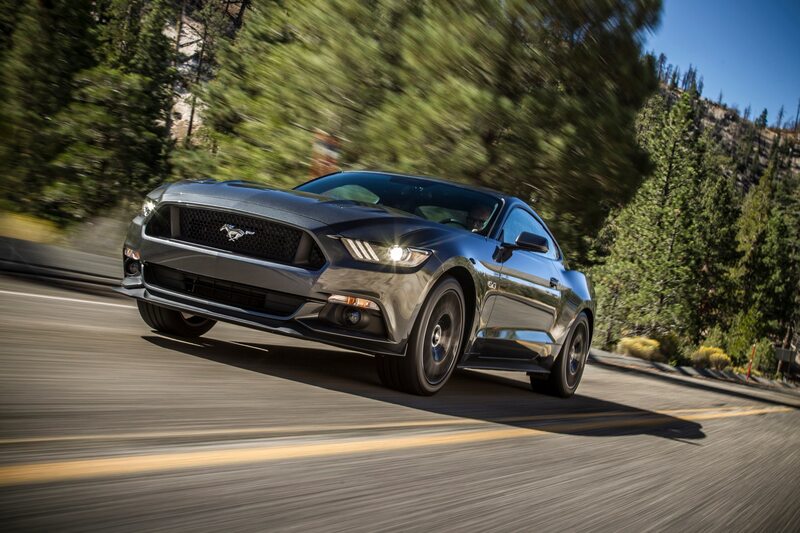 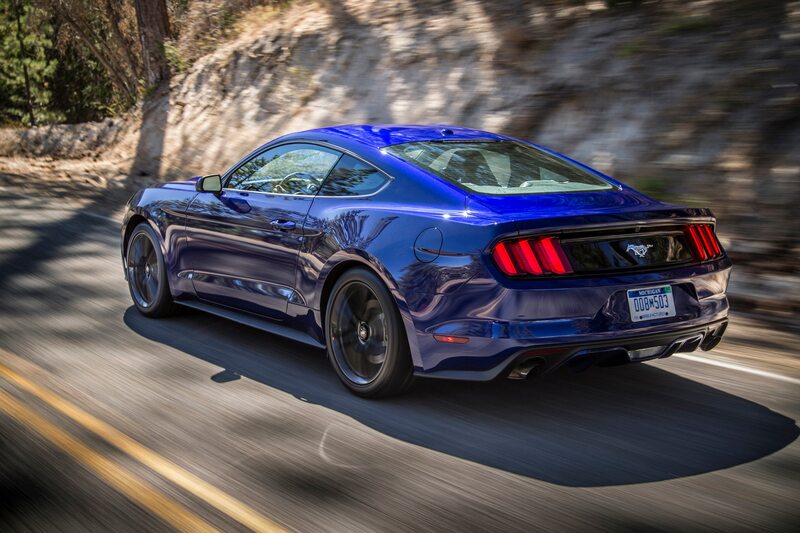 The new 2015 Ford Mustang GT is a formidable car — one of this magazine’s All-Stars. 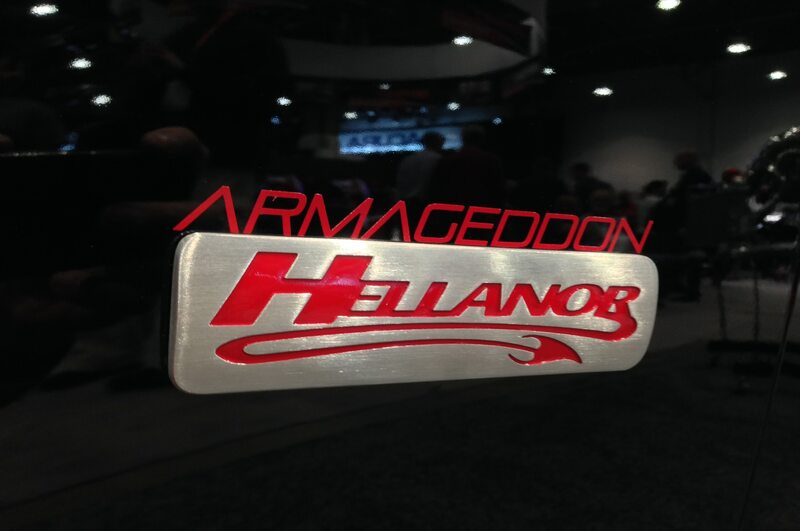 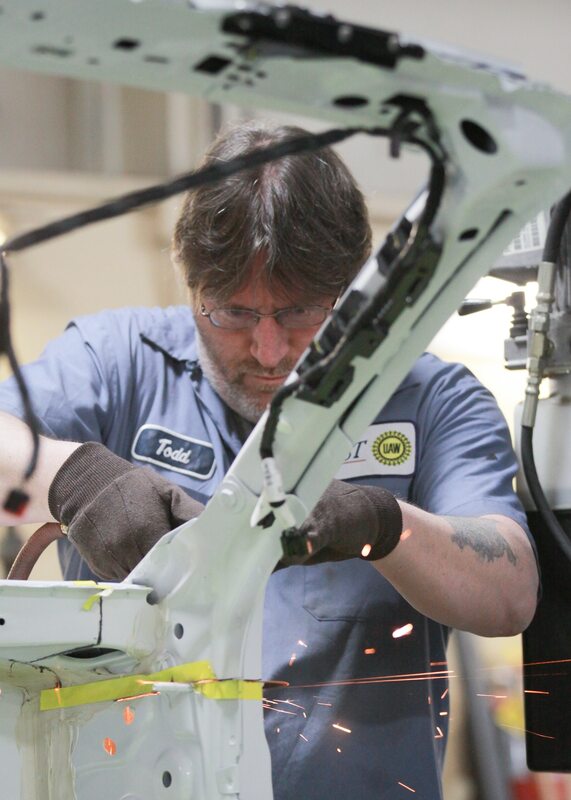 Improving upon it might seem a foreboding challenge for a relatively small aftermarket company. 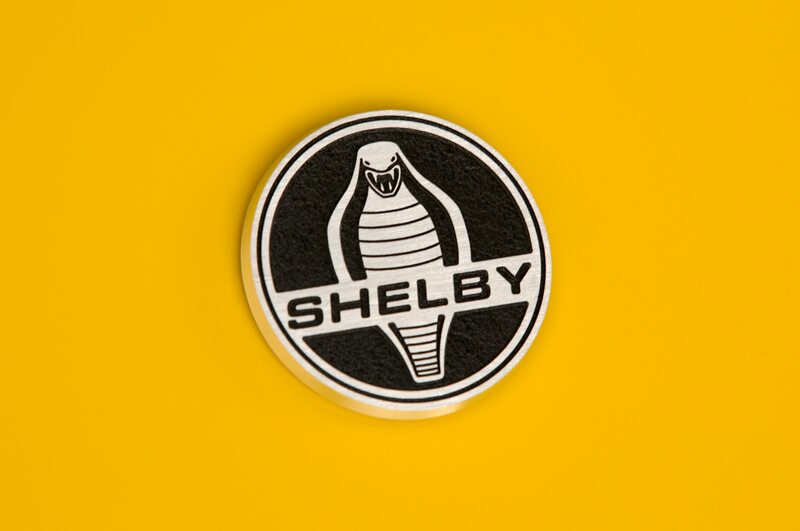 Shelby doesn’t see it that way. 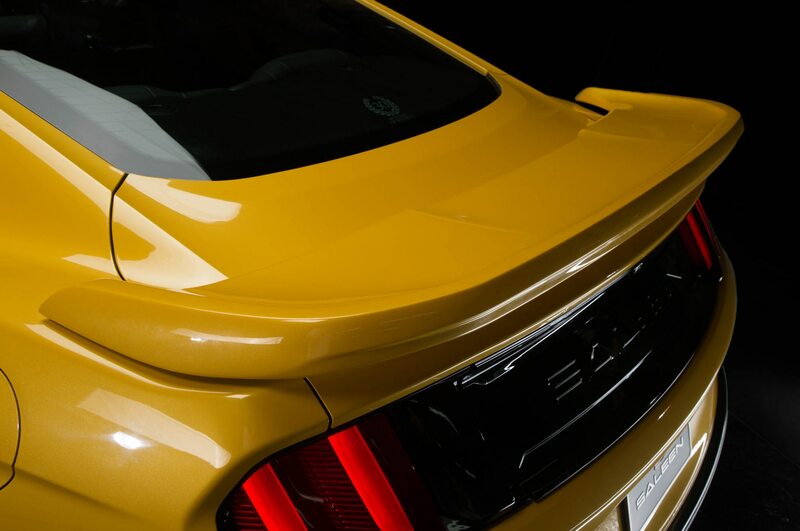 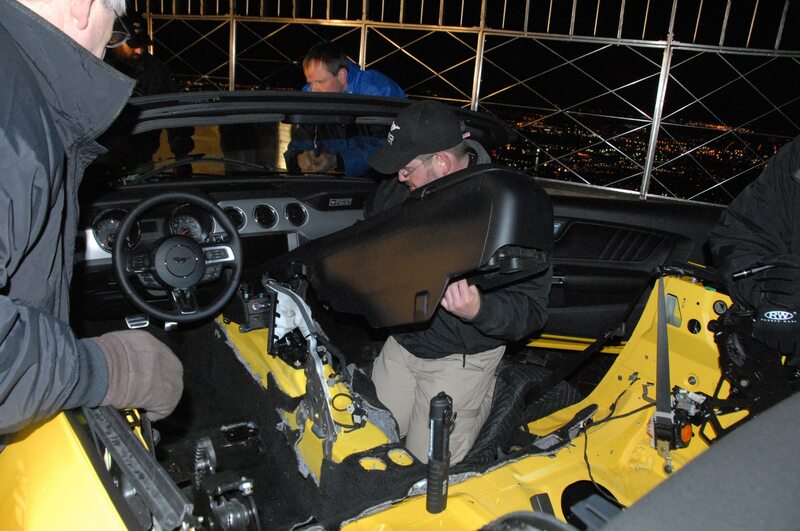 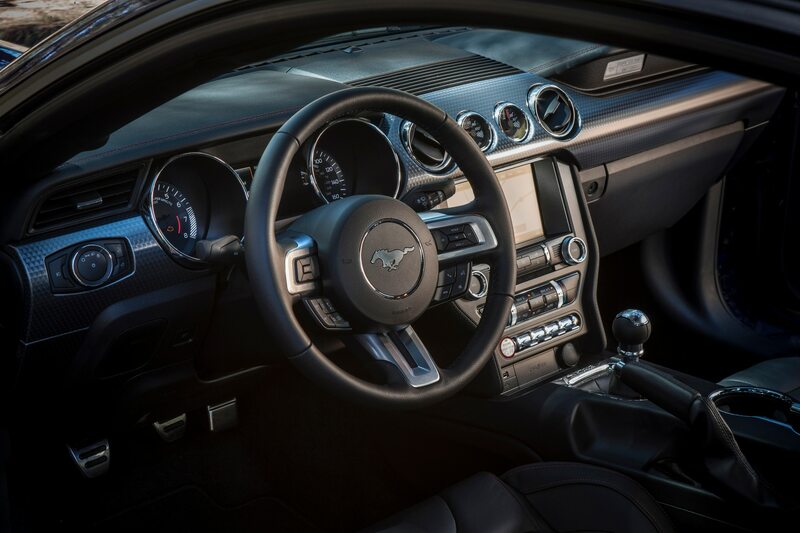 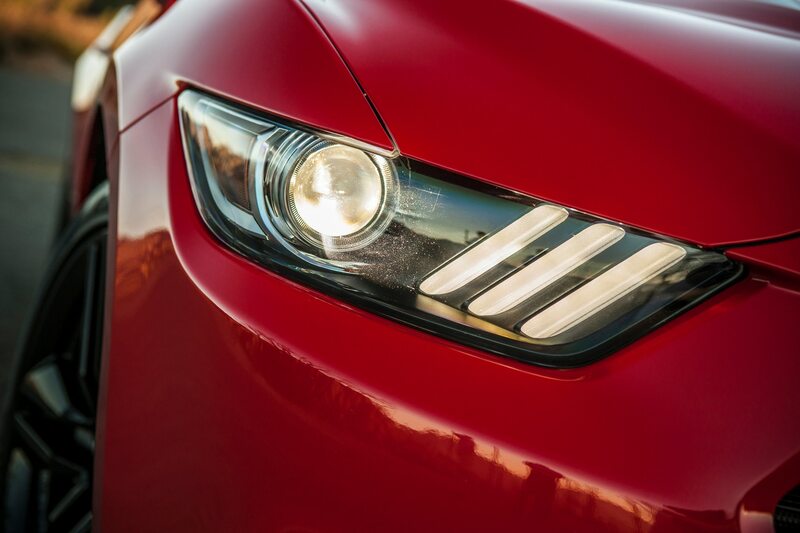 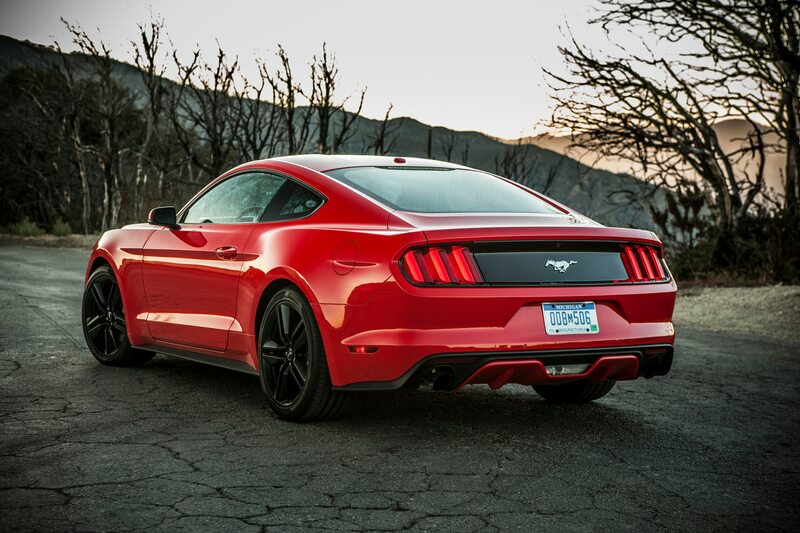 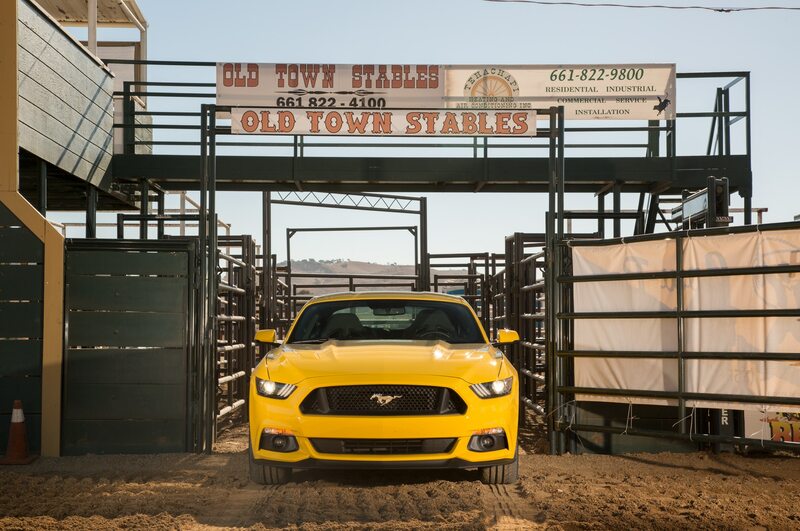 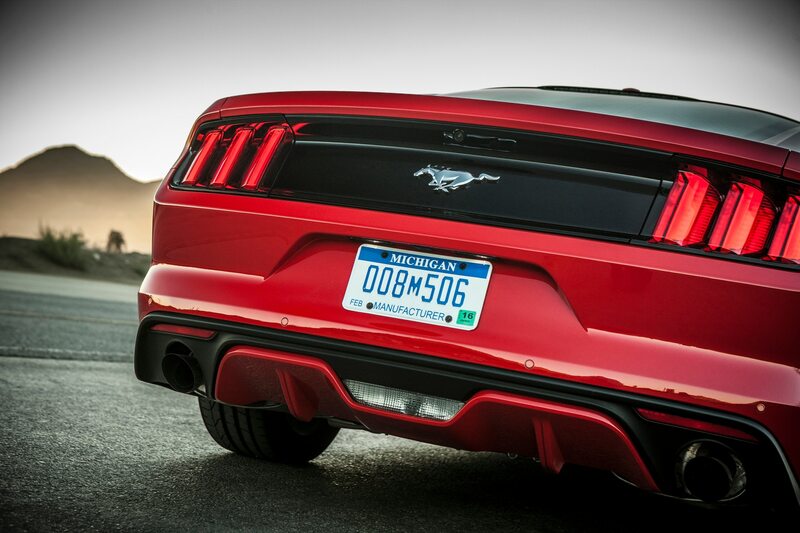 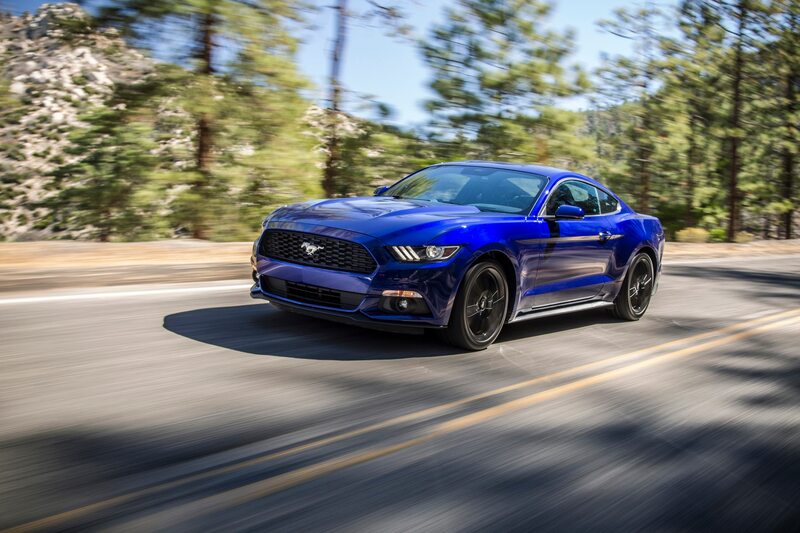 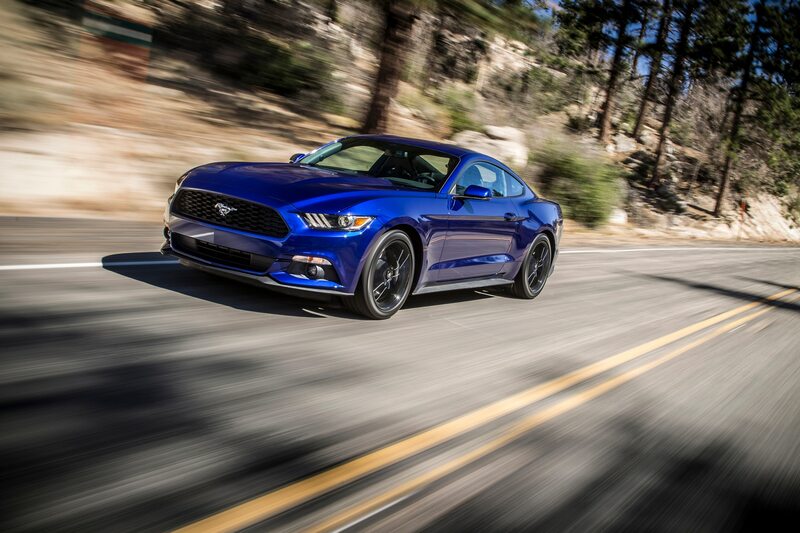 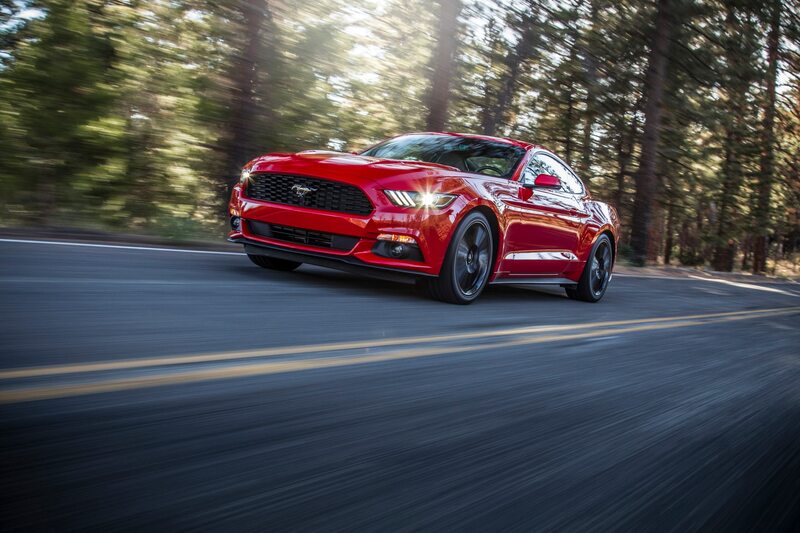 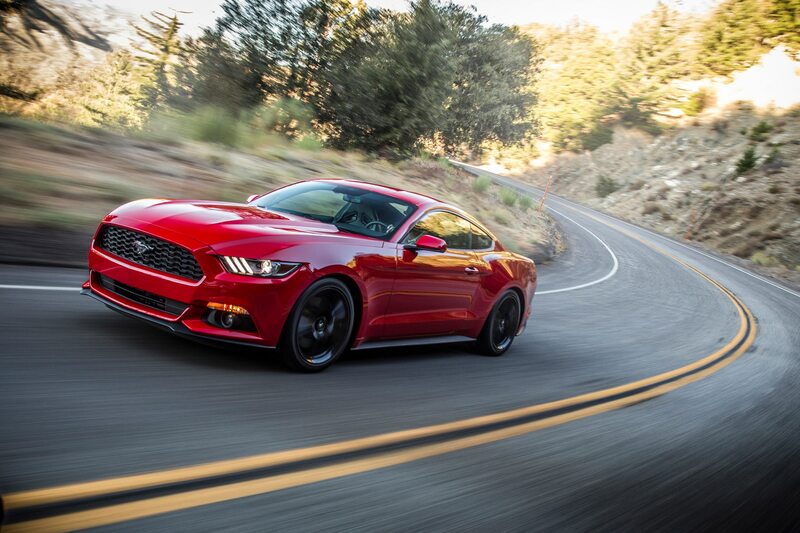 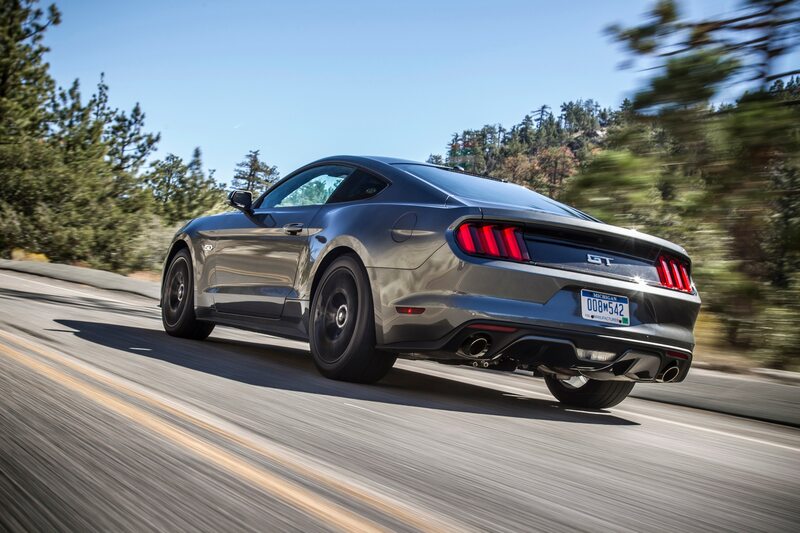 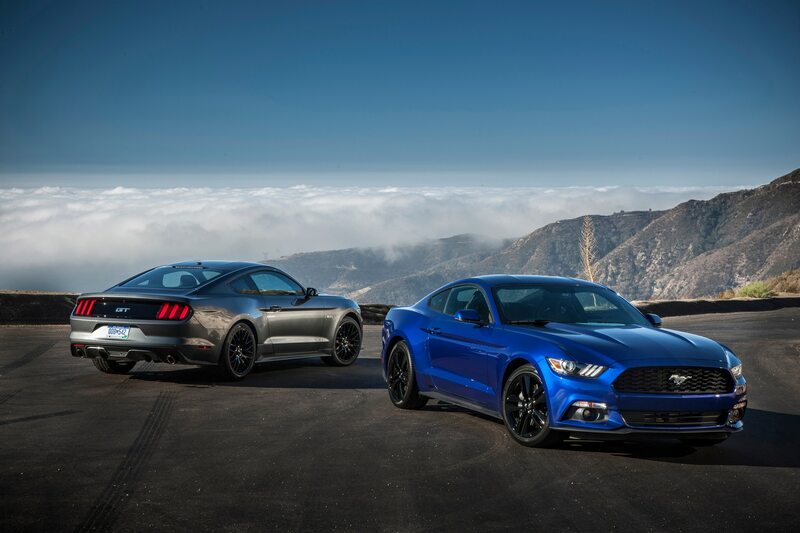 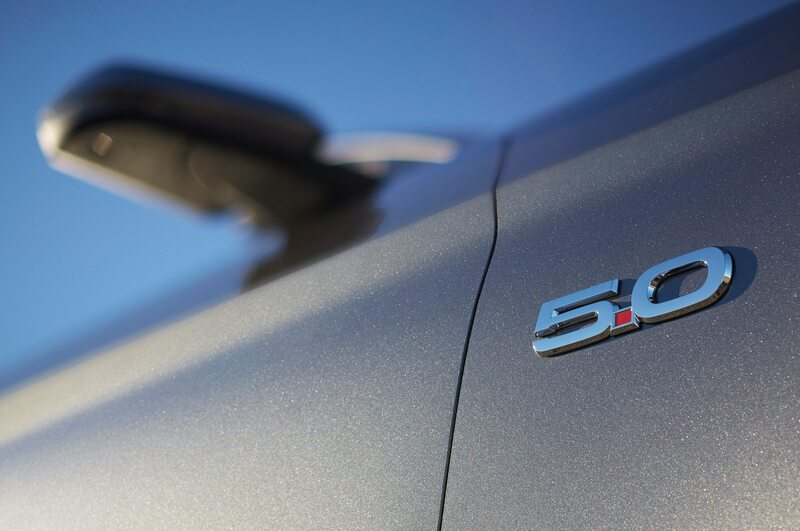 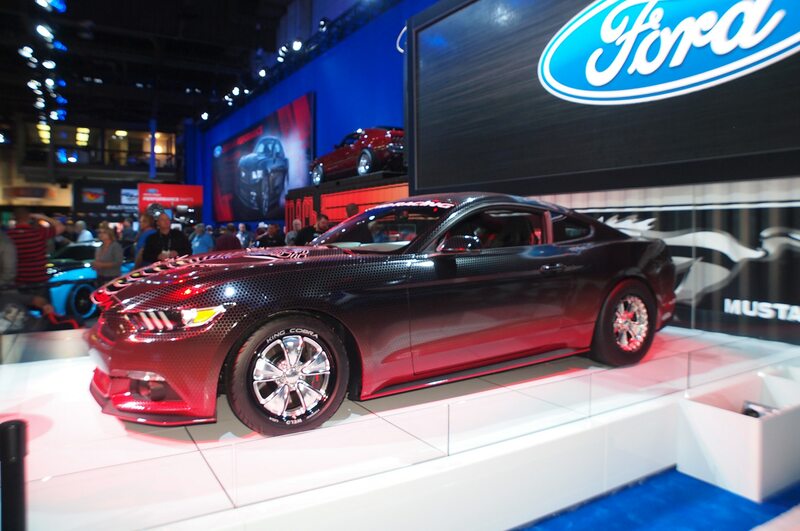 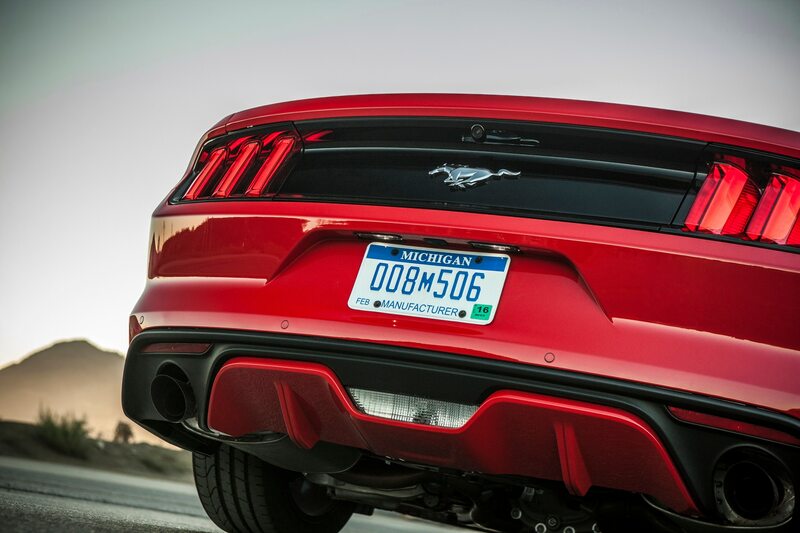 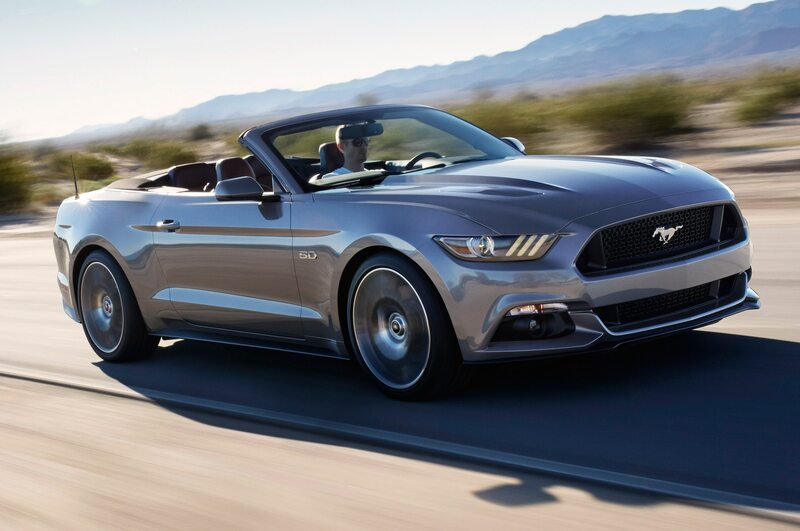 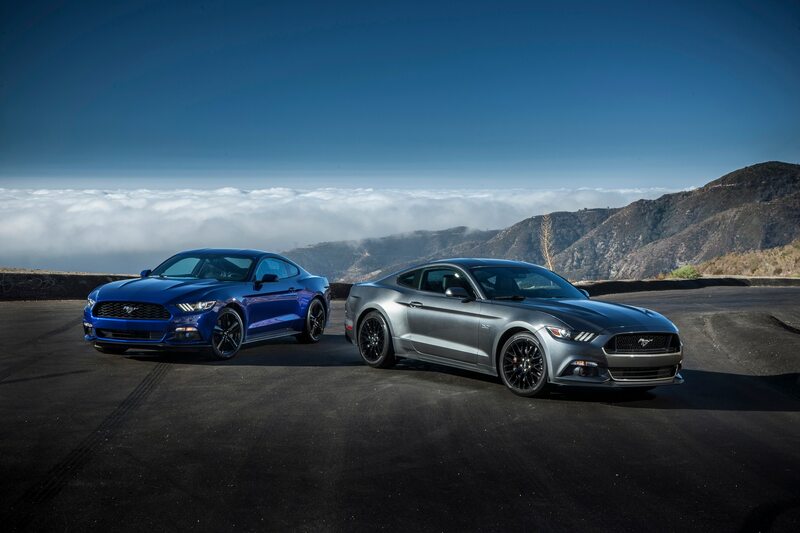 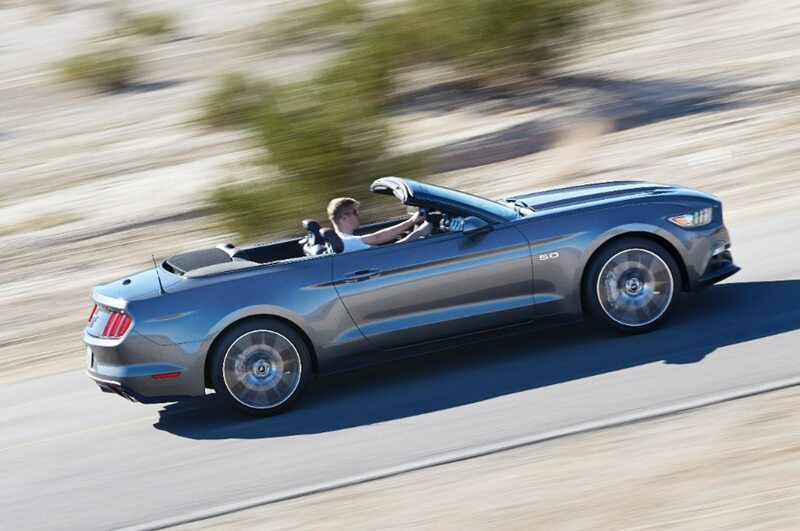 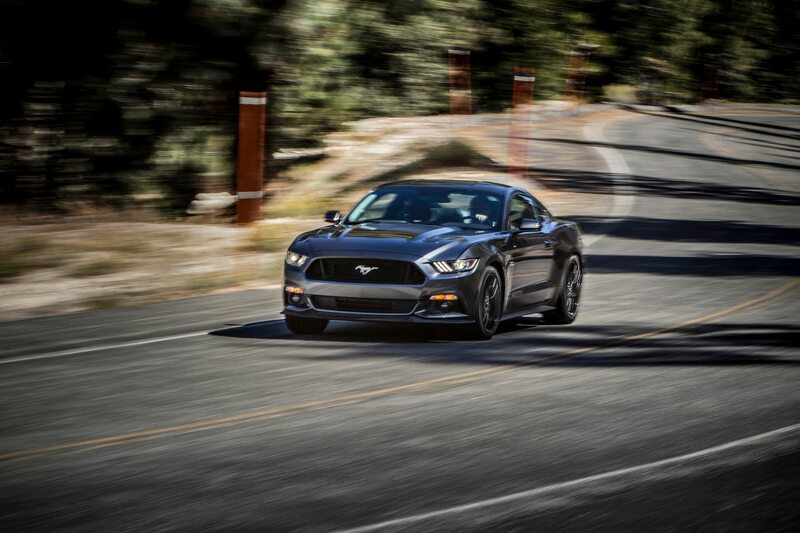 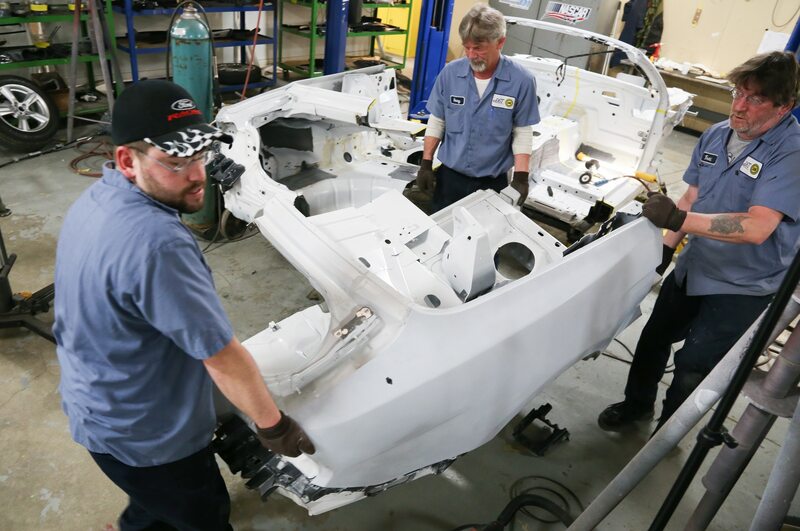 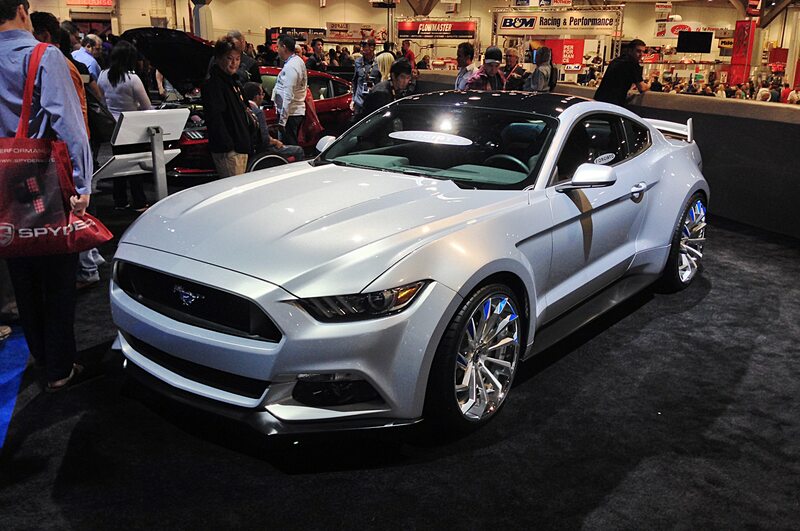 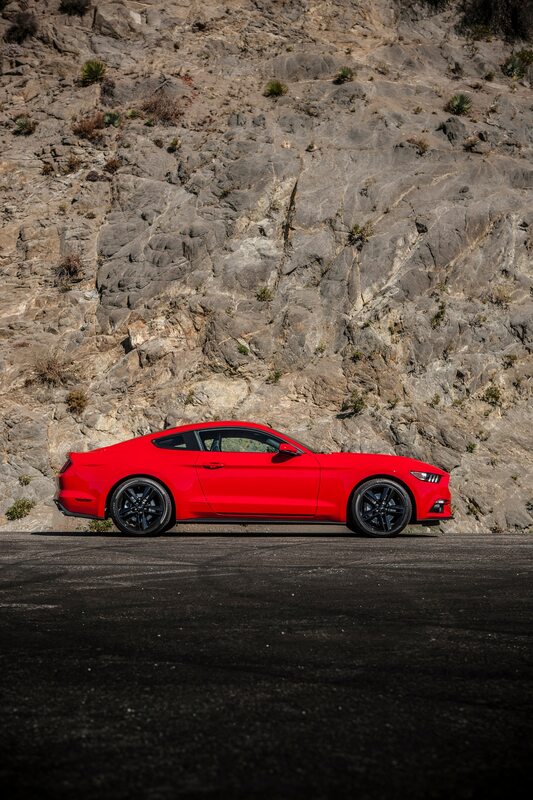 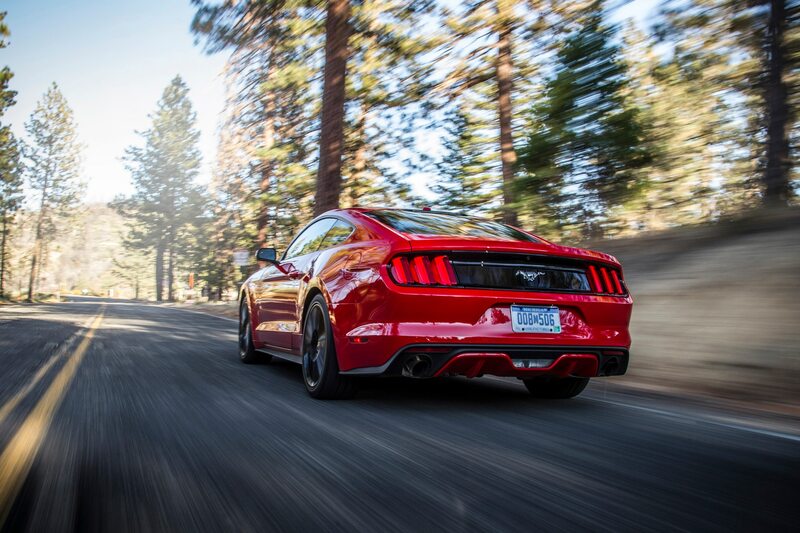 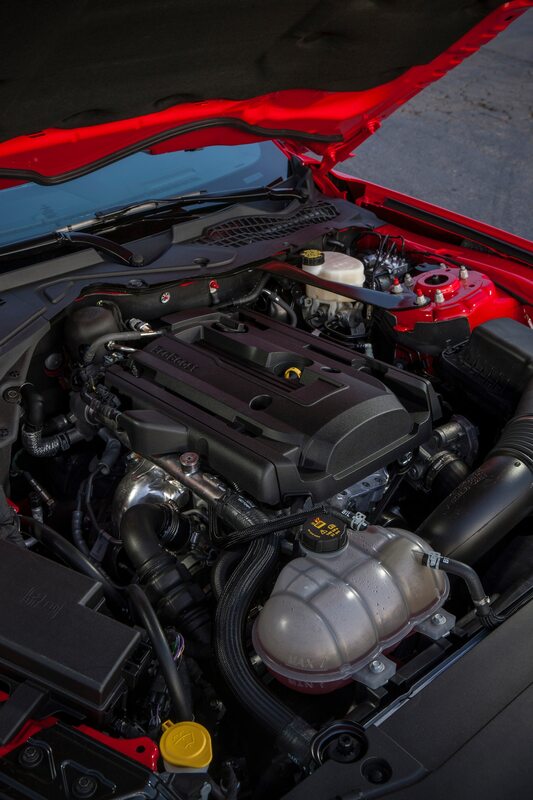 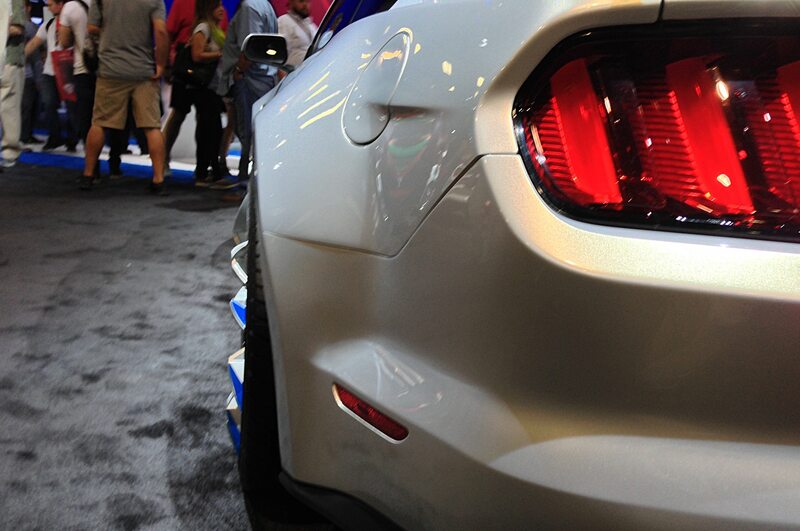 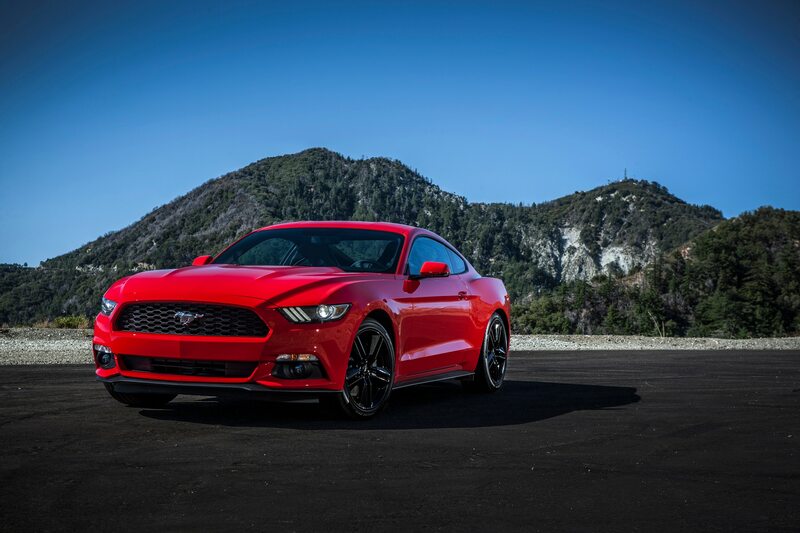 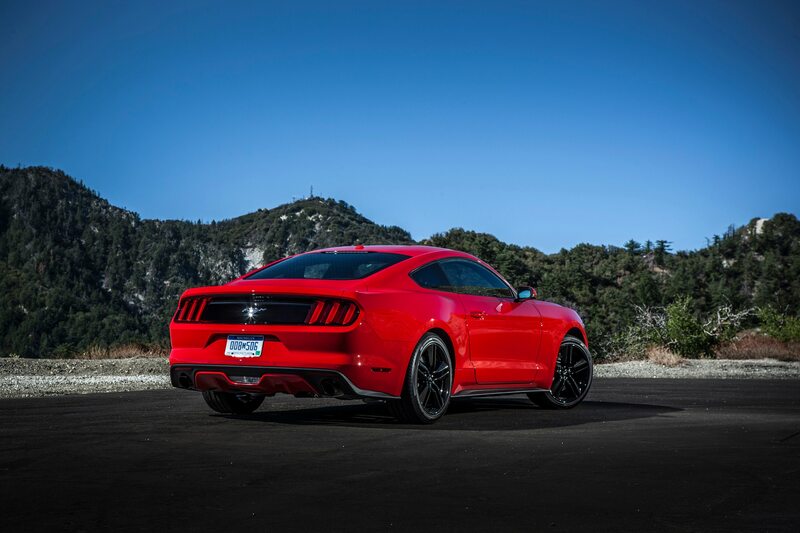 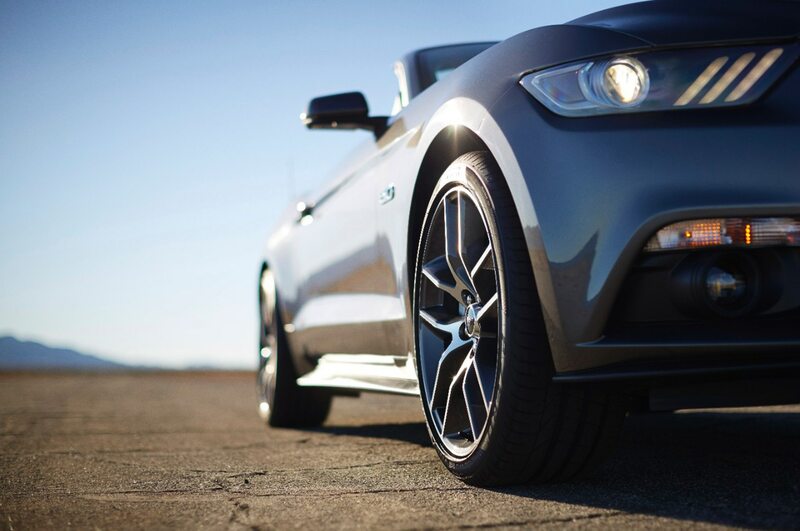 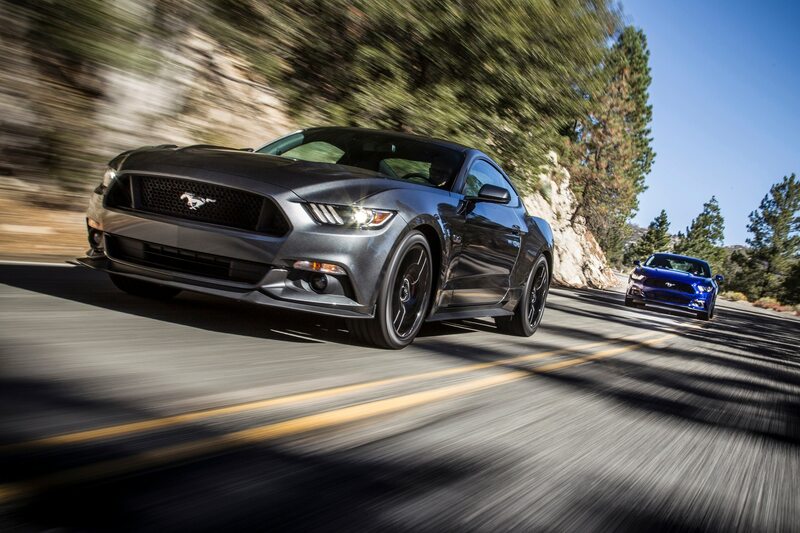 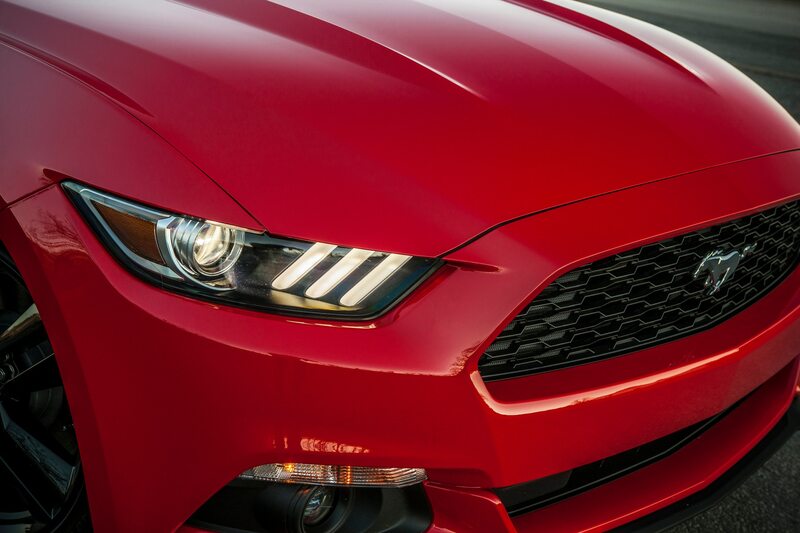 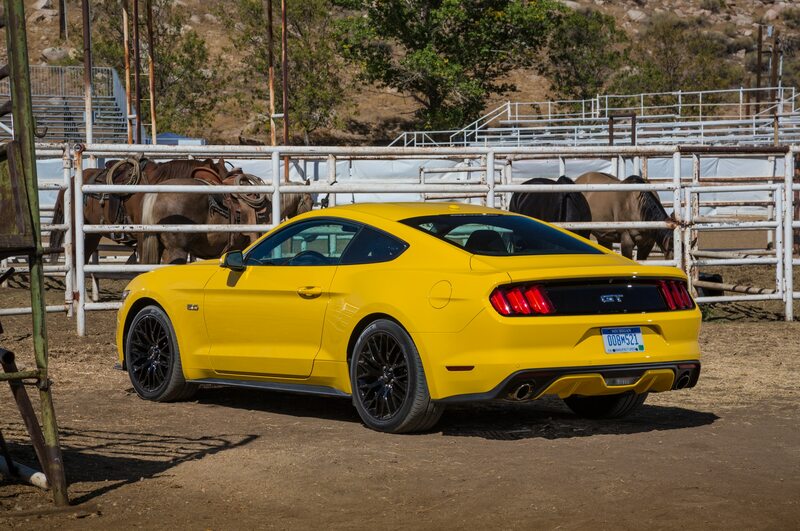 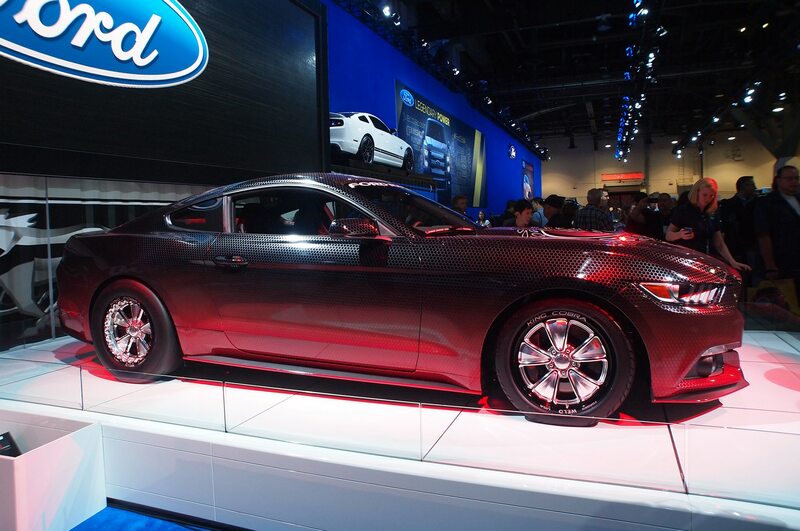 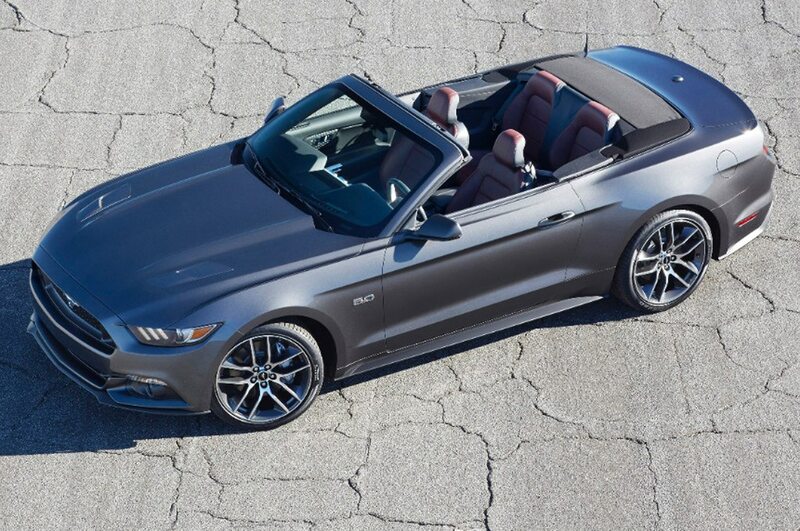 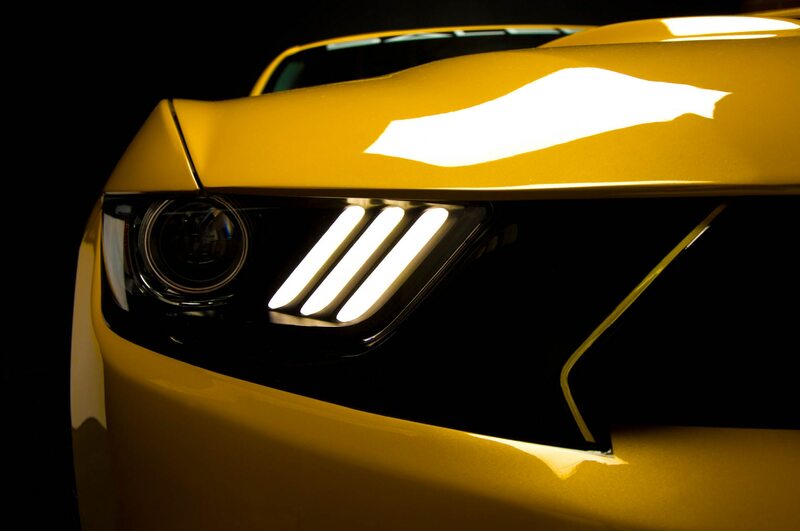 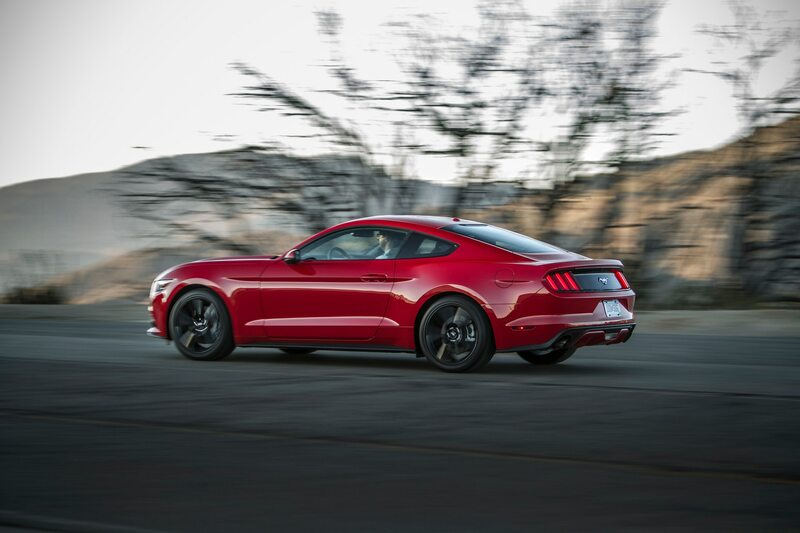 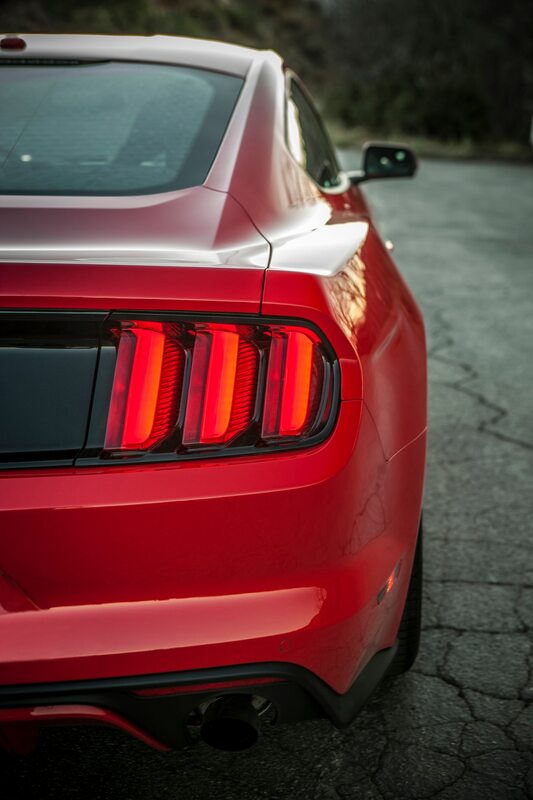 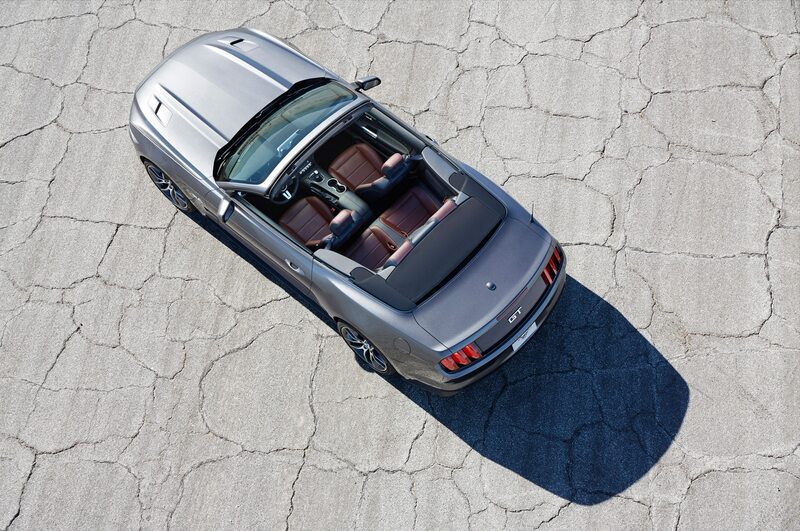 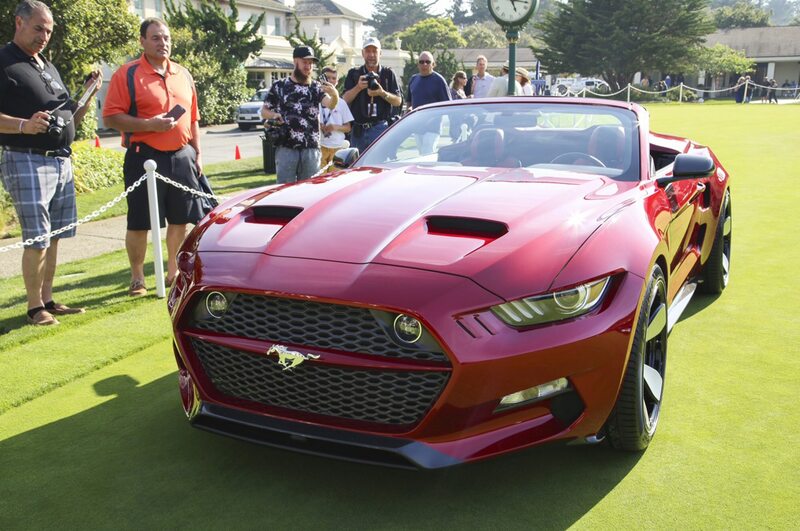 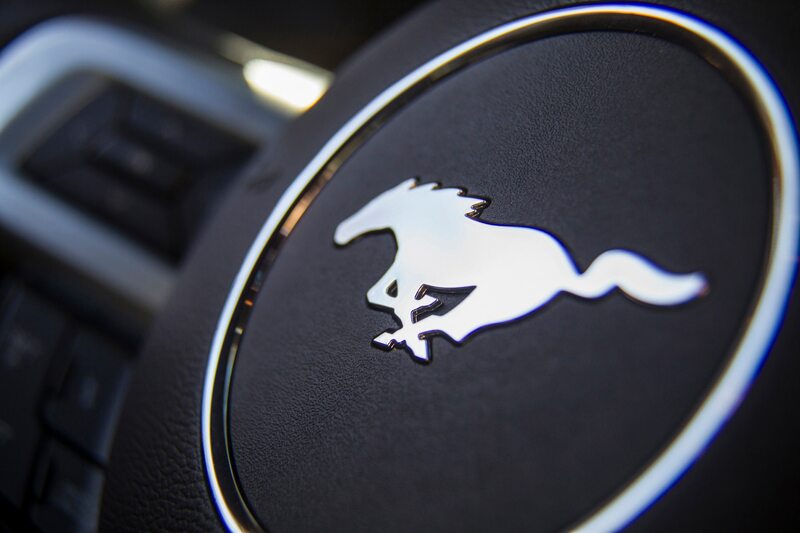 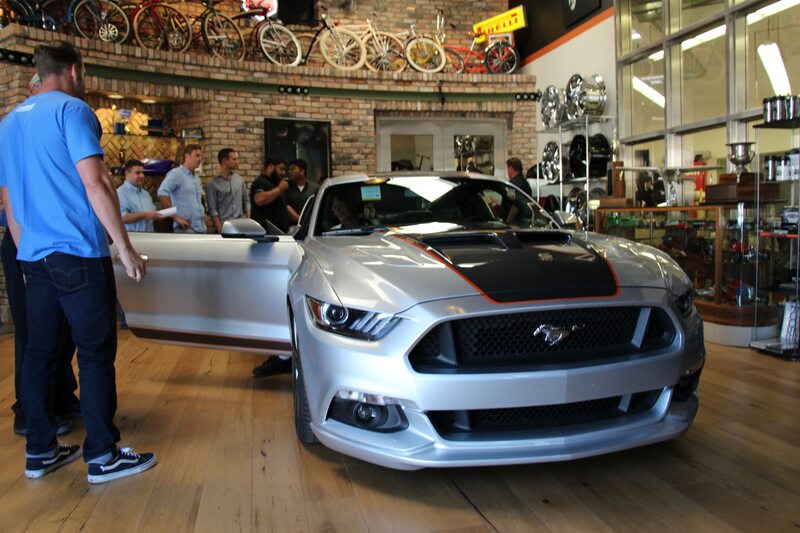 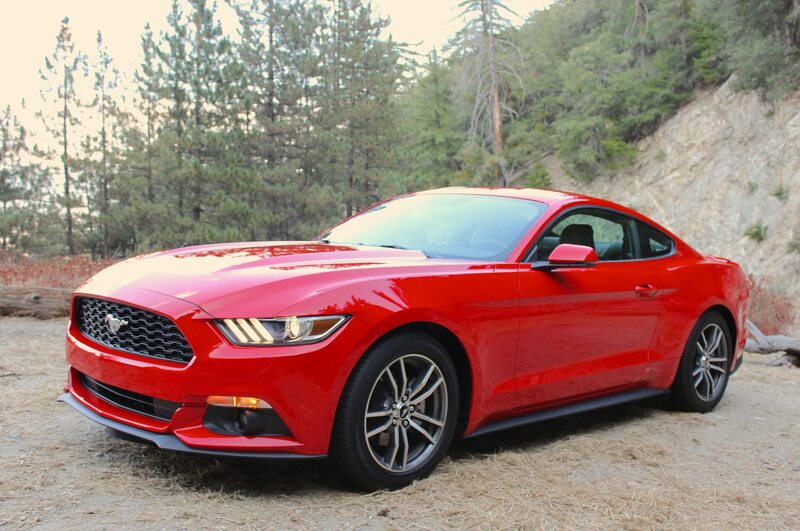 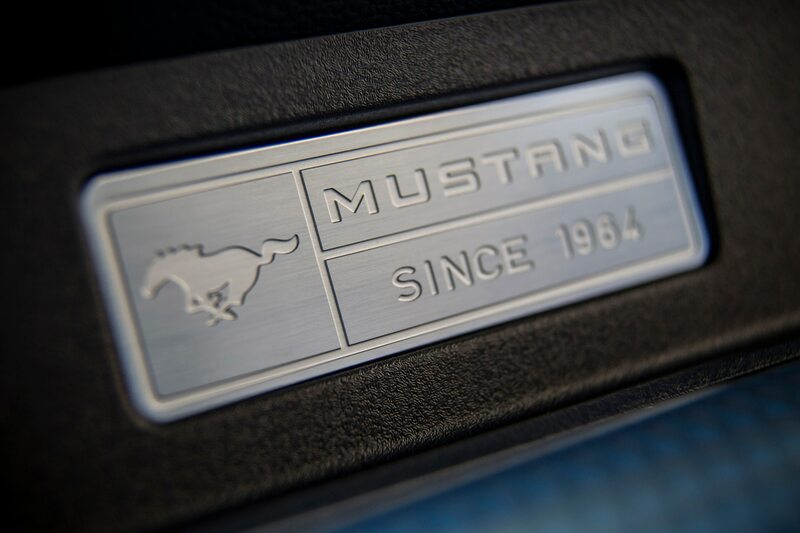 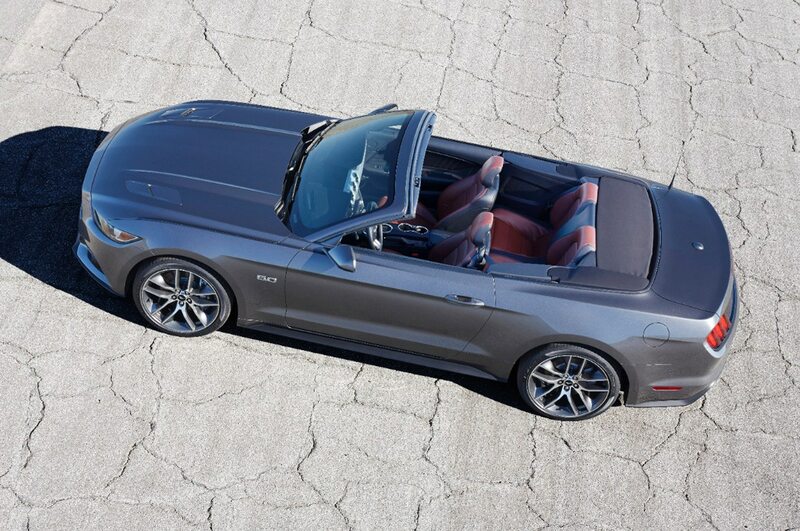 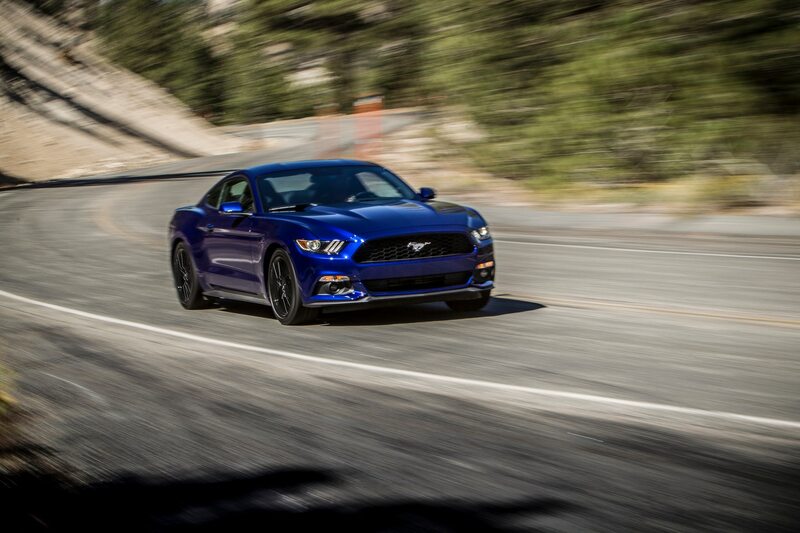 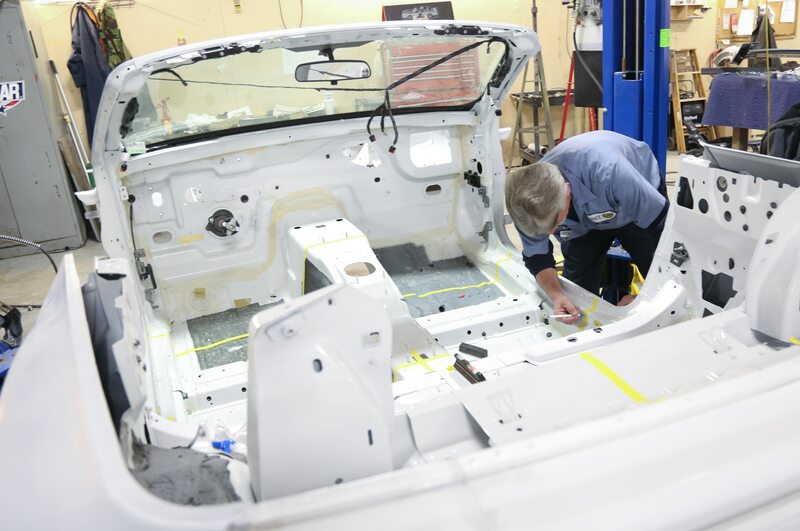 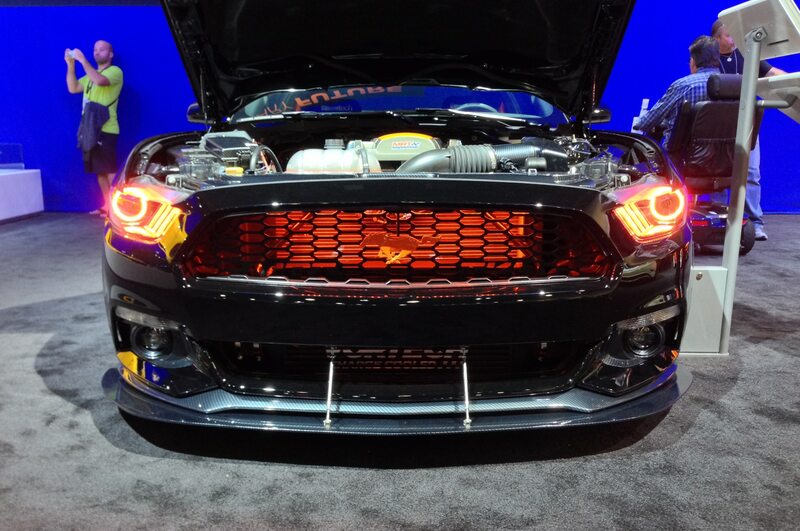 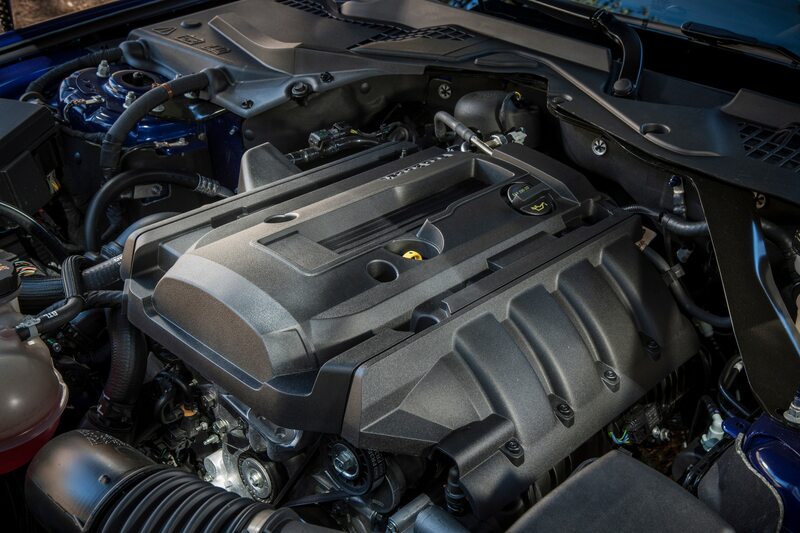 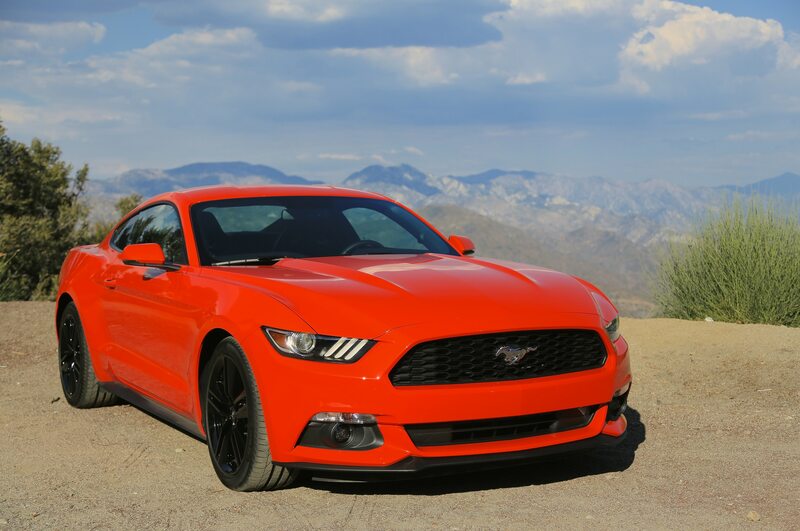 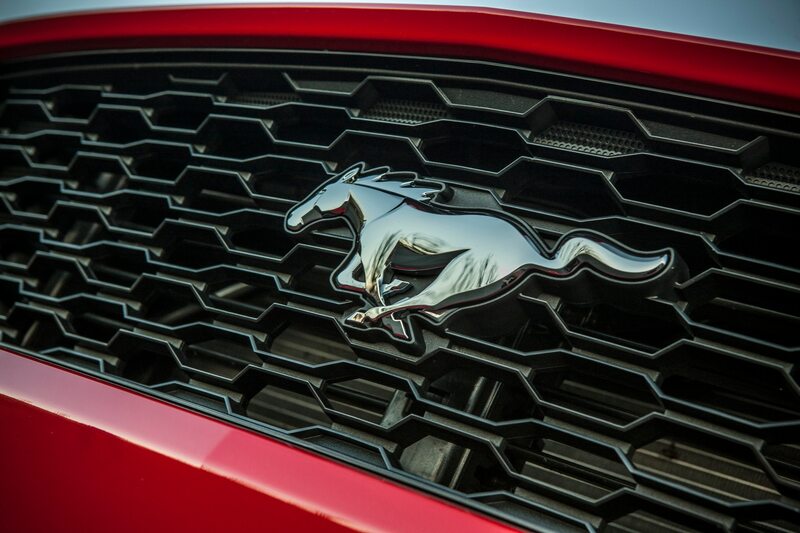 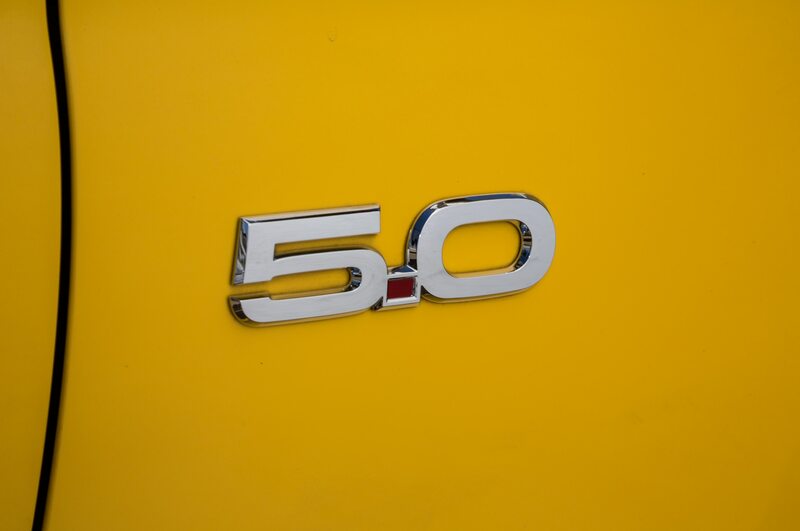 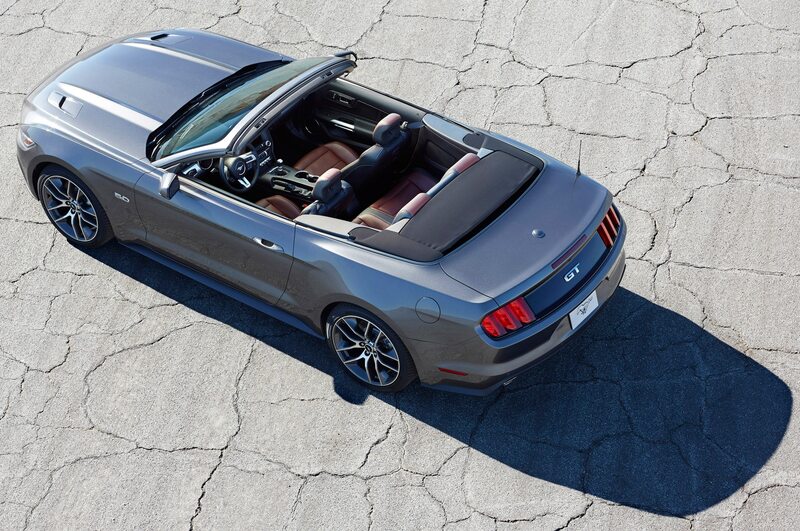 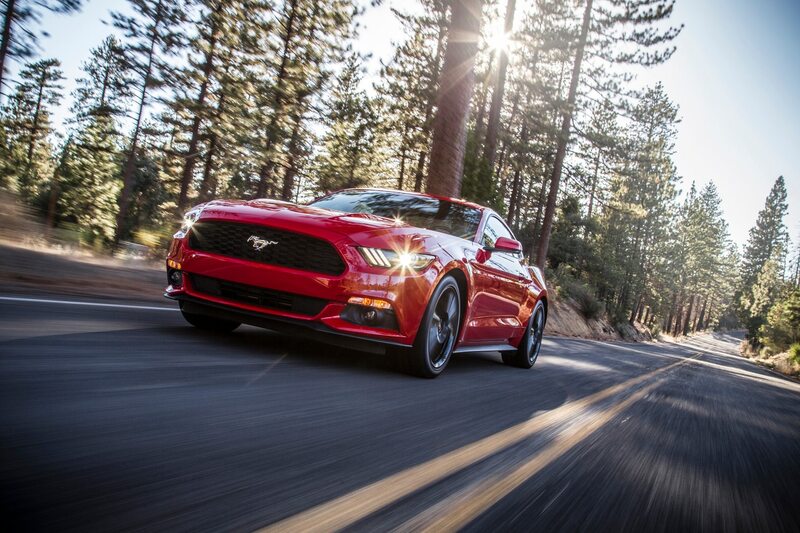 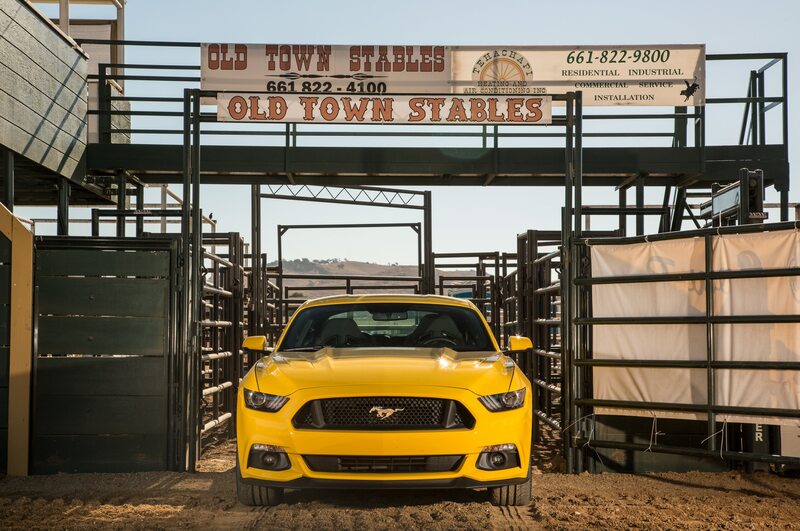 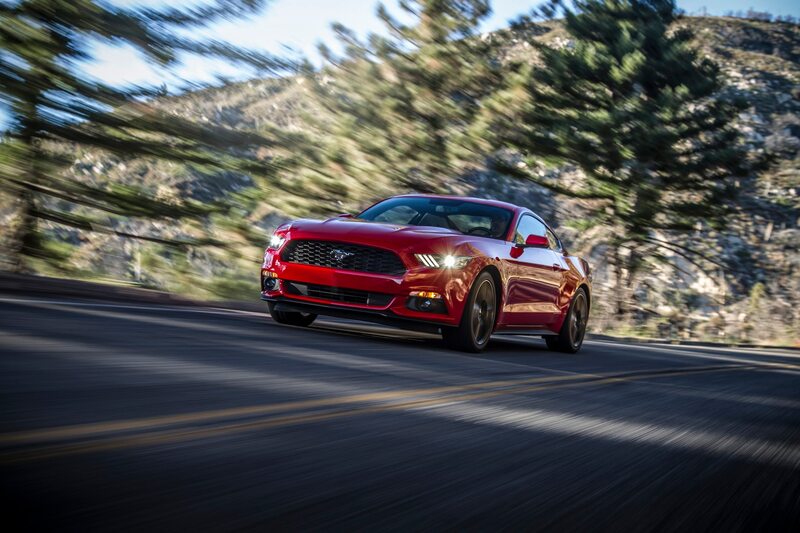 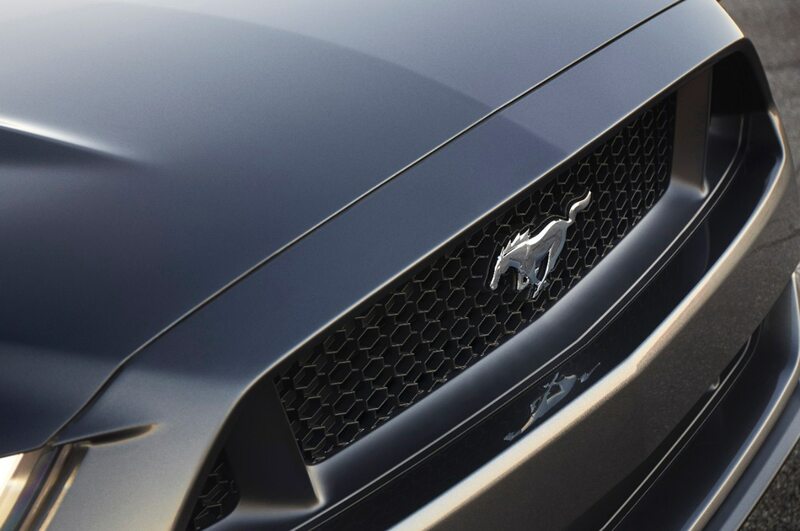 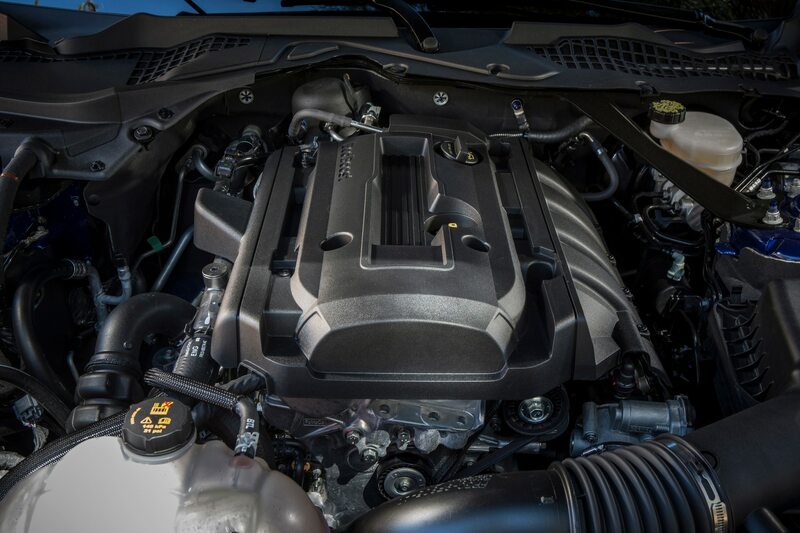 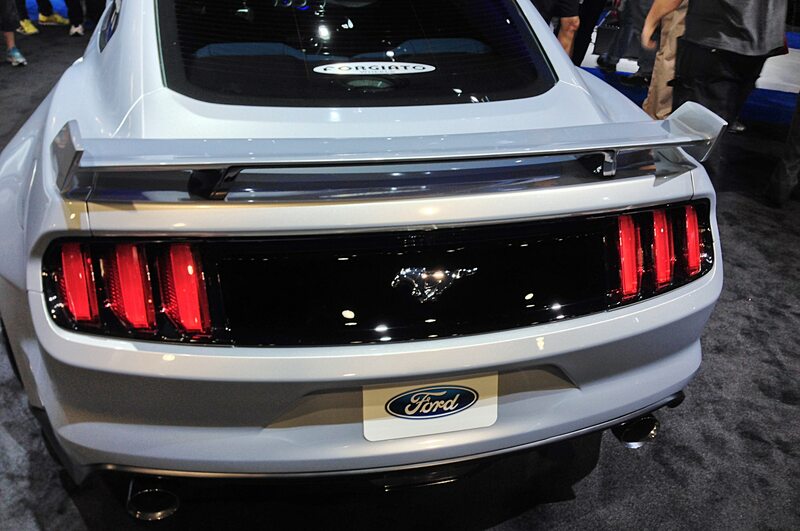 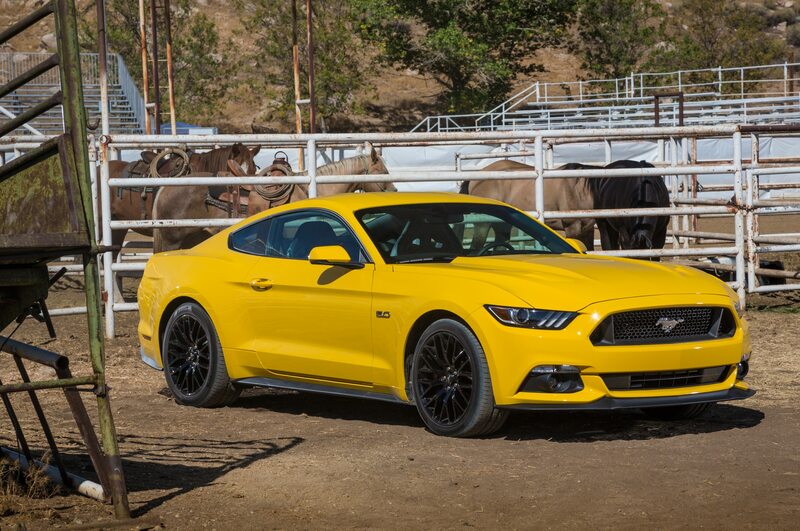 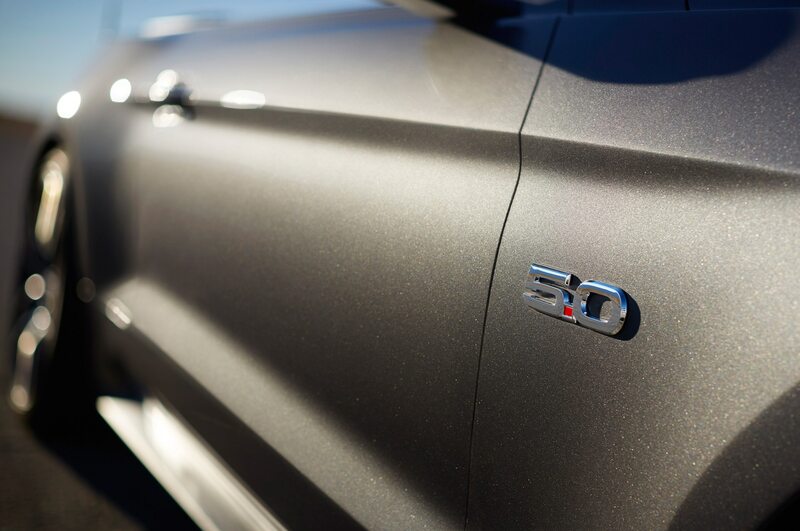 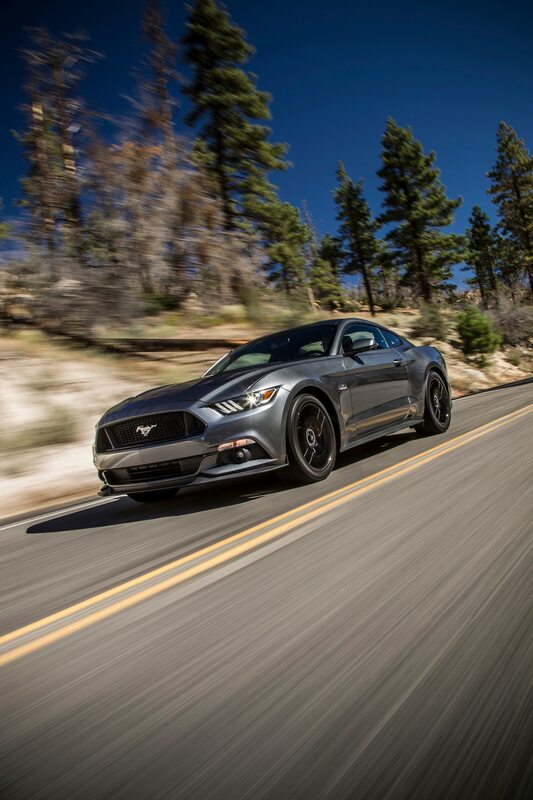 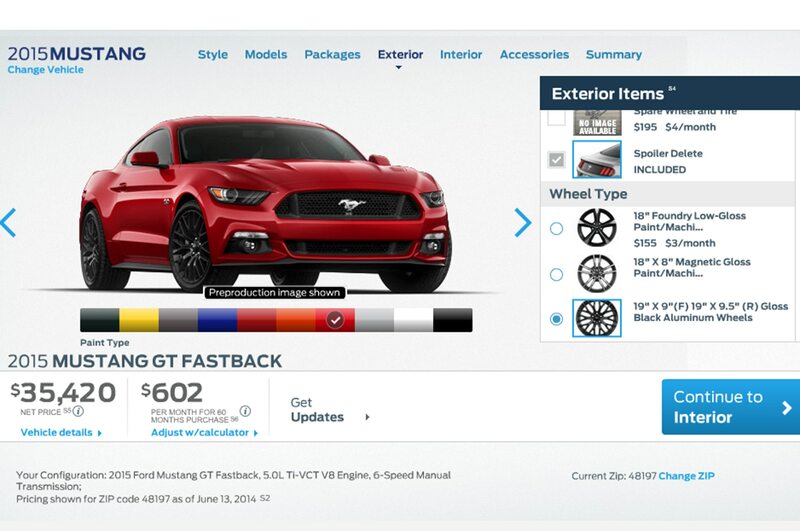 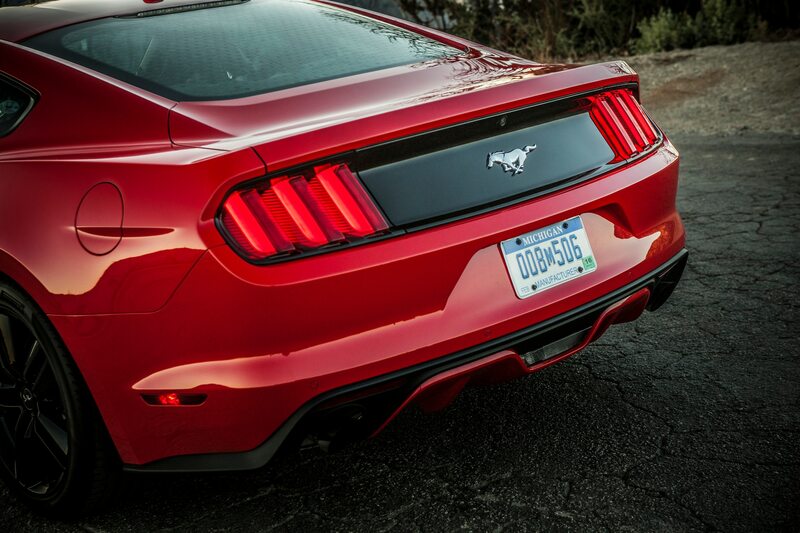 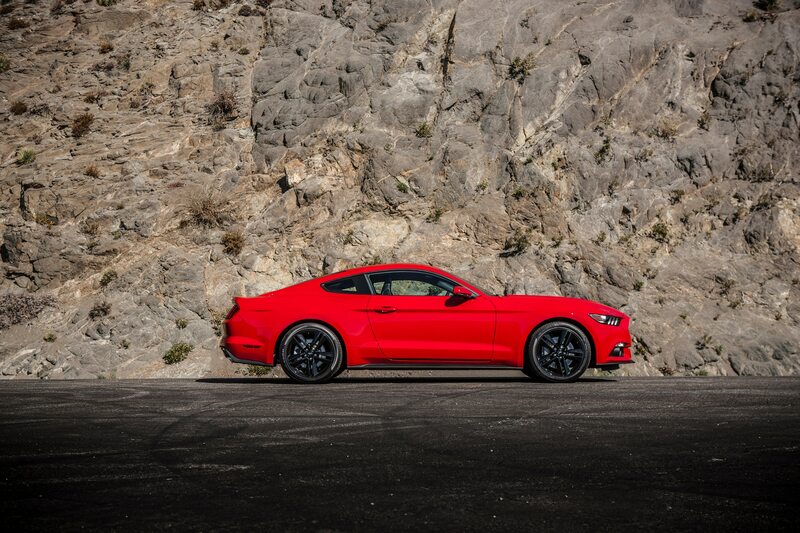 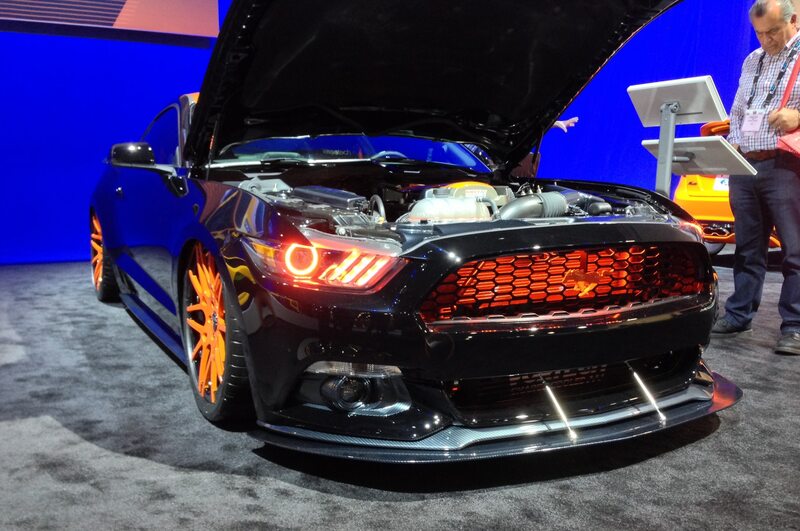 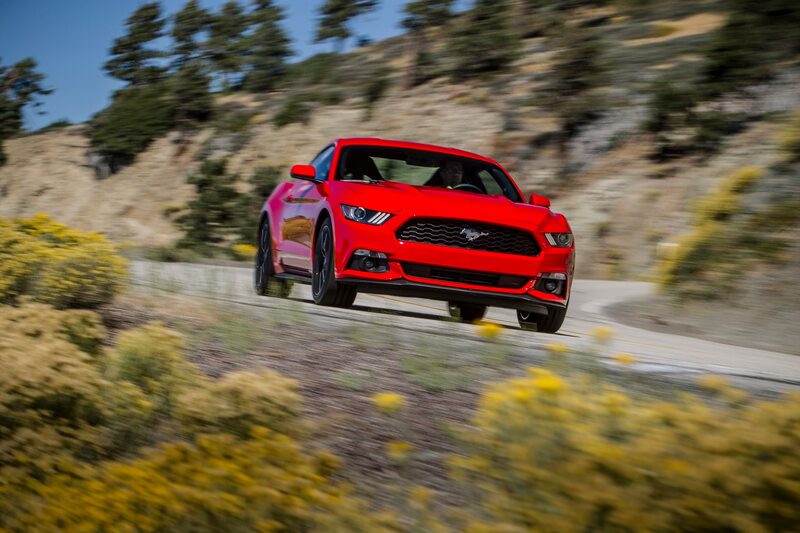 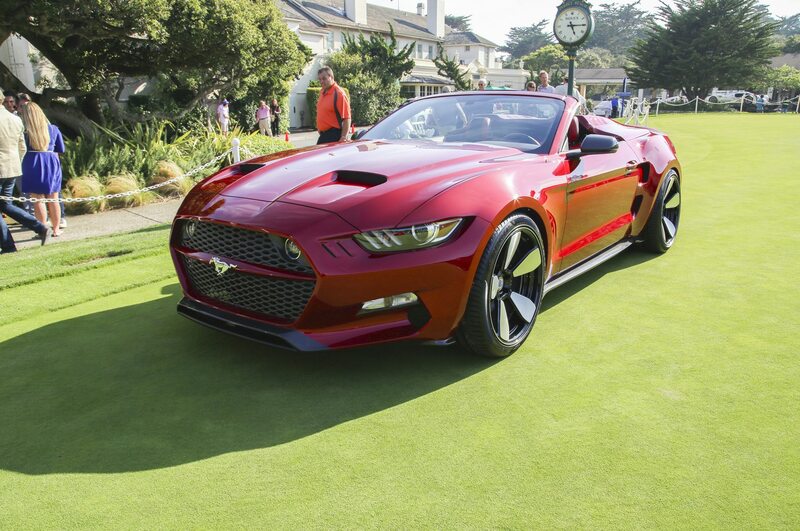 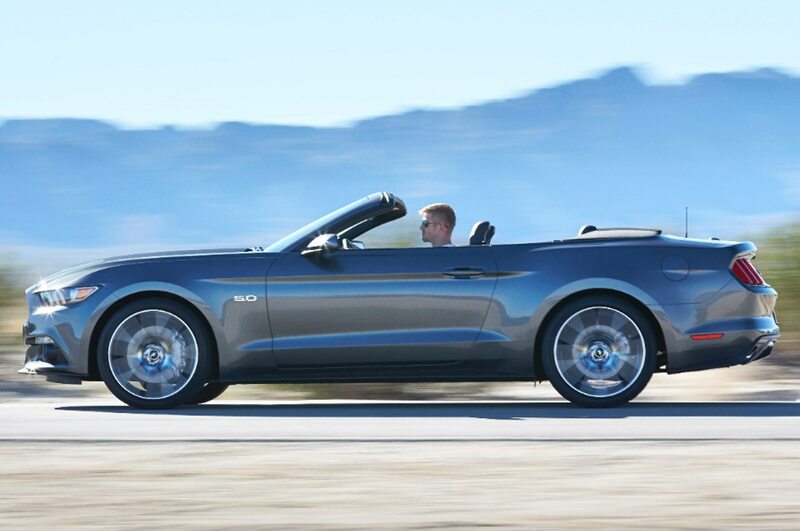 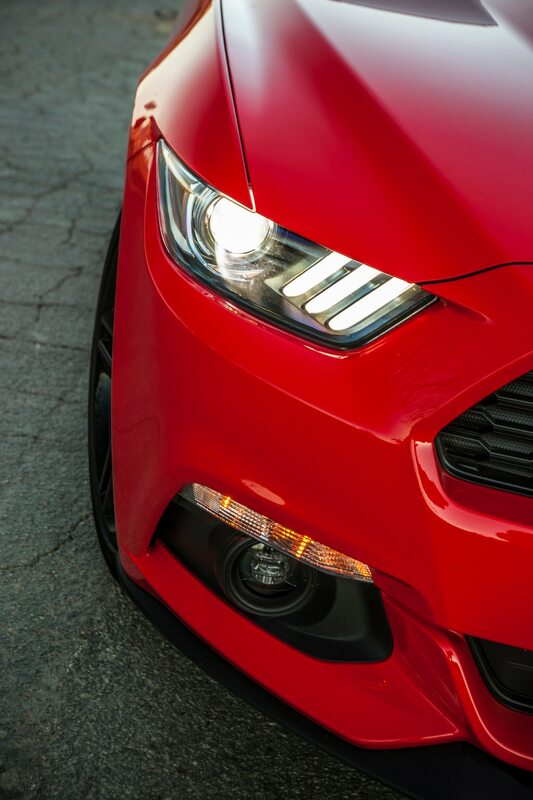 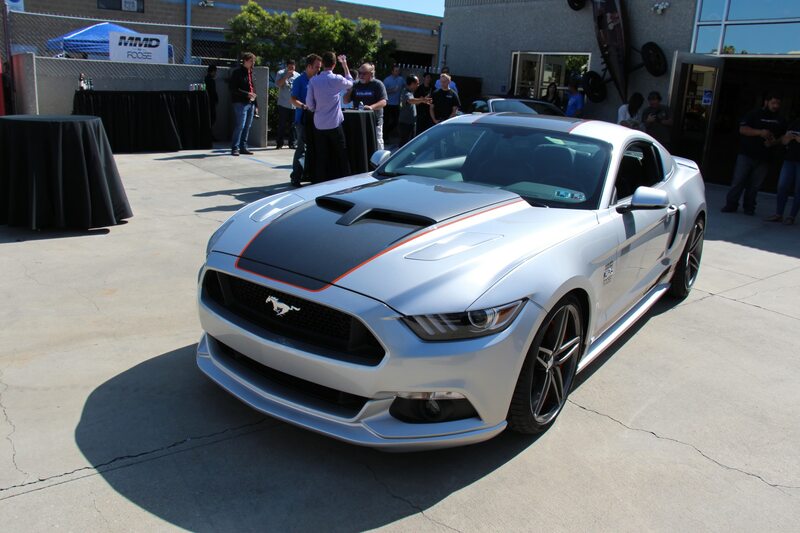 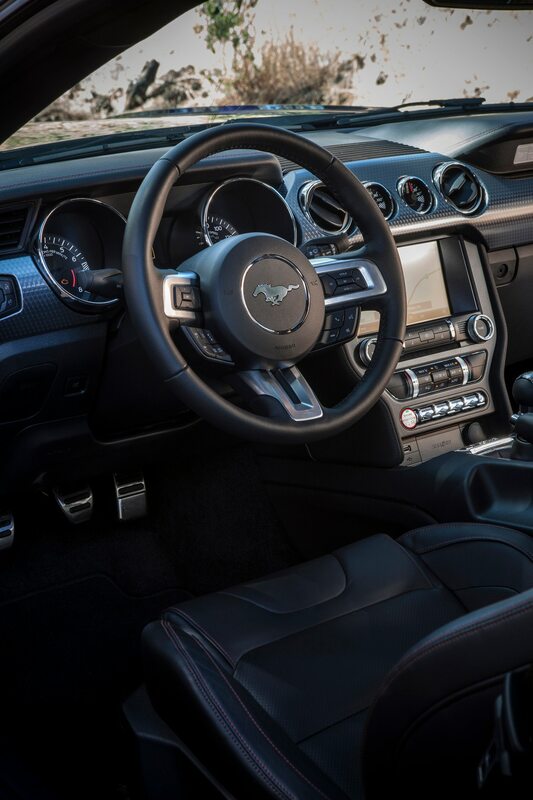 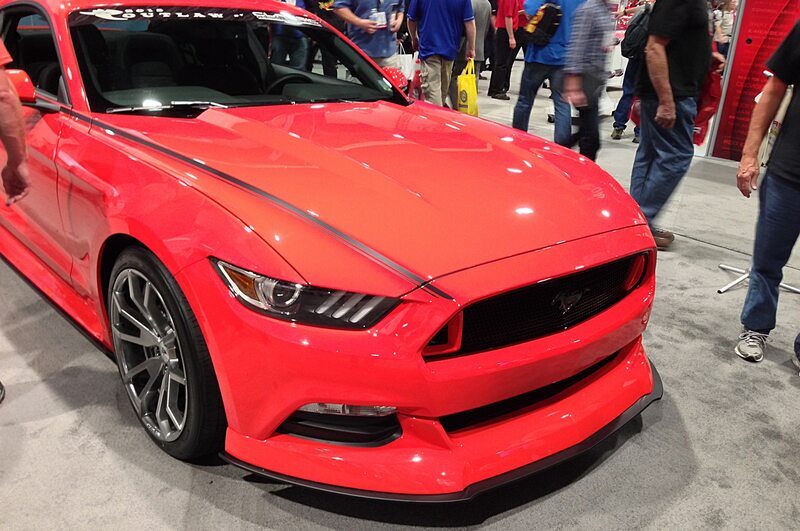 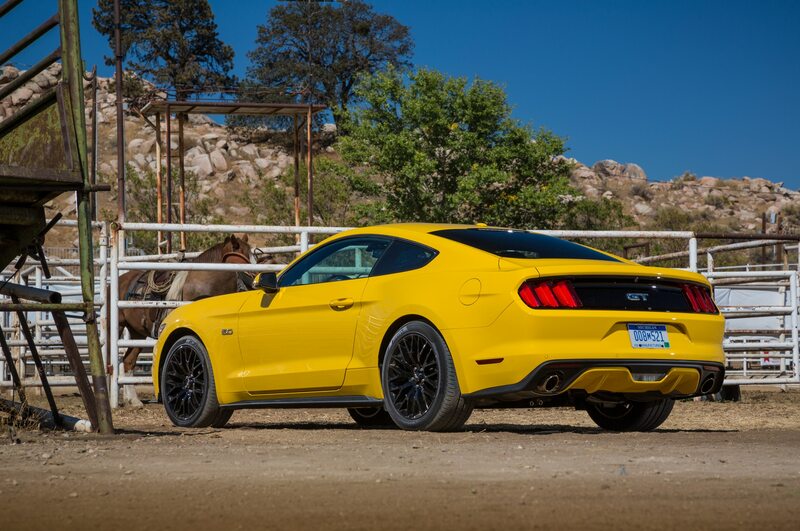 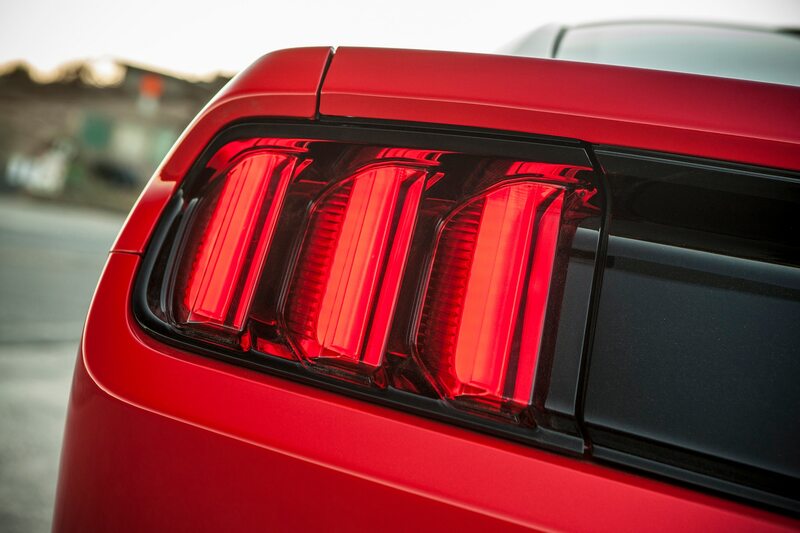 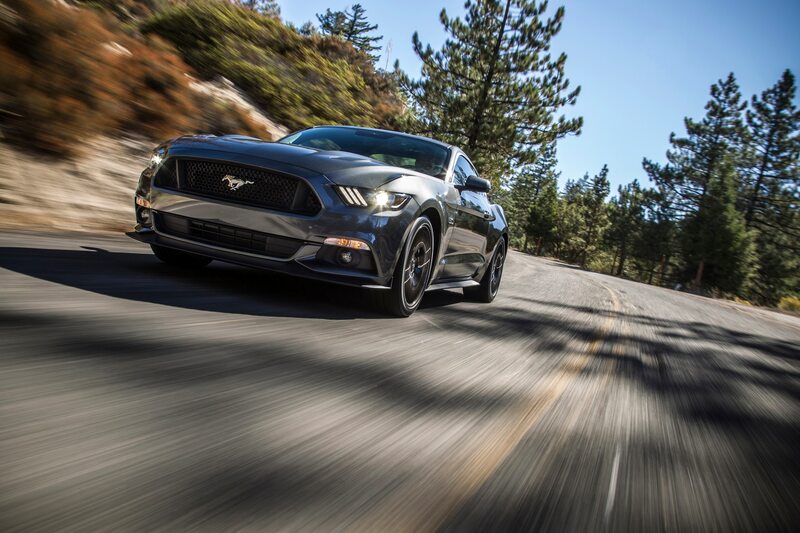 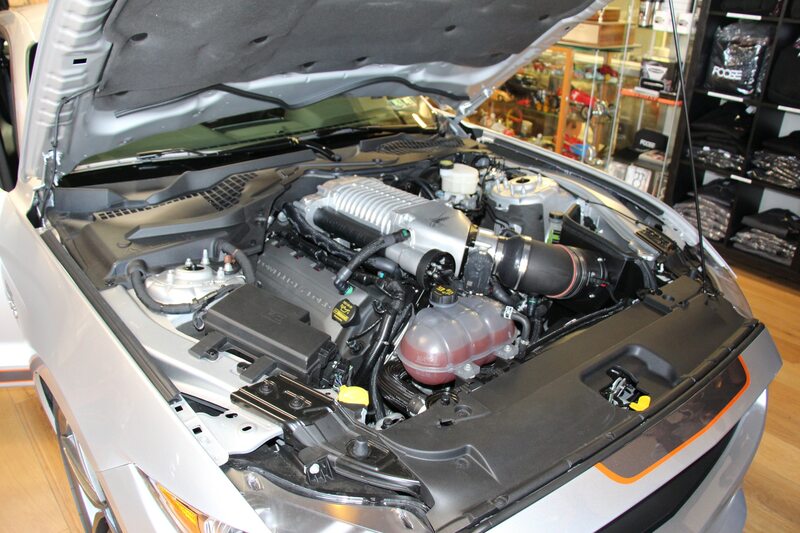 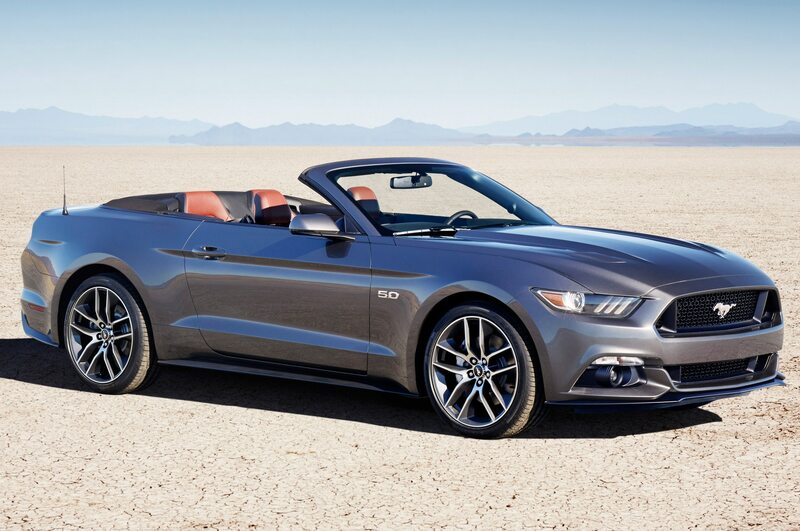 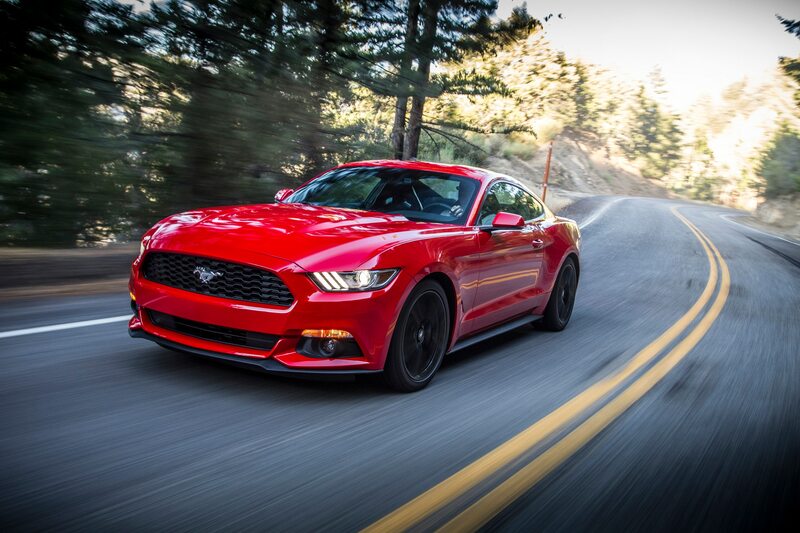 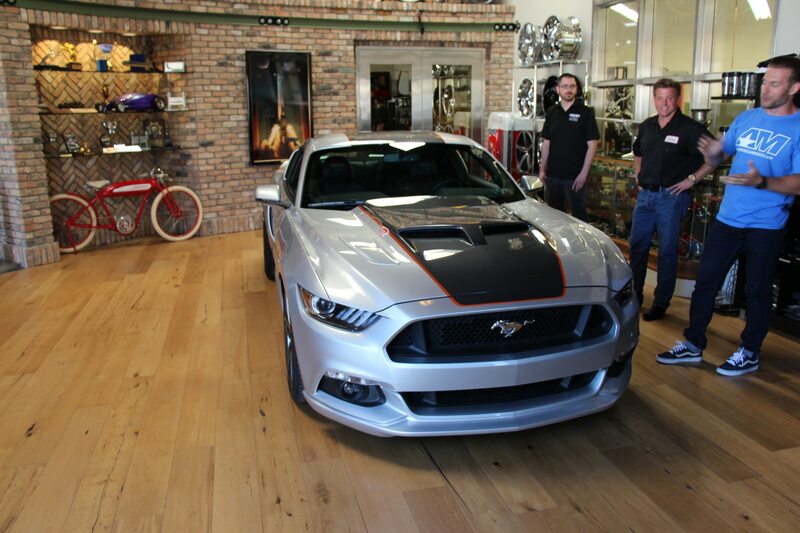 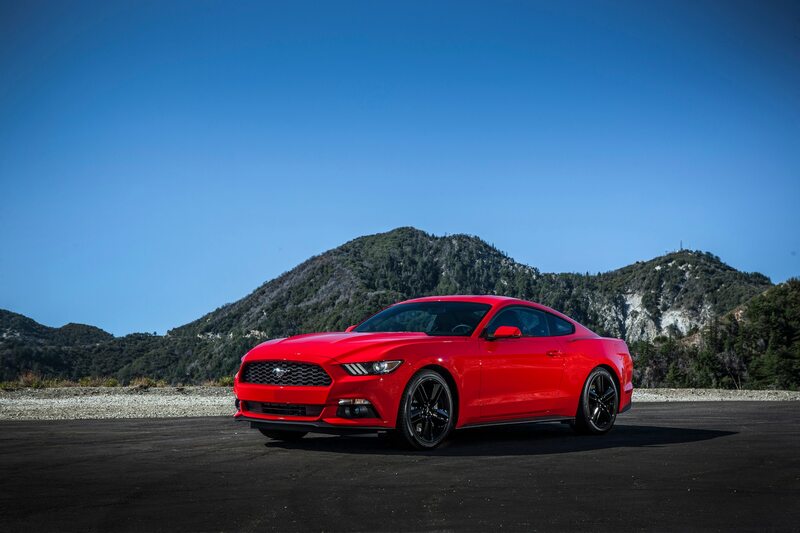 “We sat down and said the ’15 Mustang is a great car out of the box. 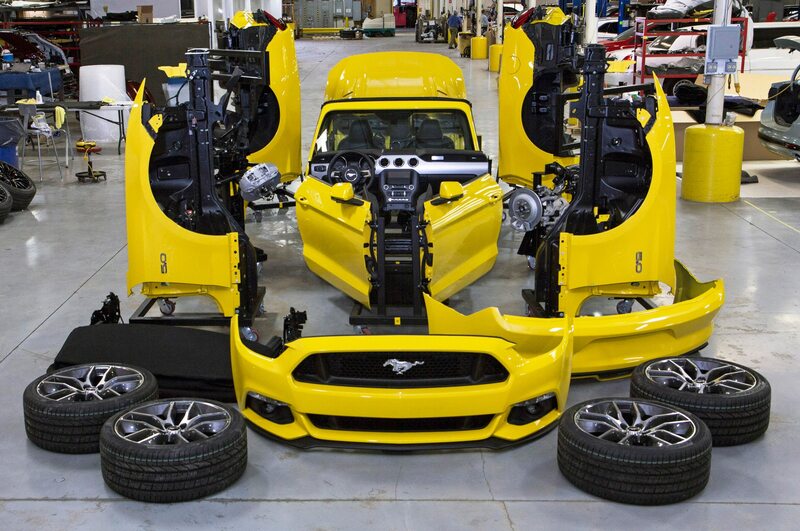 We then said, ‘Let’s build the car we want to drive,’ ” says A.J. 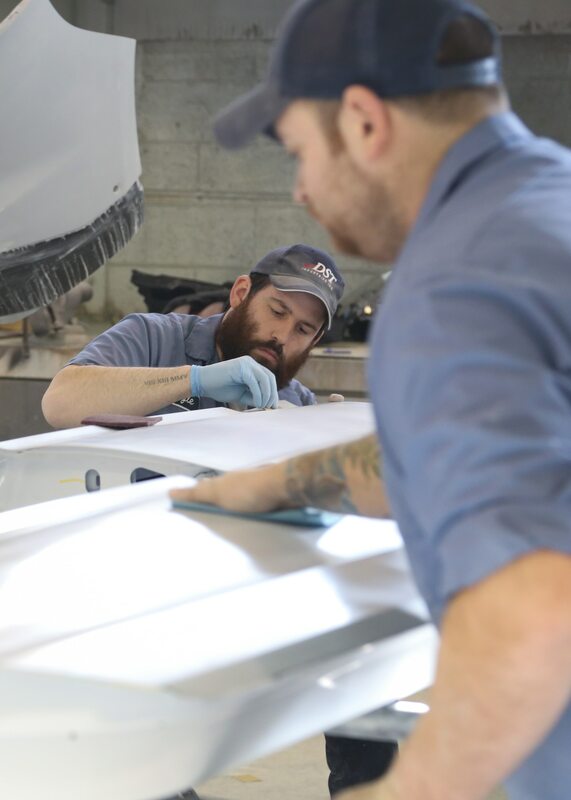 Feher, vice president of operations. 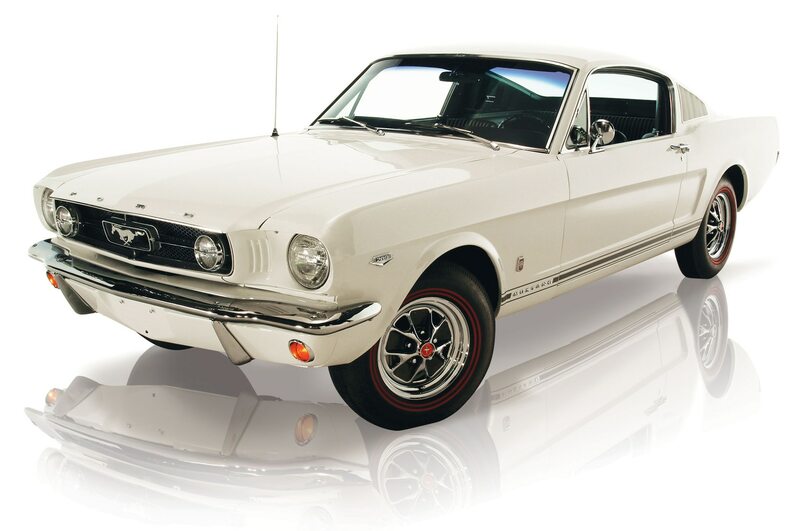 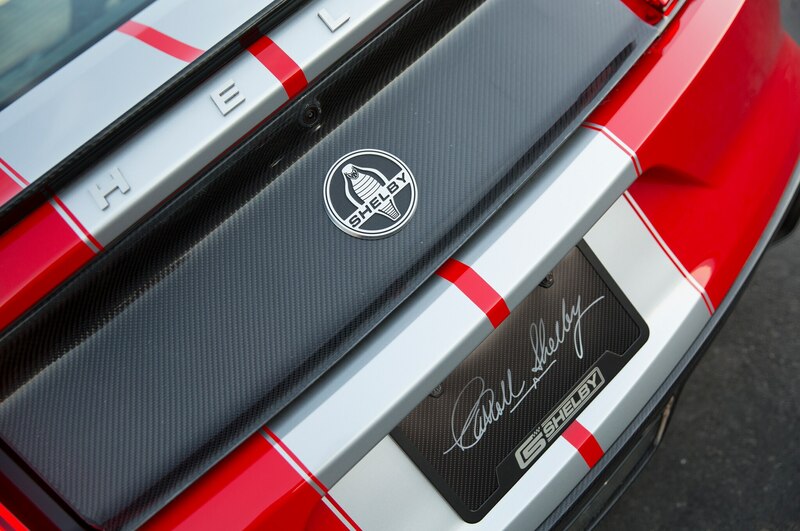 Feher invoked a conversation with Carroll Shelby before the master’s passing in 2012, the lesson being that their cars should be lighter, faster, and better-looking. 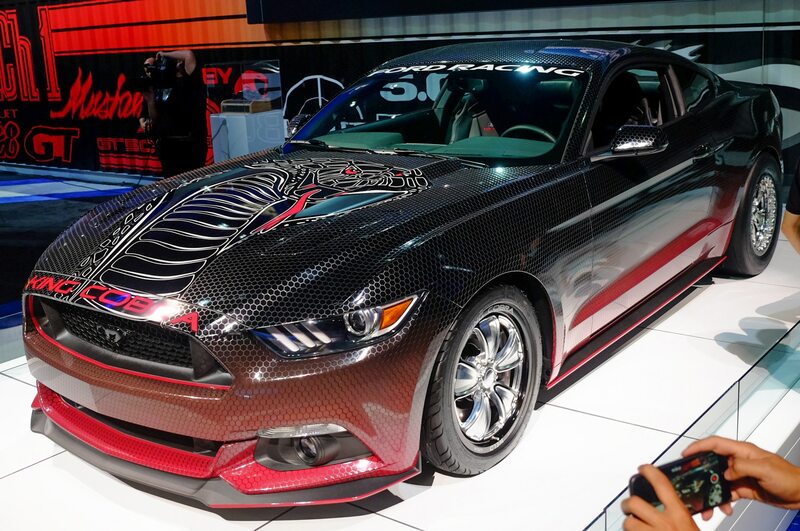 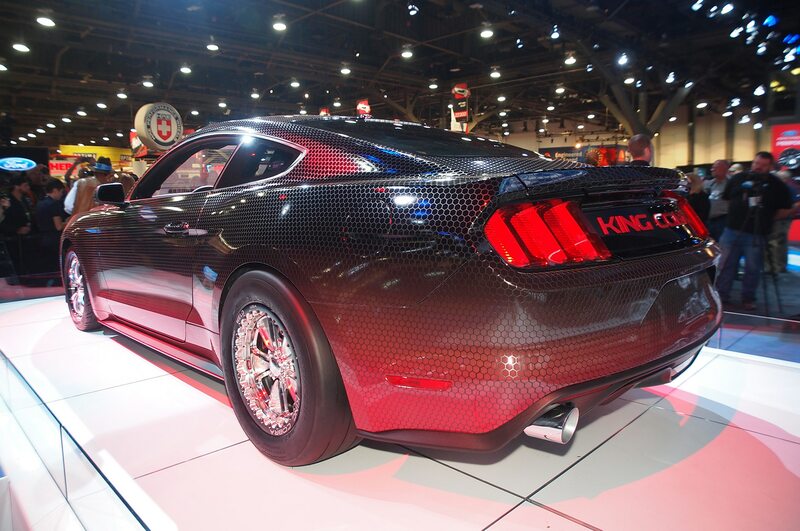 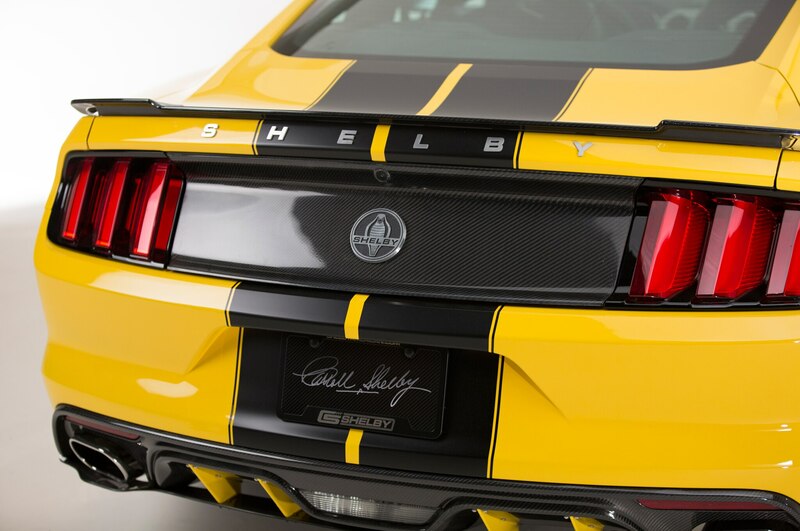 Even with carbon-fiber pieces from tip to tail, the 2015 Shelby GT may not be lighter — “It’s a wash,” Feher said — but otherwise it is true to the master’s precepts. 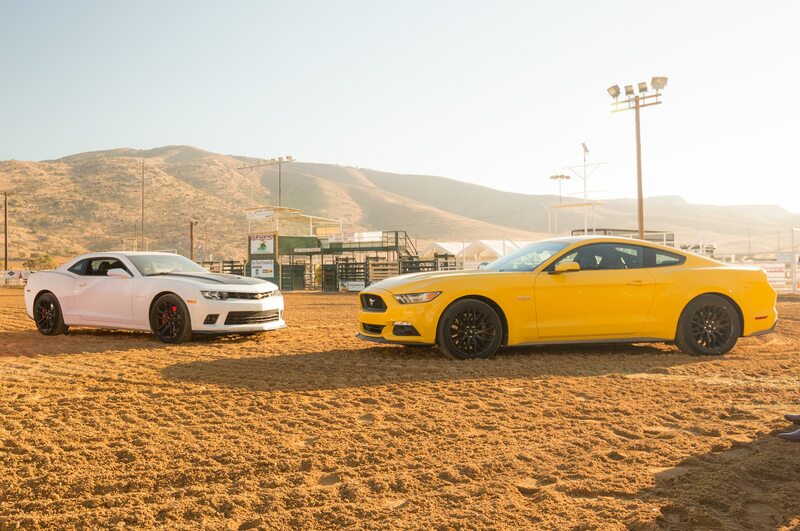 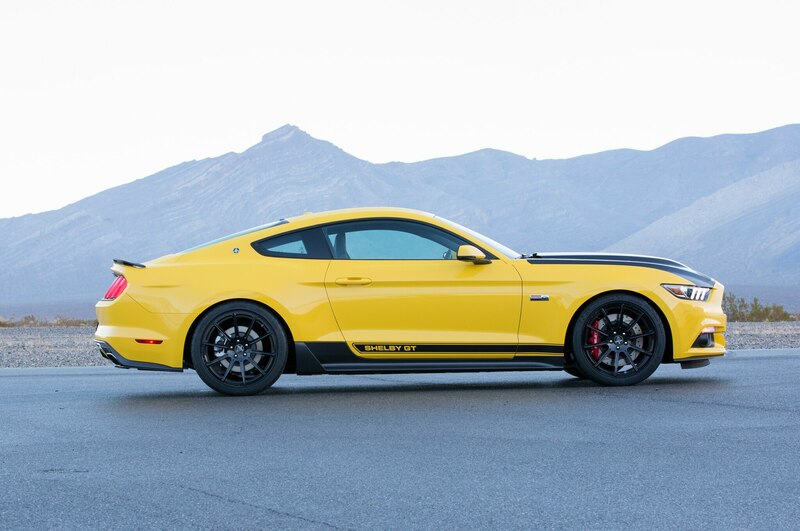 At the track, with the snowy Spring Mountains and cloud-capped Charleston Peak in the background, yellow, black, and red Shelby GTs glisten in the sunshine. 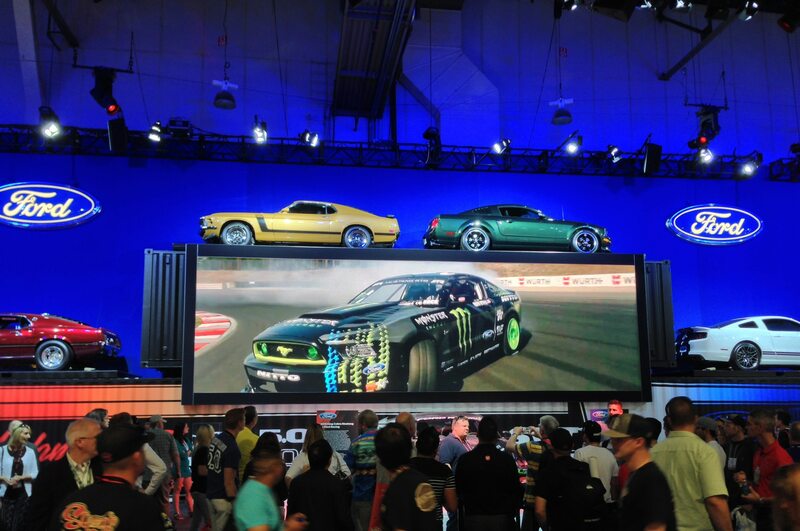 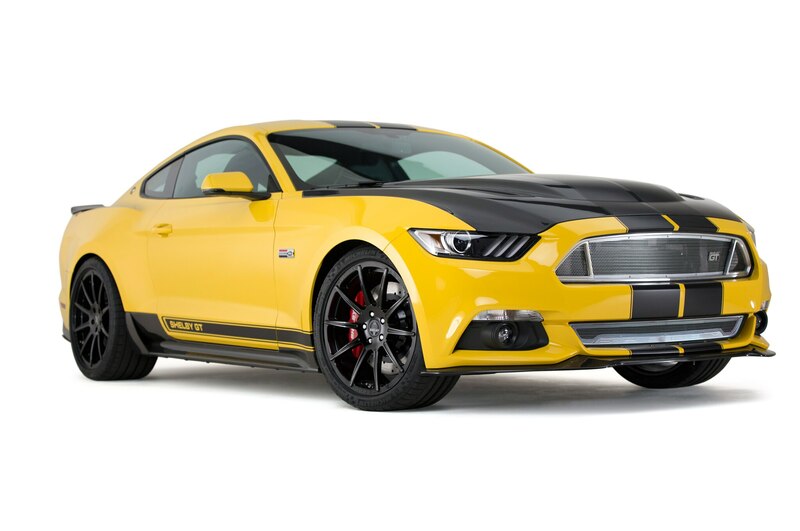 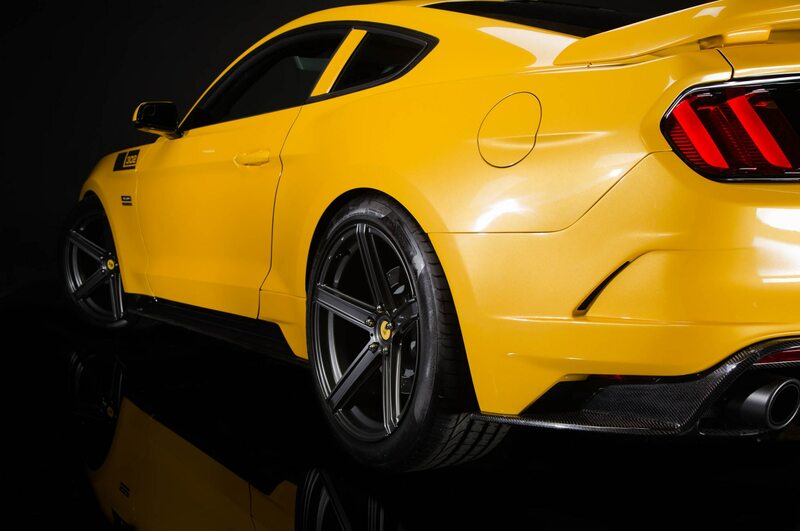 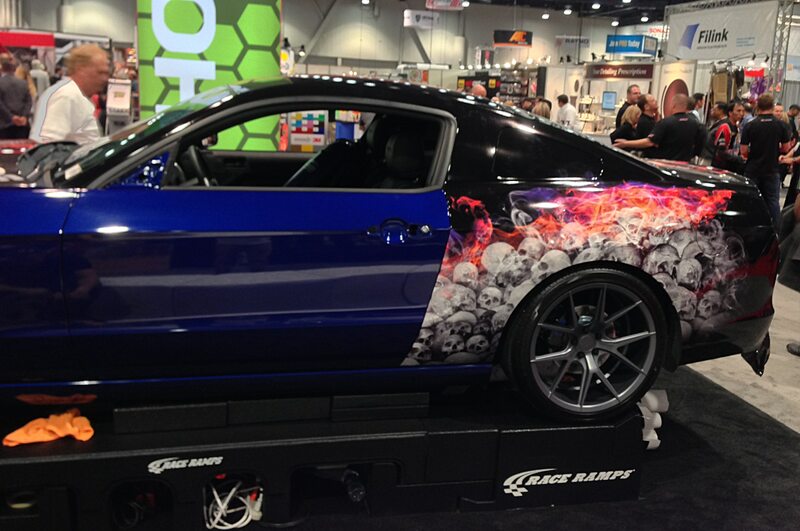 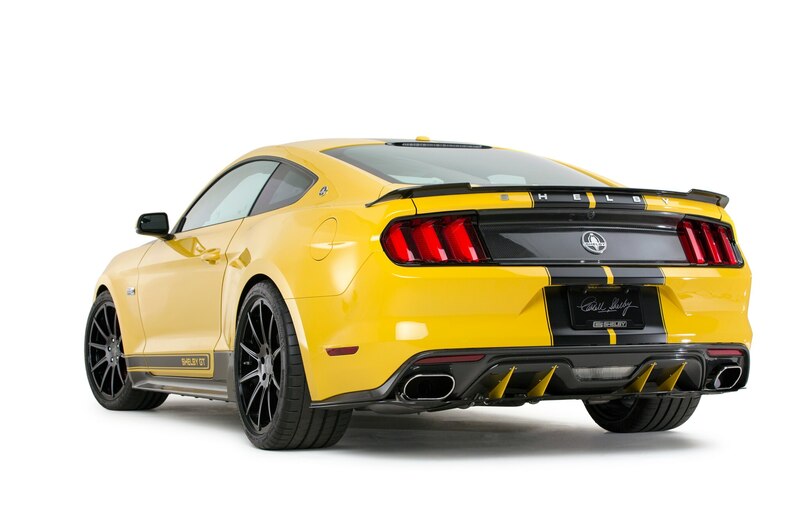 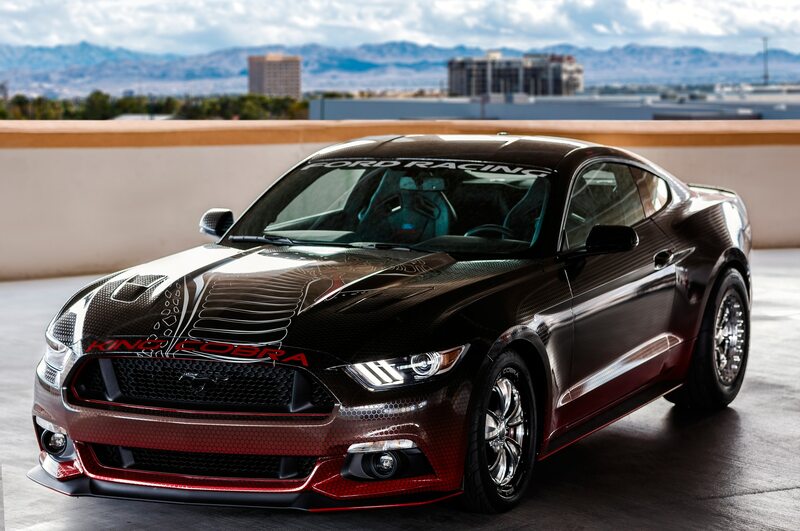 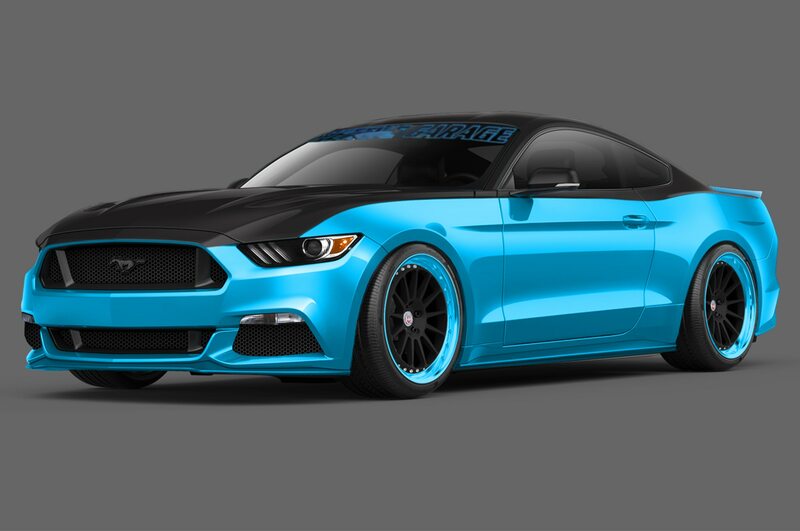 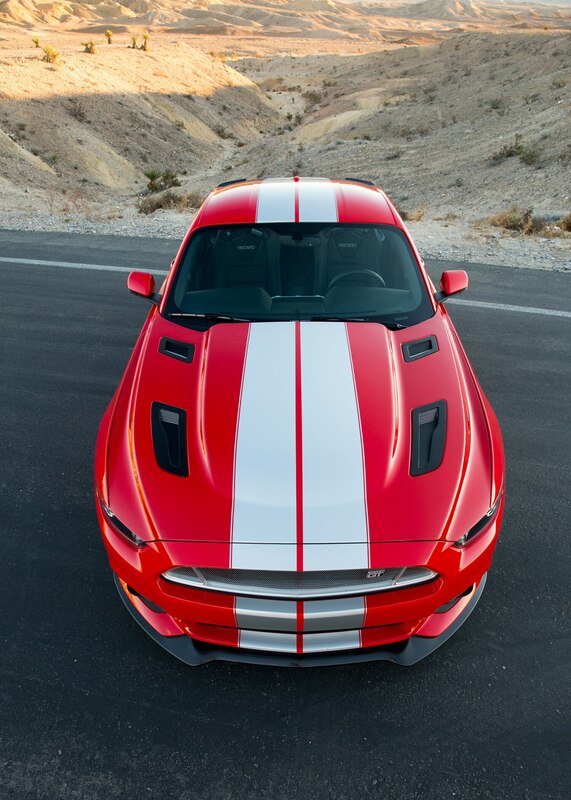 (A Shelby GT buyer can select any color in the Mustang book before shipping his car to Las Vegas, where stripes and graphics are applied as part of the deal.) 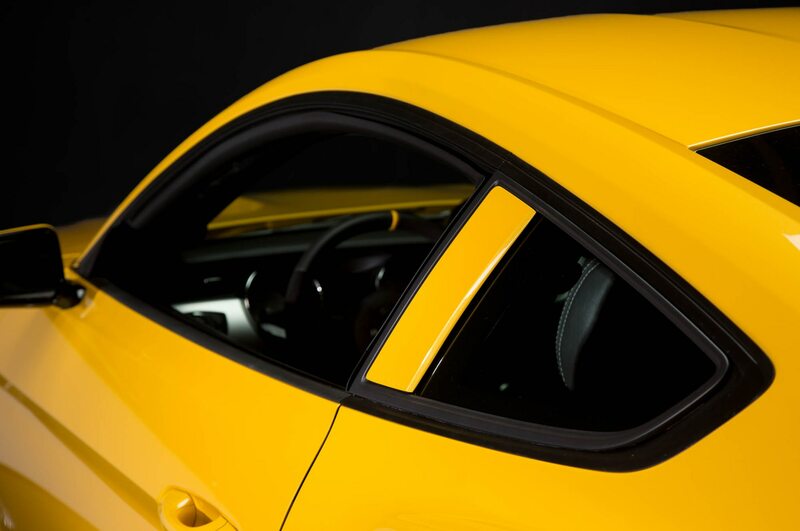 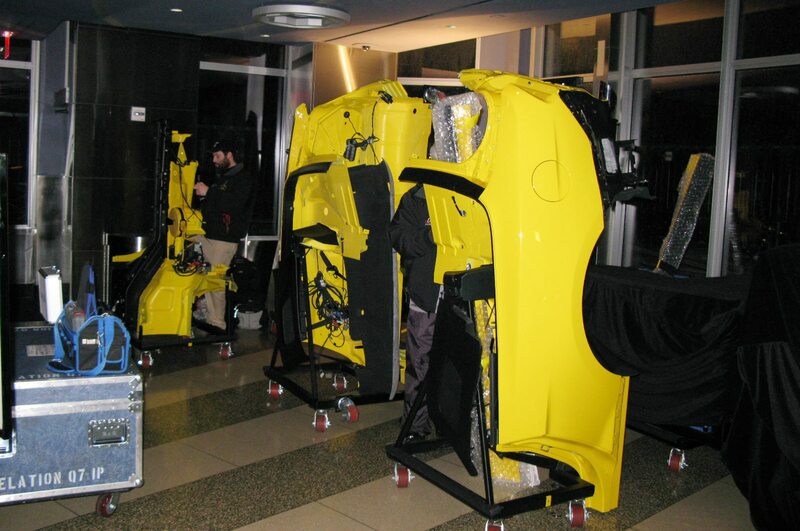 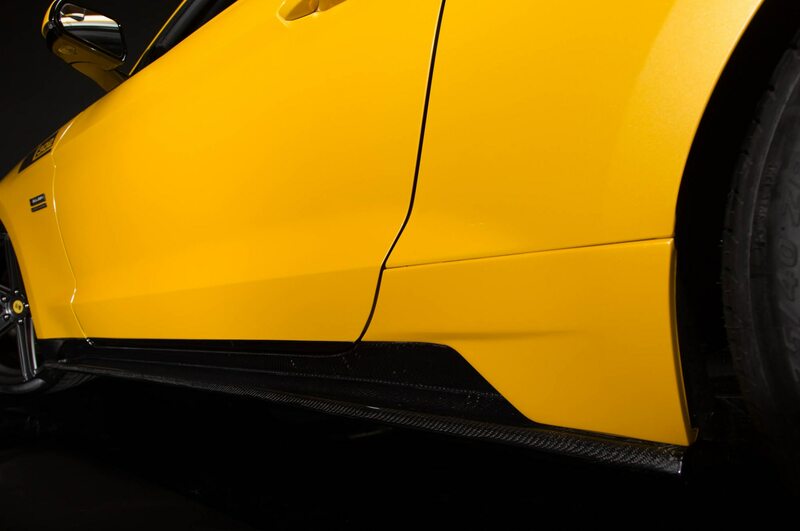 For our first laps we chose yellow with black stripes, unpainted carbon — and more premium, optional suspension components. 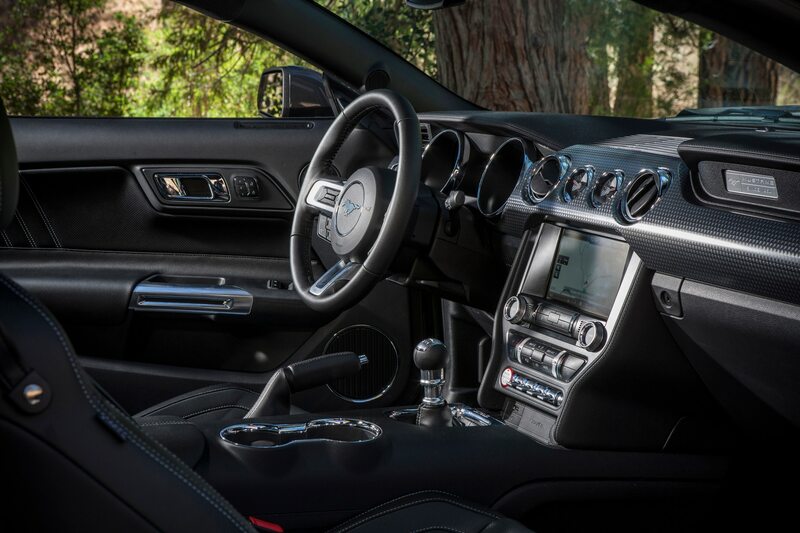 After climbing in, it’s easy to settle into a comfortable driving position and capitalize on the already superb visibility. 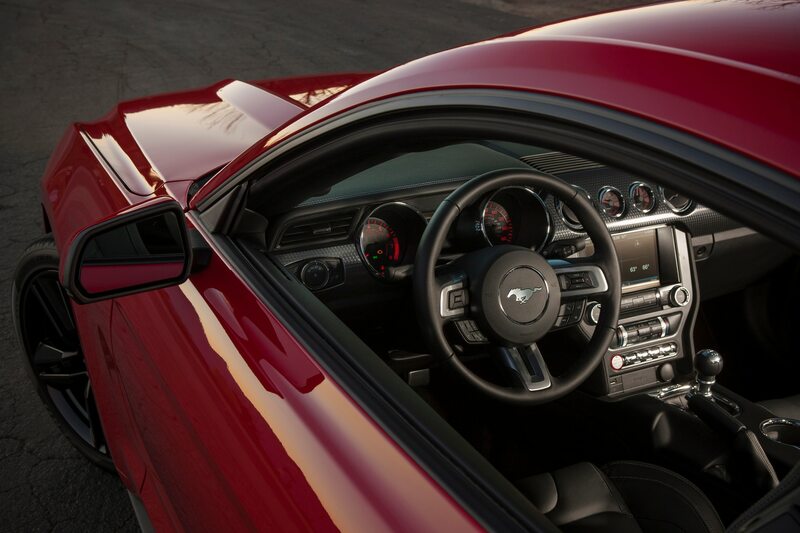 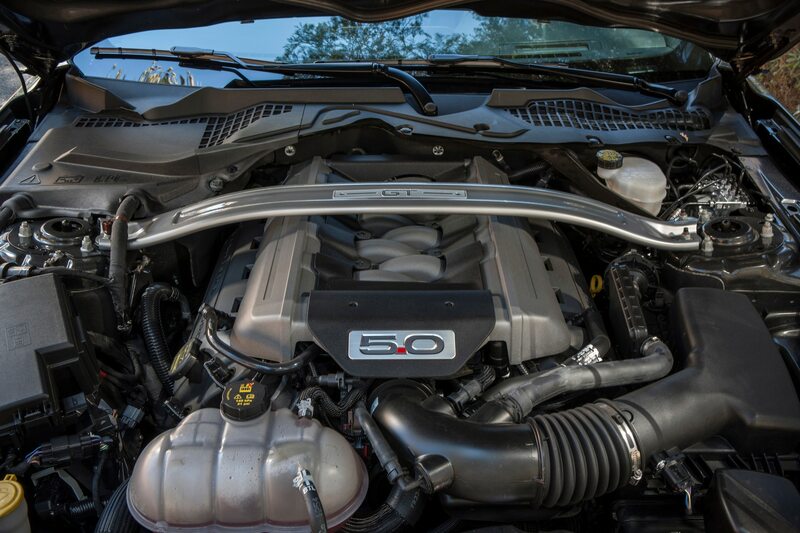 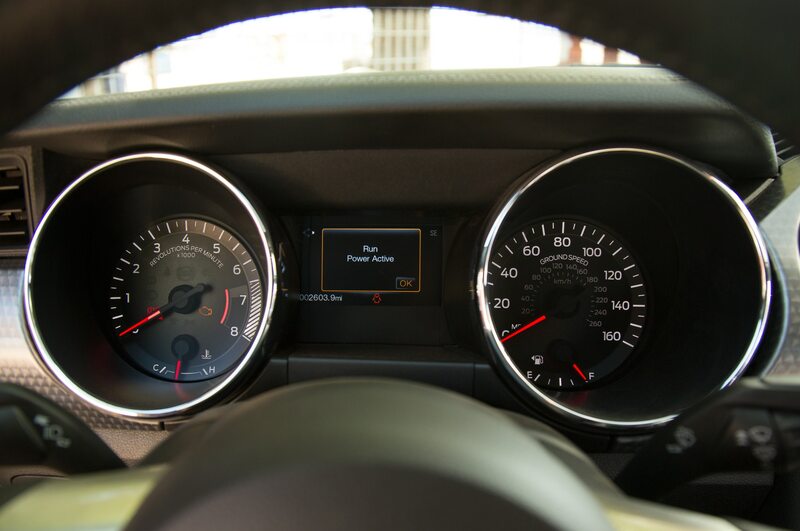 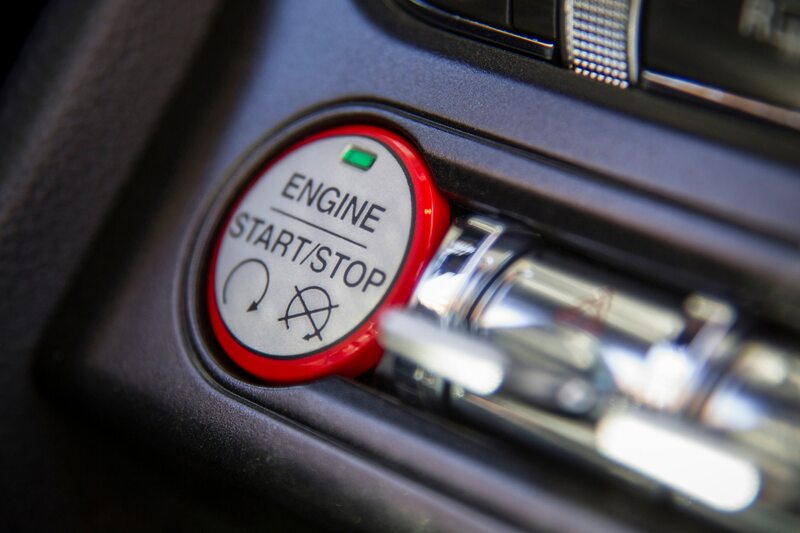 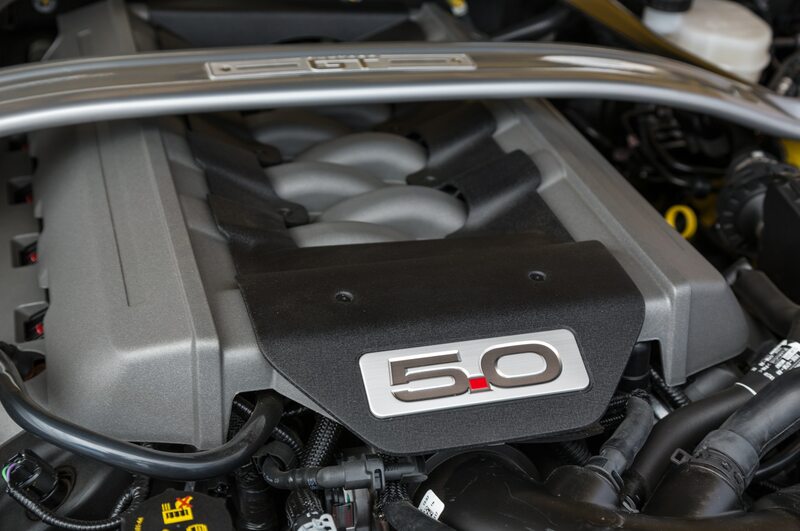 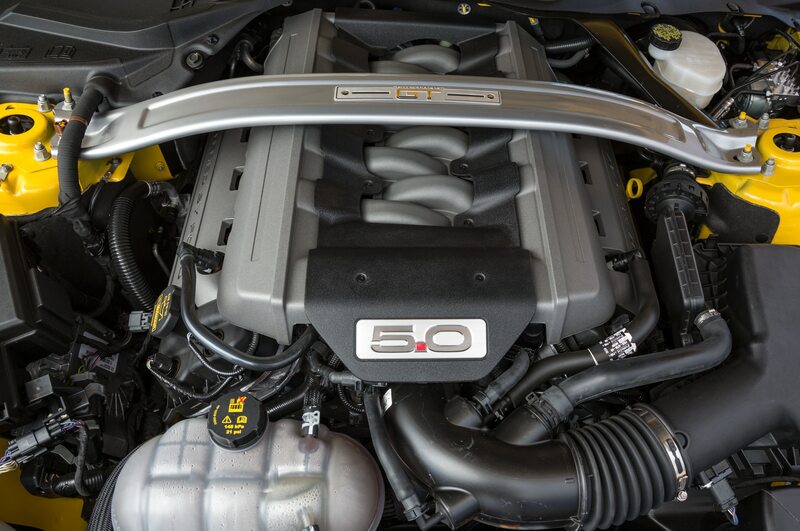 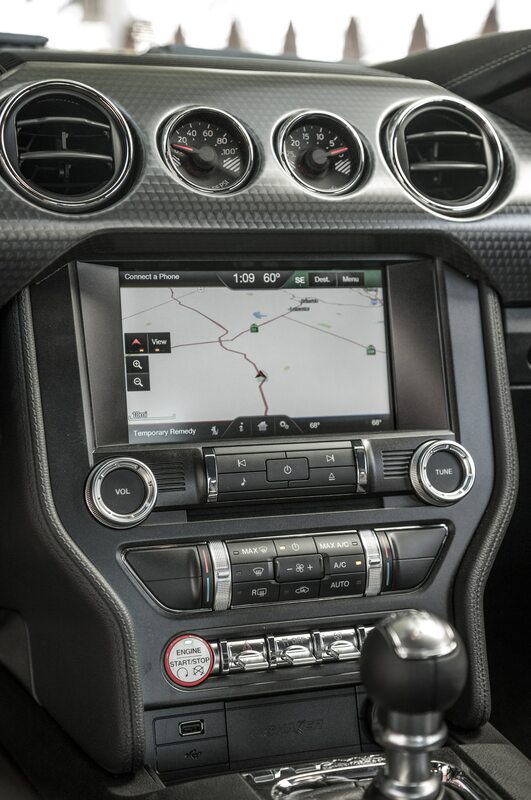 We press the start button, firing up the 5.0-liter engine, which has been supercharged for 627 hp. 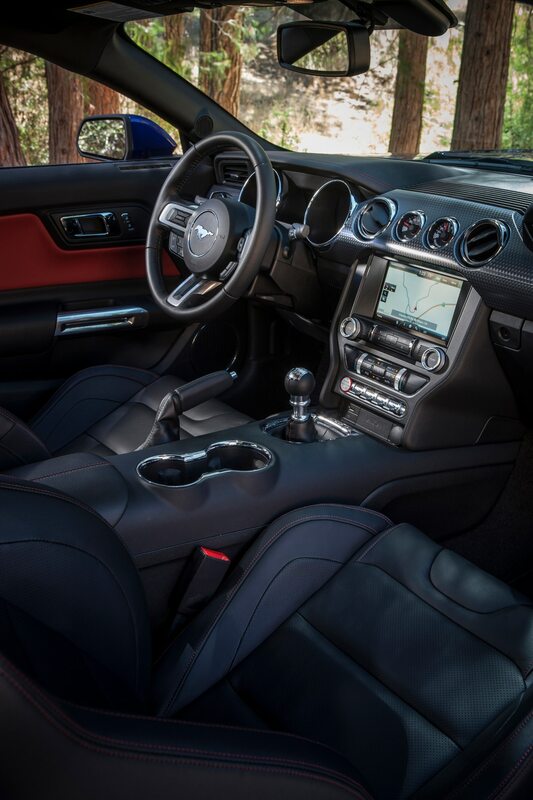 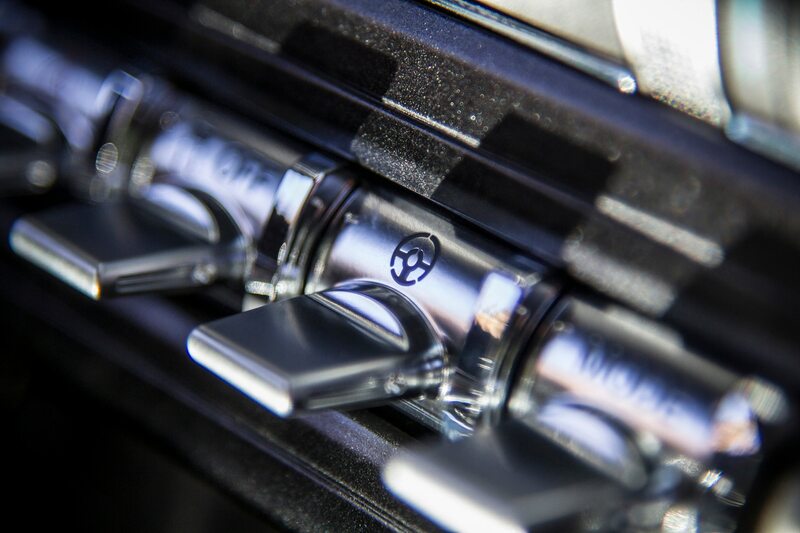 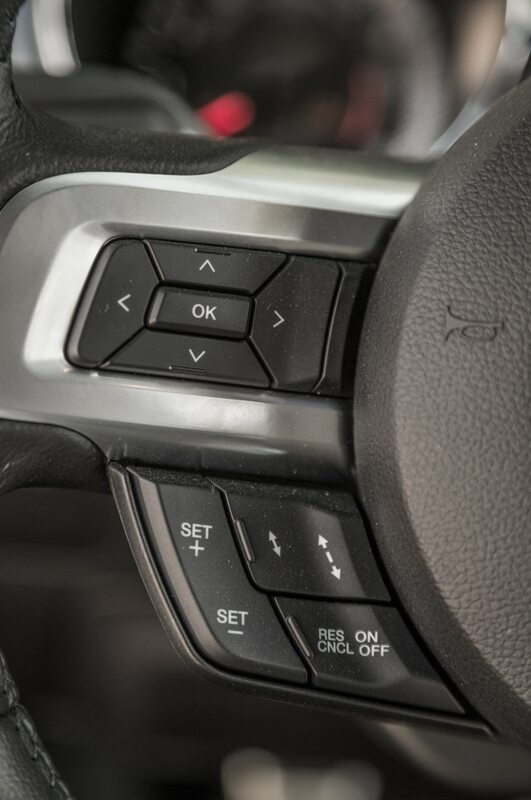 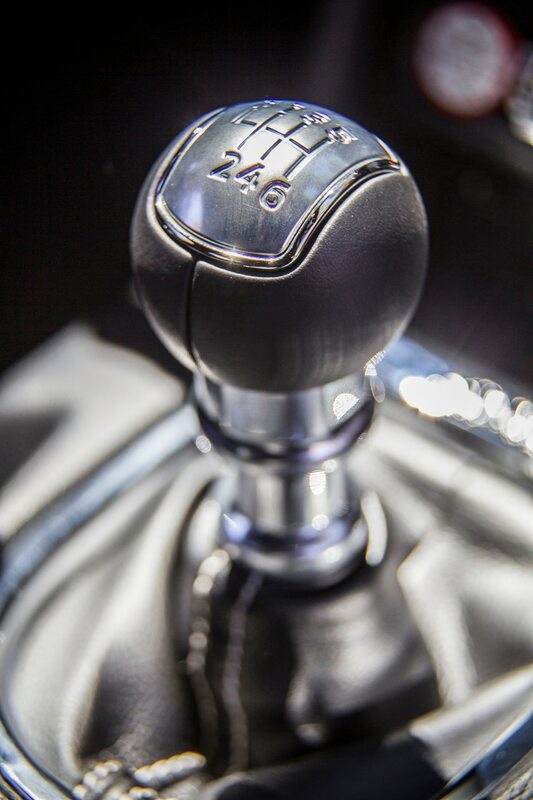 We gleefully nudge the short-throw shifter into first. 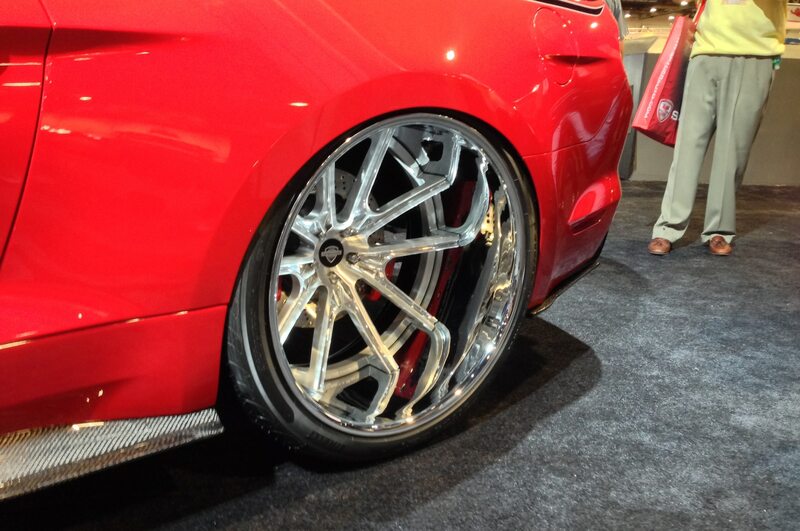 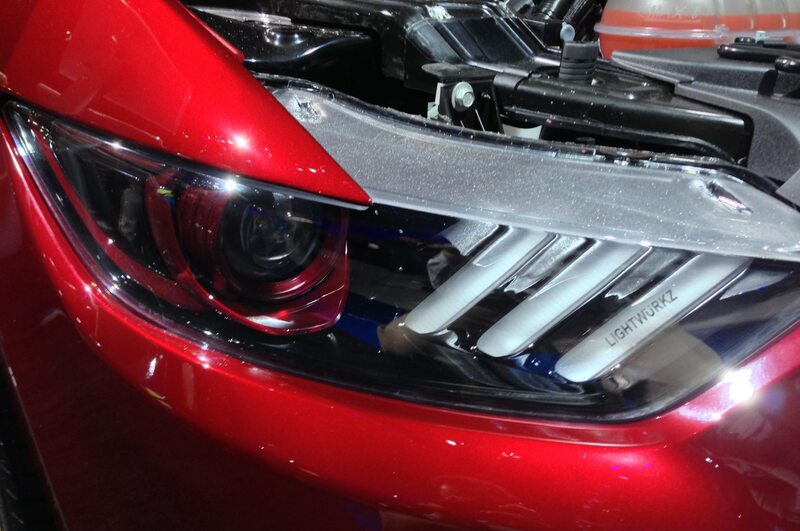 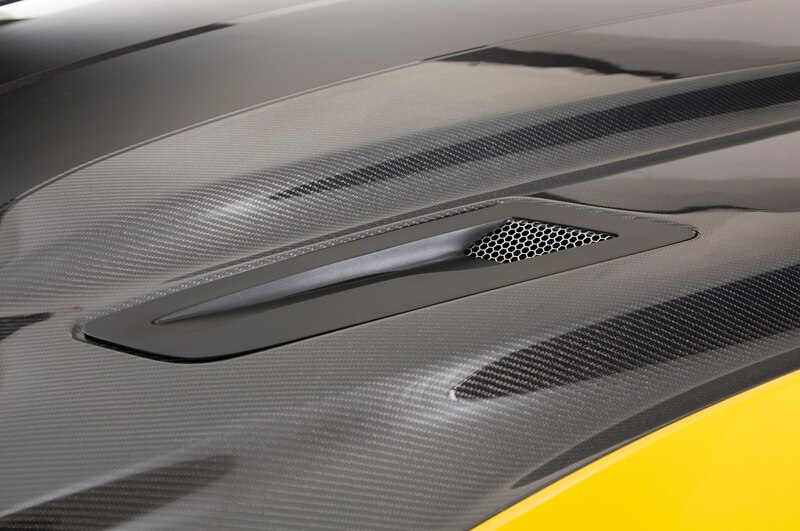 A blip of the throttle gives us an idea of the Borla exhaust’s euphonious range. 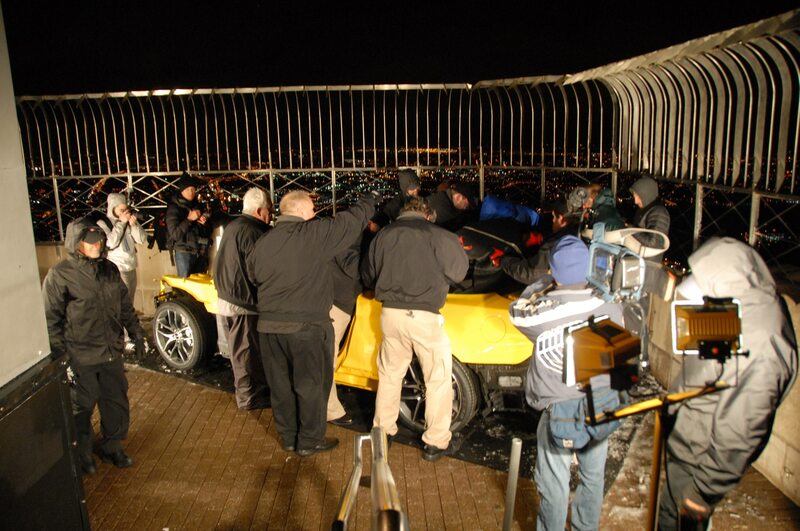 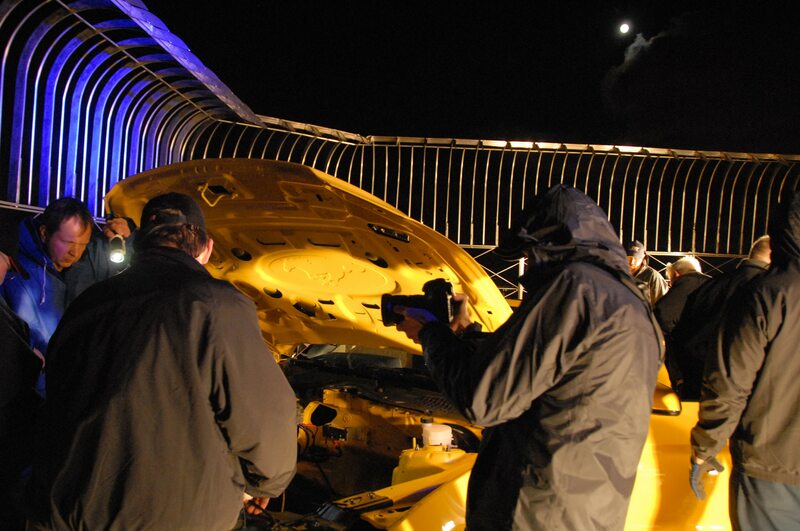 Then, out of the pits we go. 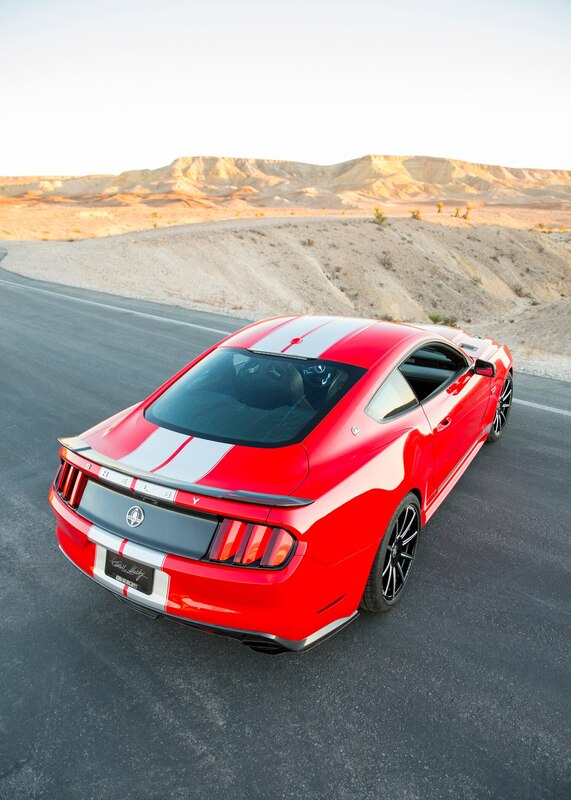 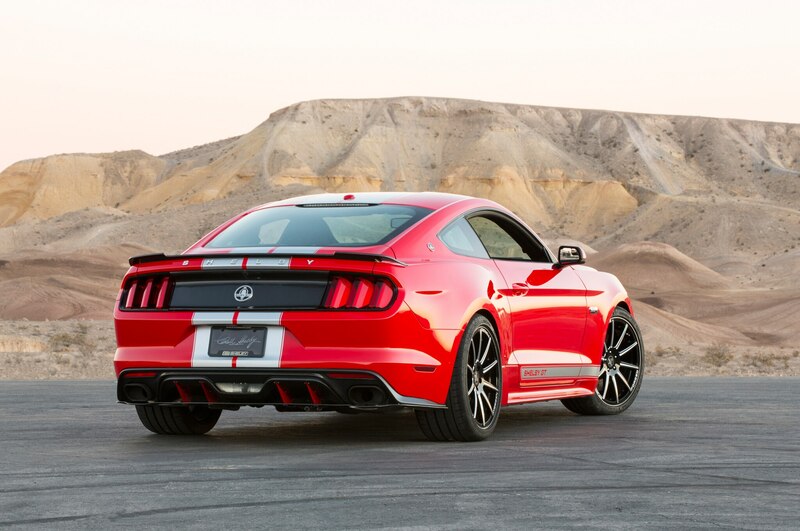 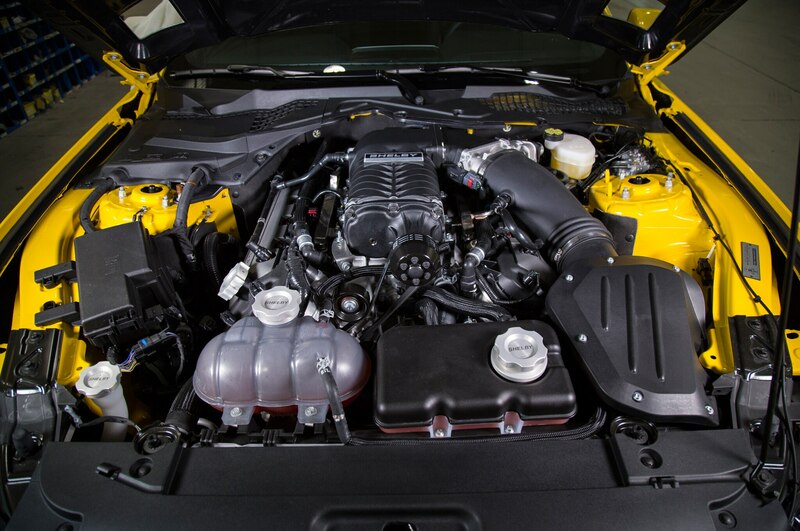 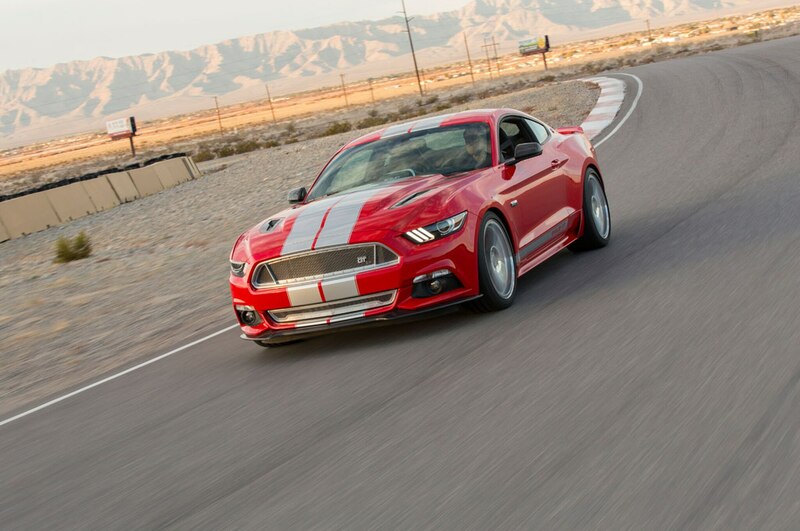 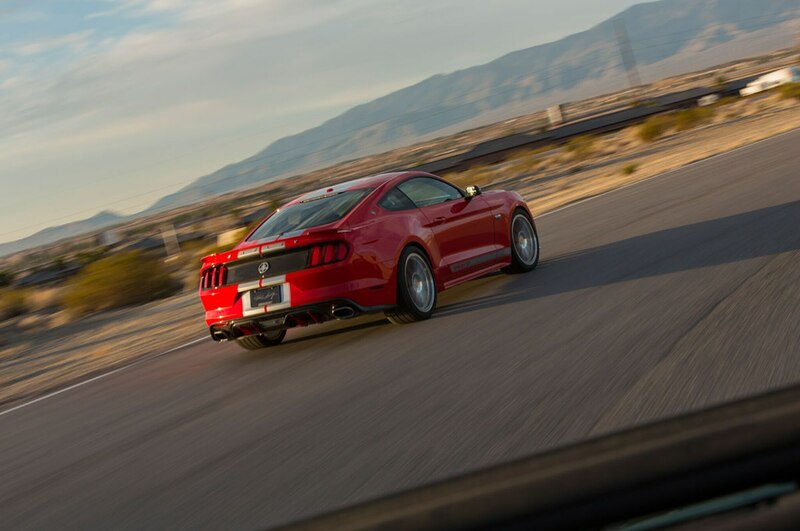 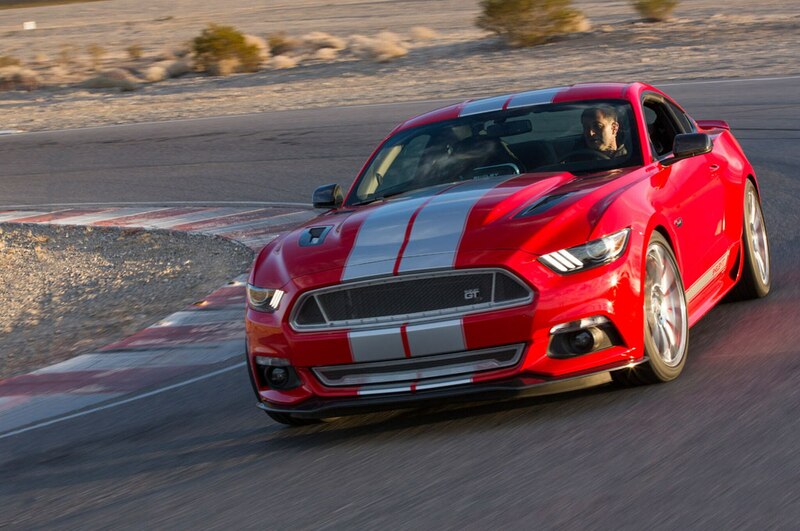 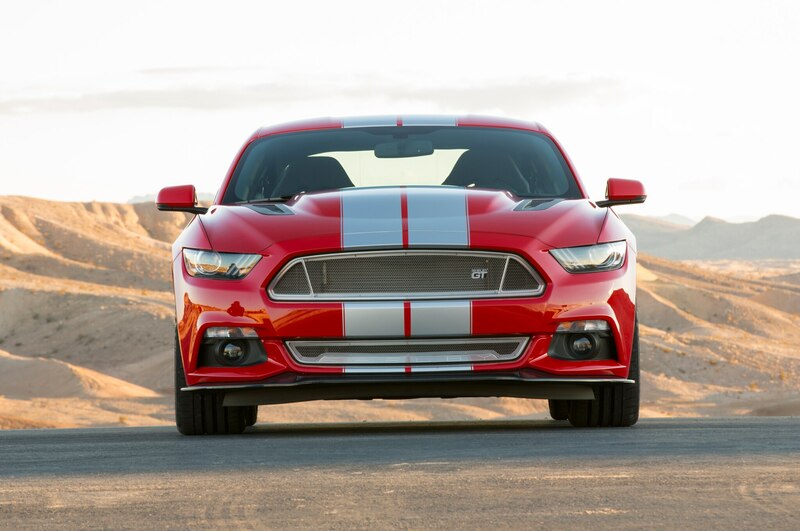 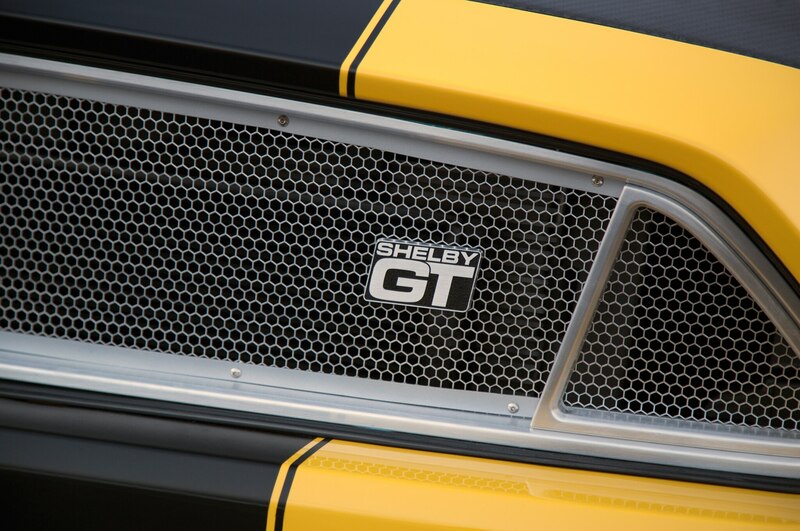 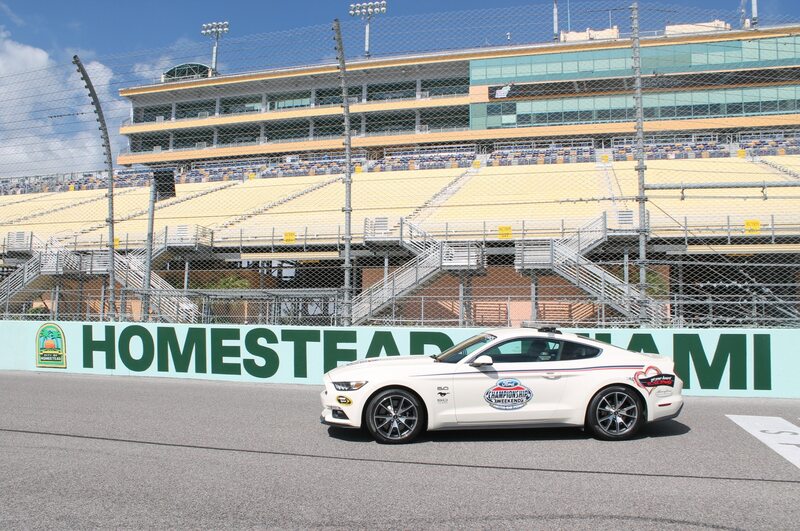 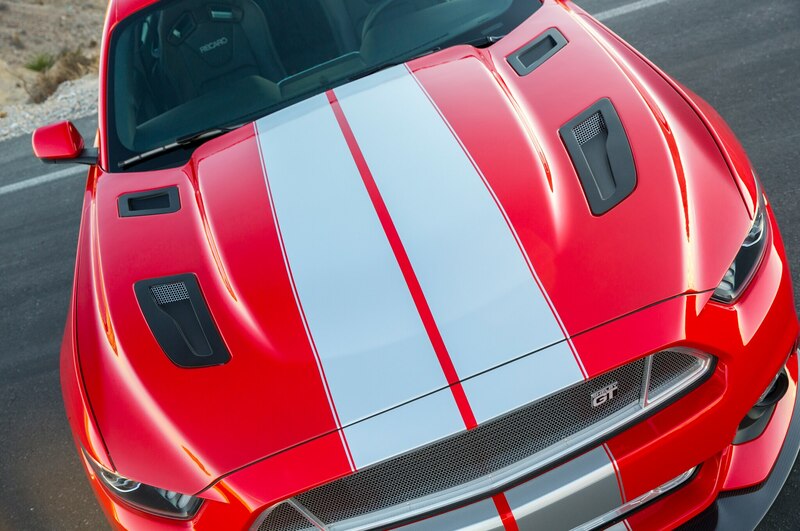 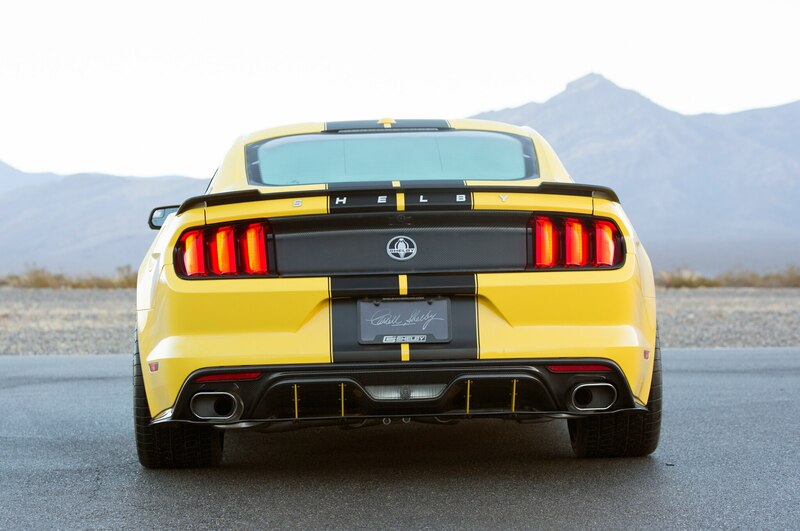 After a warm-up lap, the 2015 Shelby American GT reveals itself in full. 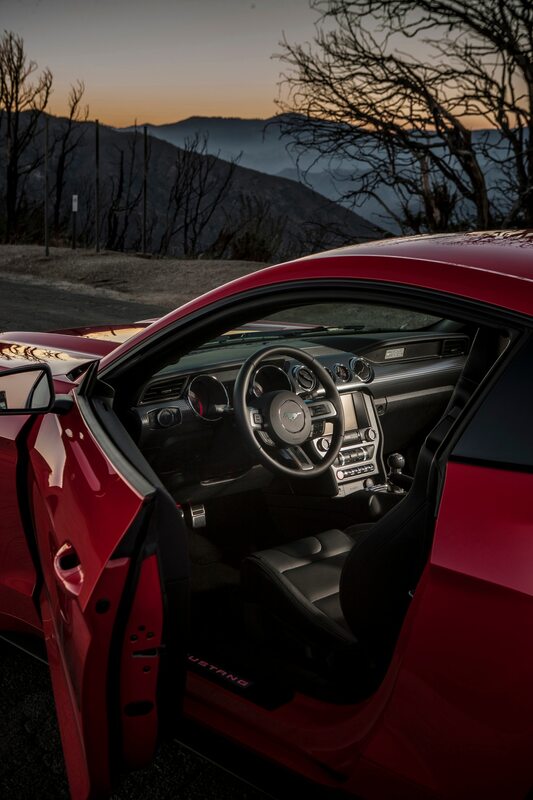 The car is as consistent and straightforward as a Vegas cocktail waitress asking, “How about another?” We eye the exit point of a corner and delicately open the throttle, waiting to unleash the beast. 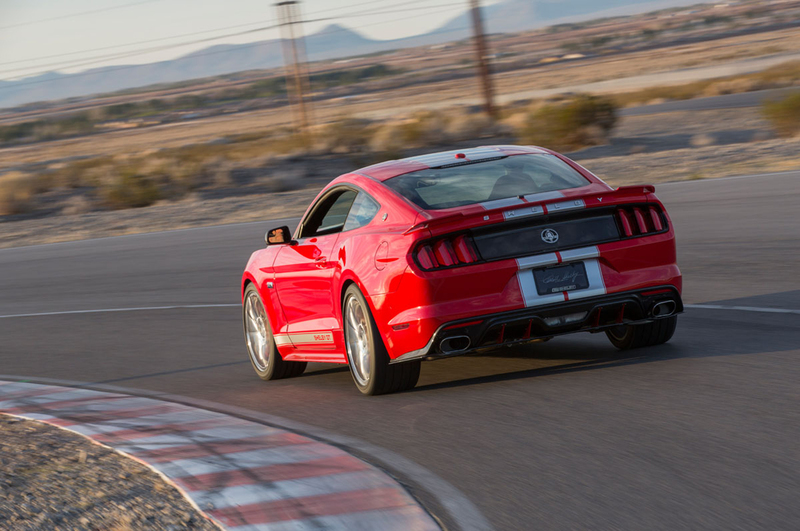 Then, the ready-to-rev V-8 dropkicks us down the straightaways. 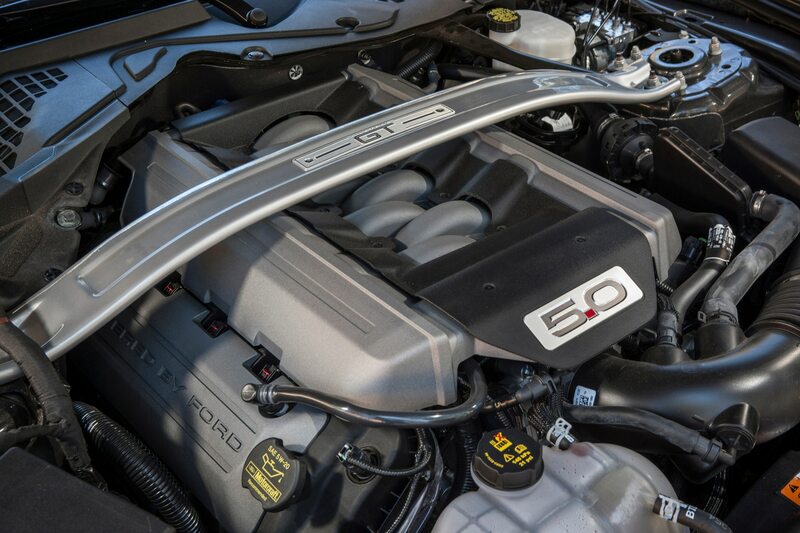 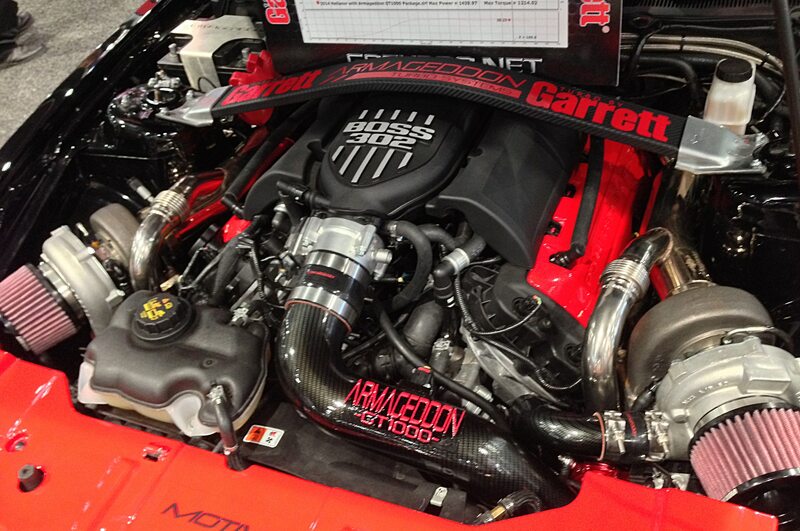 Just as we can never remember how many aces are out, we forget about the supercharger, which neither whoops nor whistles. 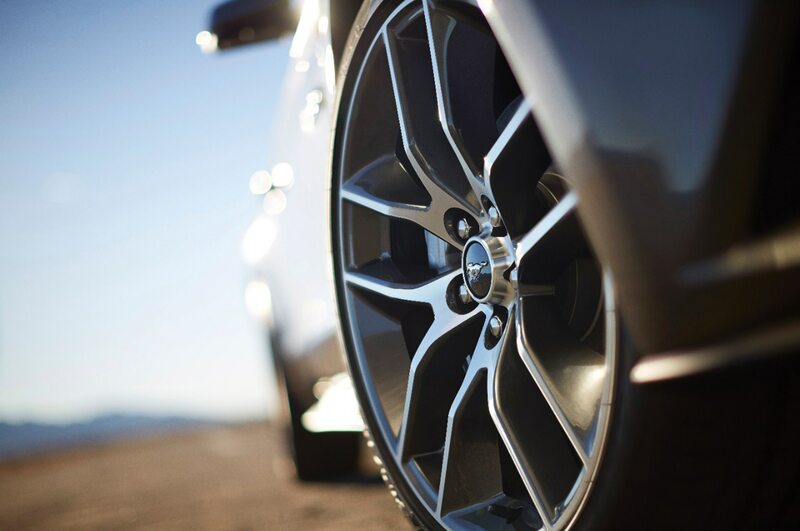 This is power delivery par excellence. 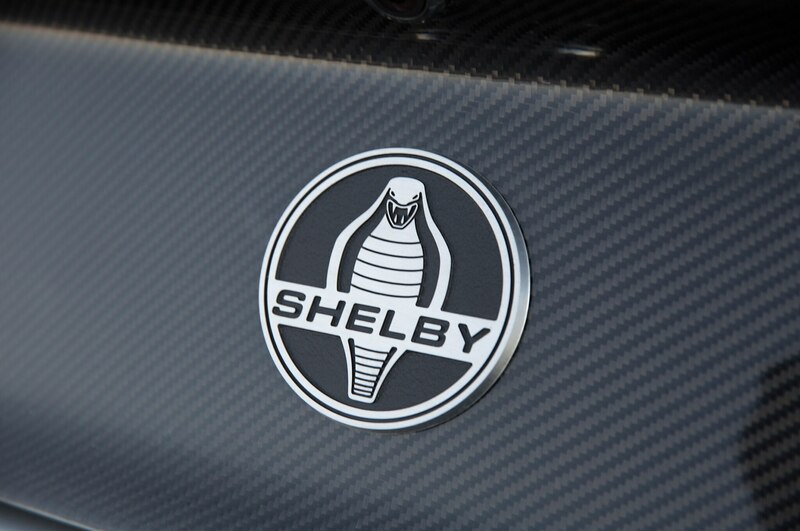 But for all the quick buildup of straight-line speed, where this Shelby really impresses is in the esses, sweepers, and hairpins. 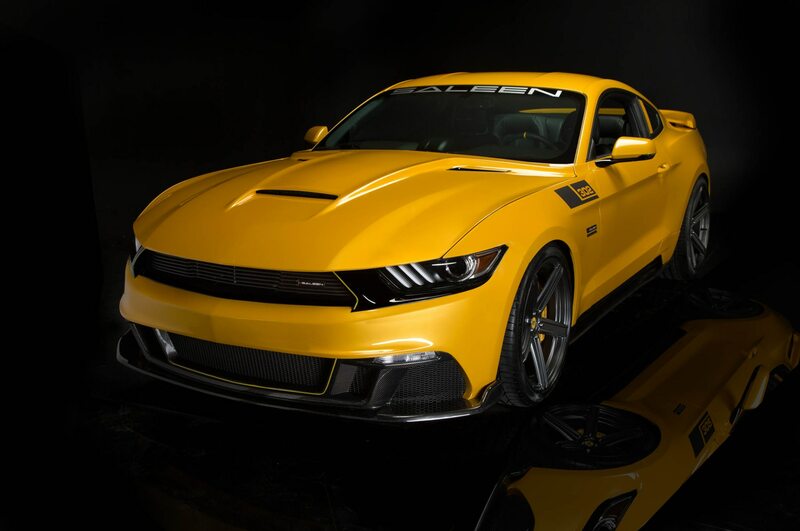 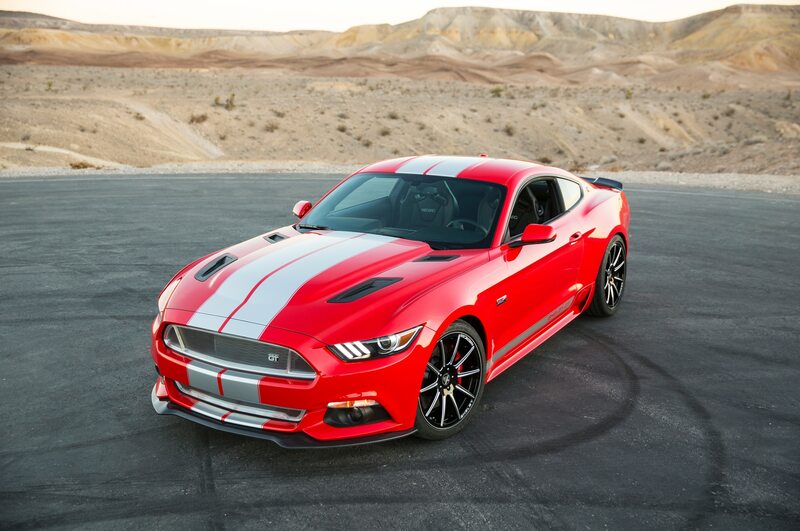 The technical course rewards precision, and for all its size — 107.1-inch wheelbase and 190.3 inches long — the 2015 Shelby American GT masters every step. 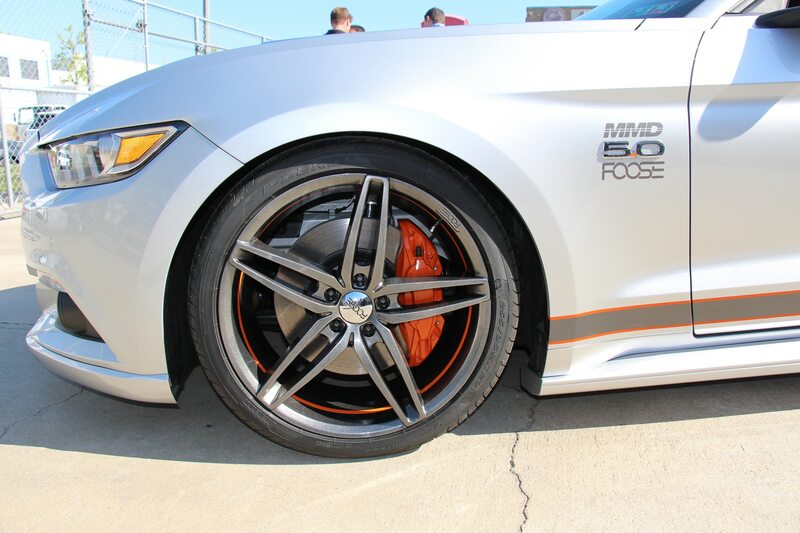 With six-piston Wilwood Engineering front calipers, there’s massive, progressive braking capability. 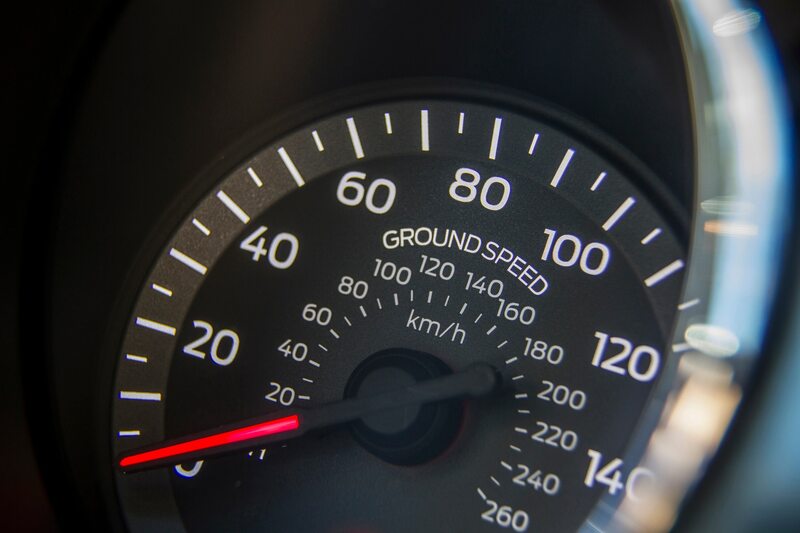 We feel the even-handed redistribution of forces every time we ease out of the pedal, raise the nose up again, and turn into a corner. 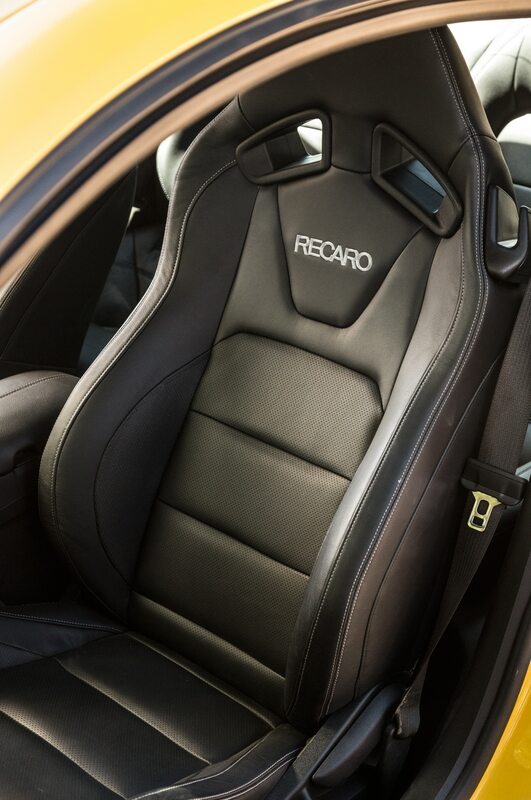 The chassis rotates with Copernican consistency, in no small part due to the new independent rear suspension. 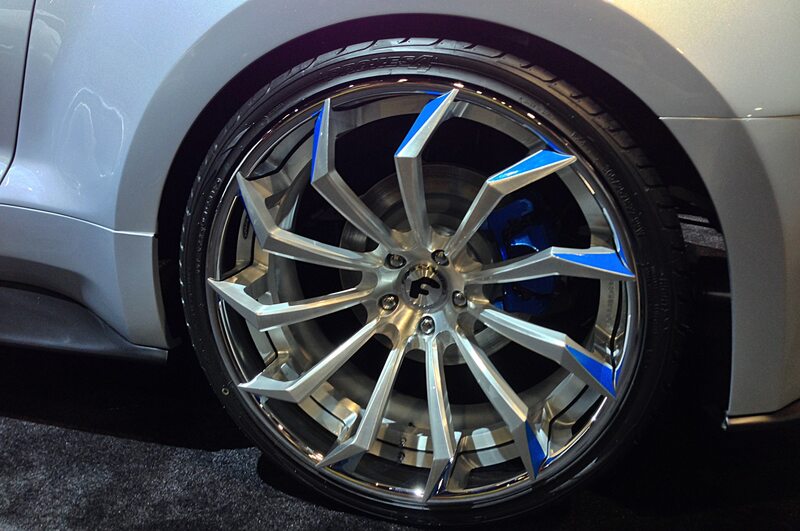 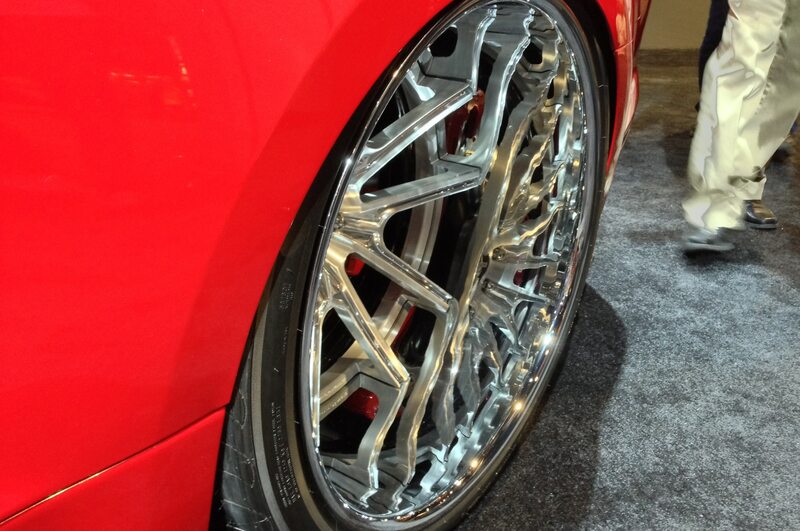 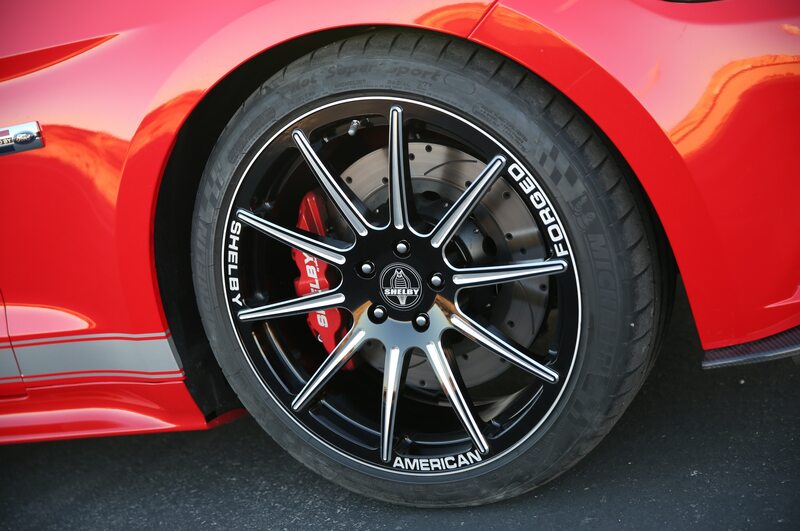 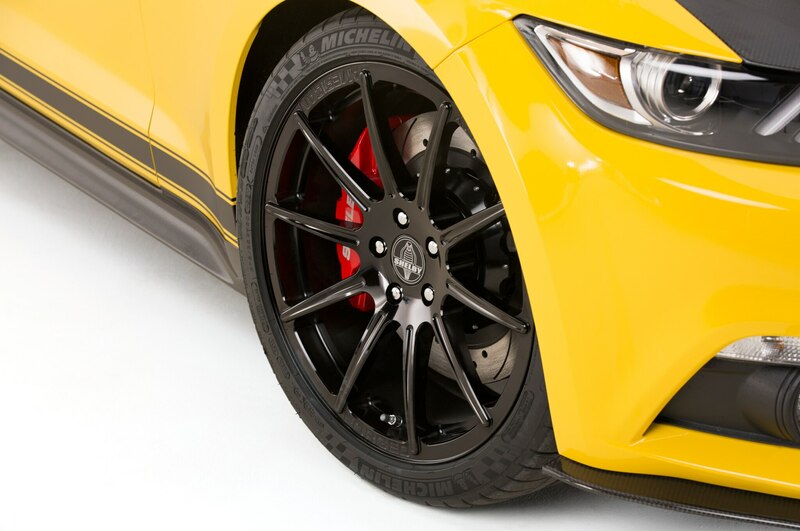 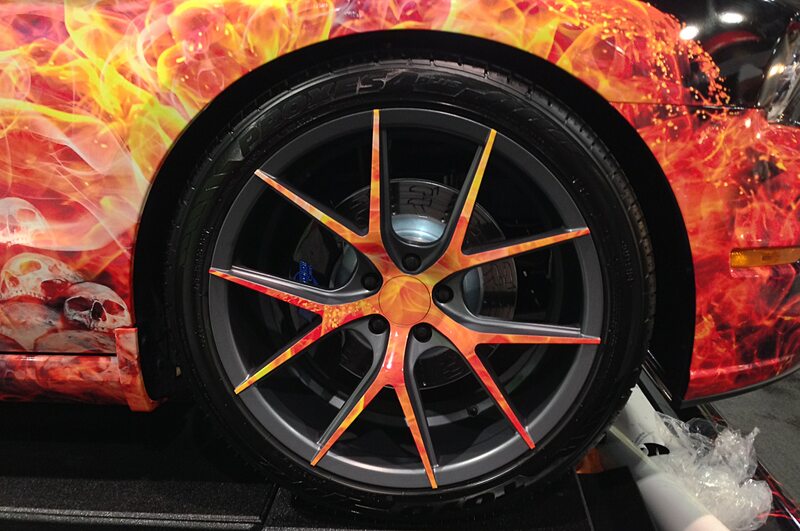 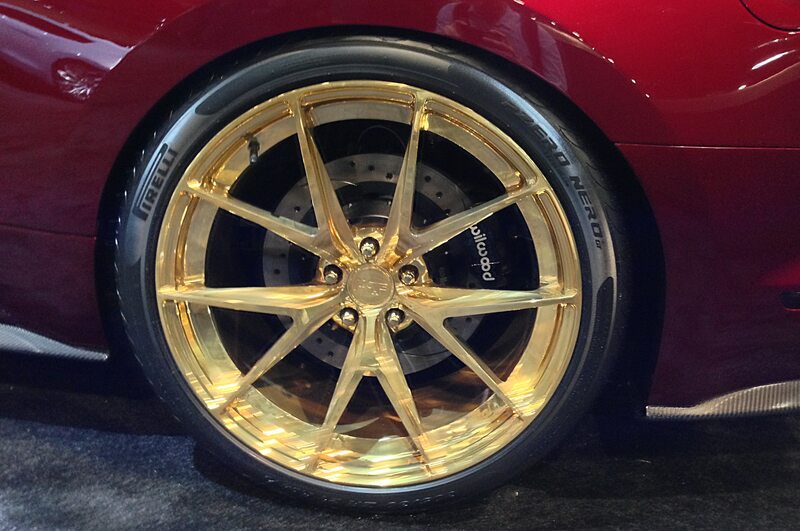 The tenacious Michelin Pilot Super Sport tires (275/35R-20 front, 305/30R-20 rear) enhance the car’s predictability. 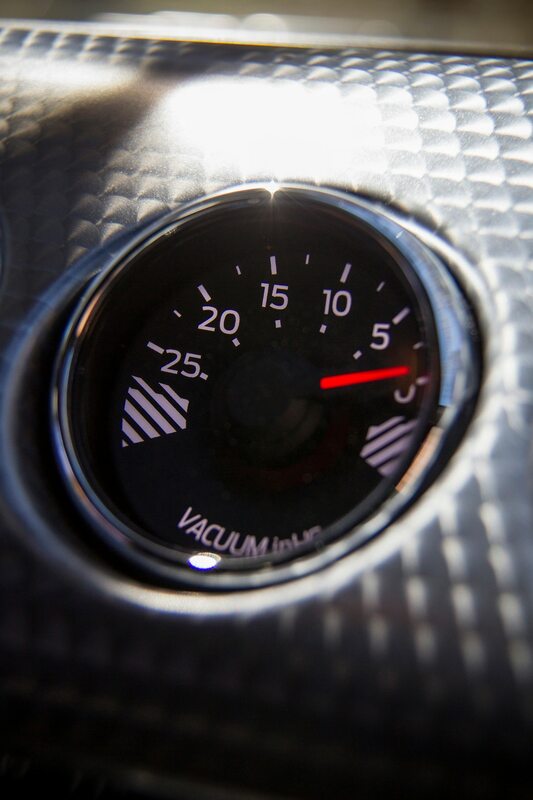 Then it’s back into the throttle as we sight the exit point and zoom forward. 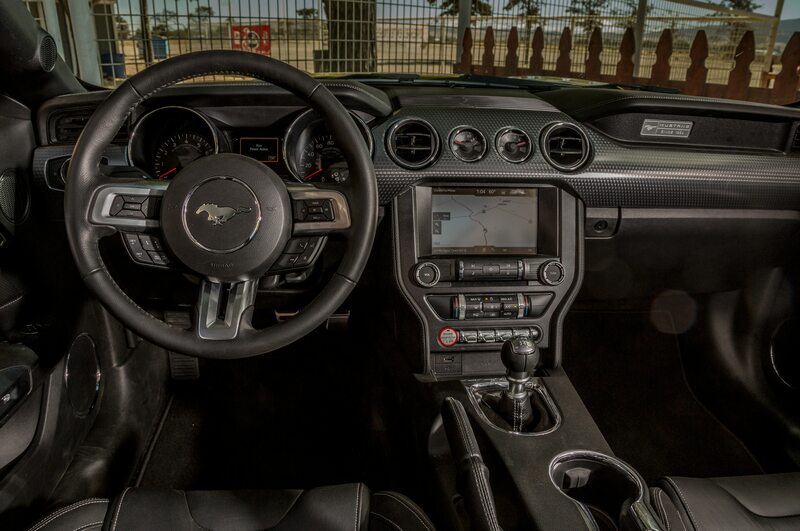 Finally returning to the pits, we feel every bit of exhilaration the $39,995 conversion (added to the Mustang GT’s $36,925 base price) would provide an owner. 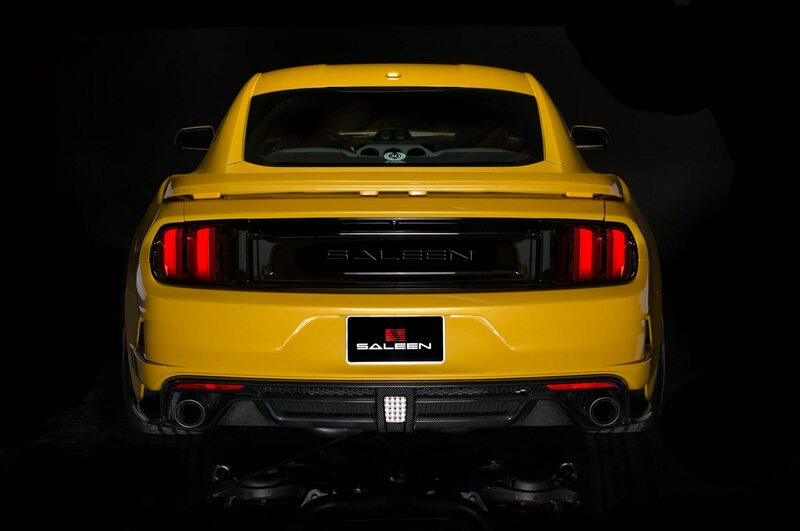 Keith Belair, Shelby American chief operating officer (and not a Chevy guy), claims the GT’s content, performance, and styling are available at a “value price,” and we can see it. 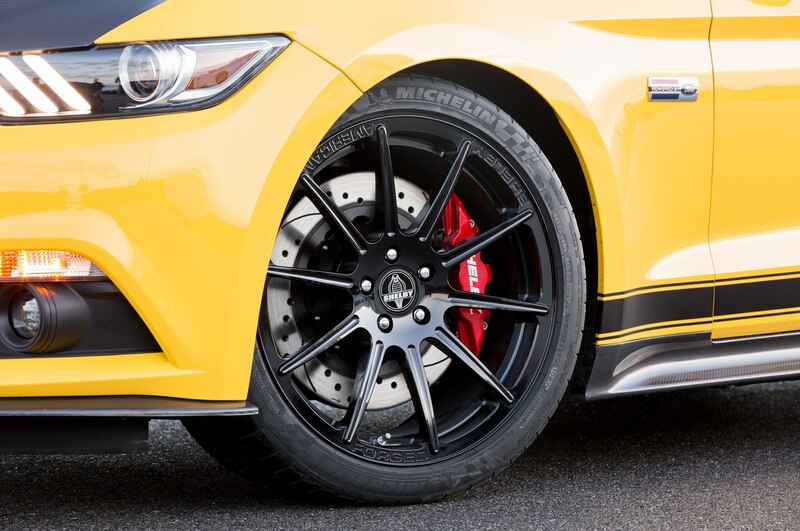 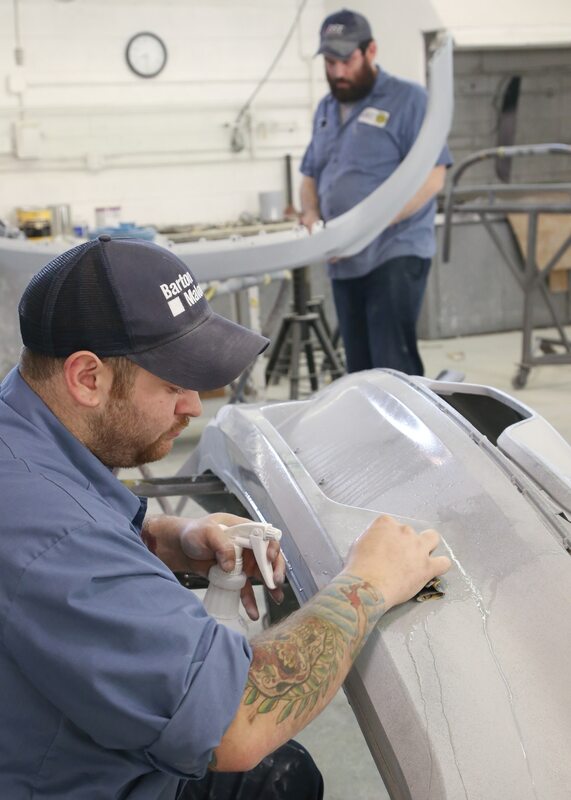 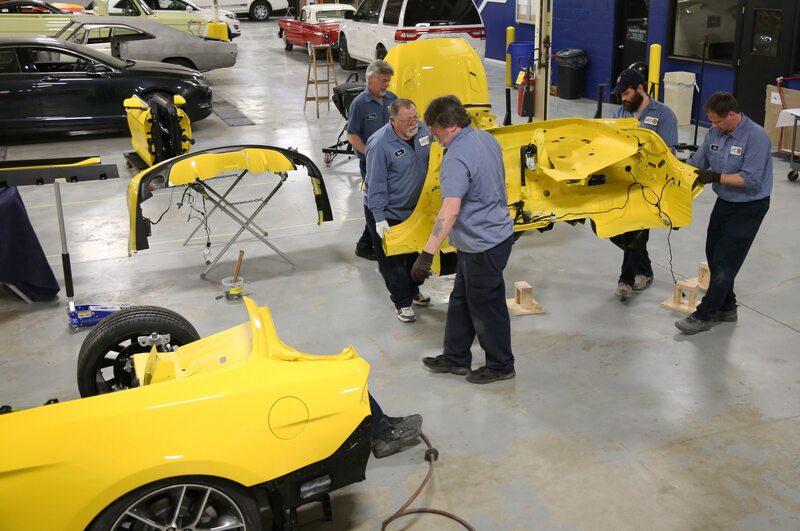 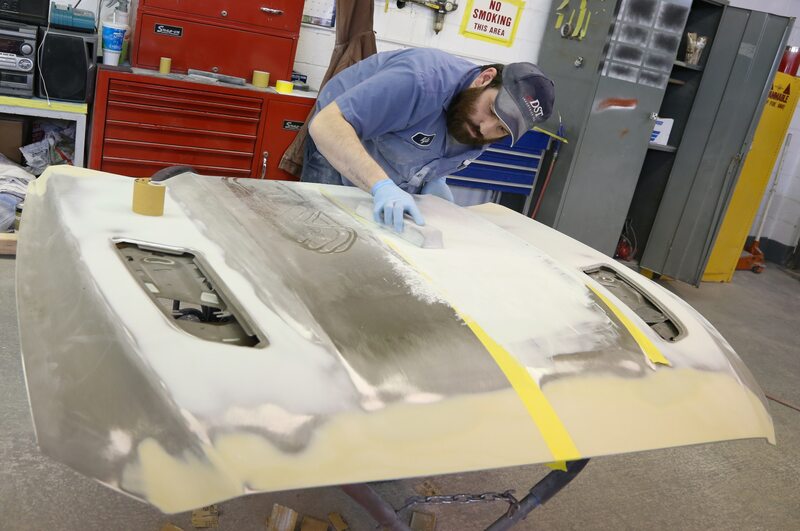 More than being just a trim package, the embellishments supplied by Ford Racing, as well as those developed with partners such as Carbon by Design and Weld Racing, add capability. 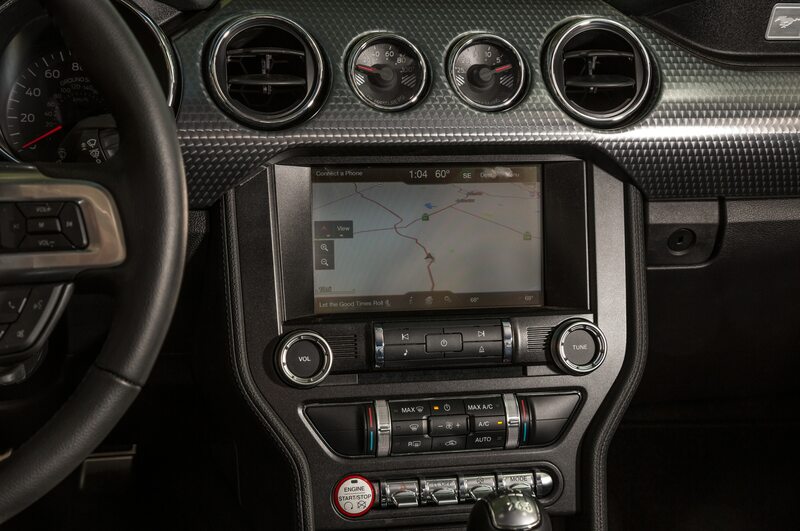 The development phase only started last July, yet its completeness makes the Chevrolet Camaro Z/28 look like part of Penn & Teller’s stage act and the Dodge Challenger SRT Hellcat like a specialist in one of Pahrump’s establishments. 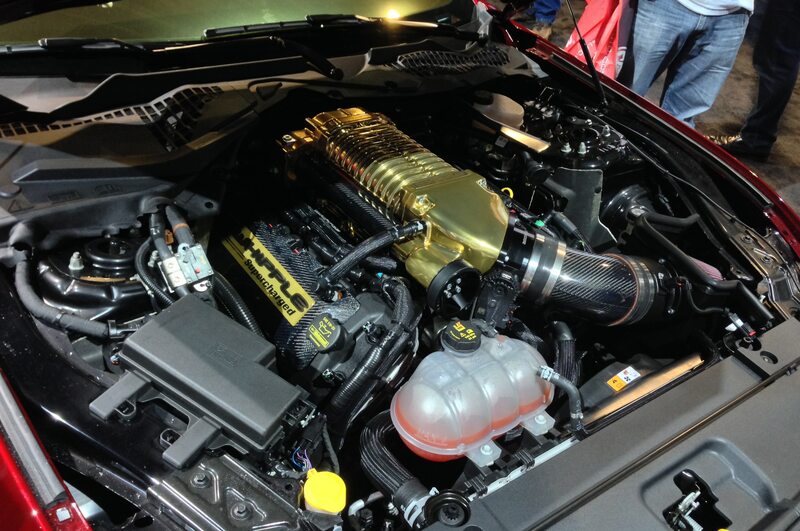 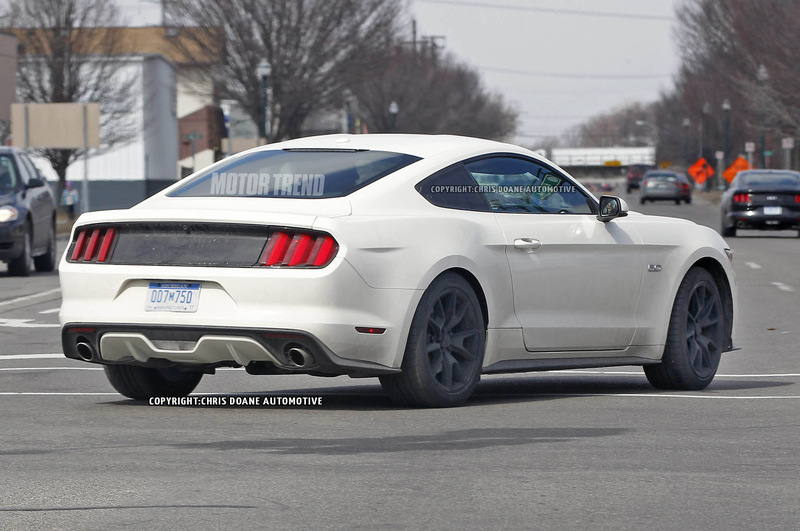 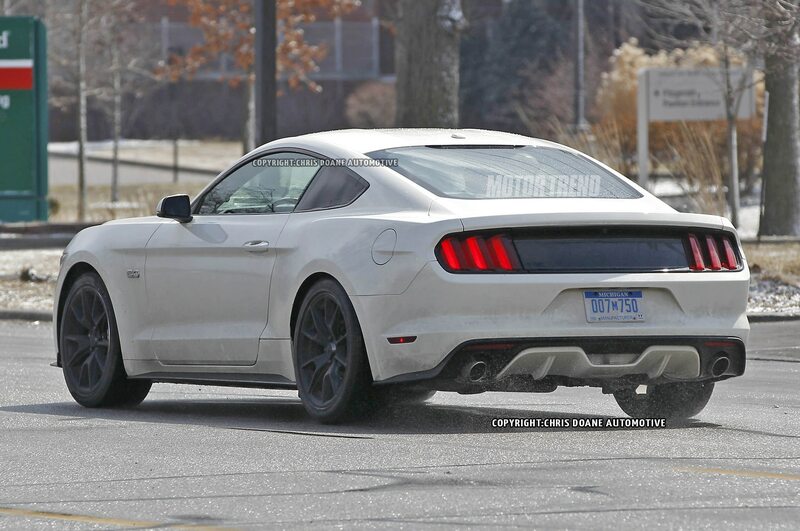 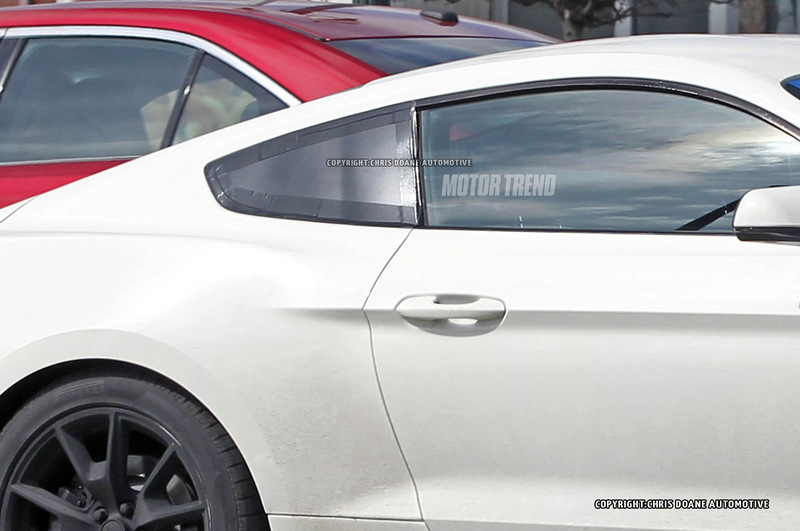 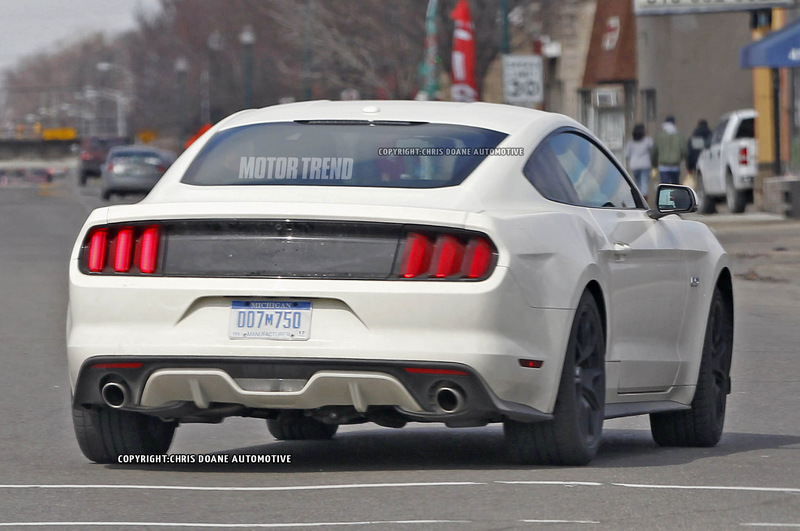 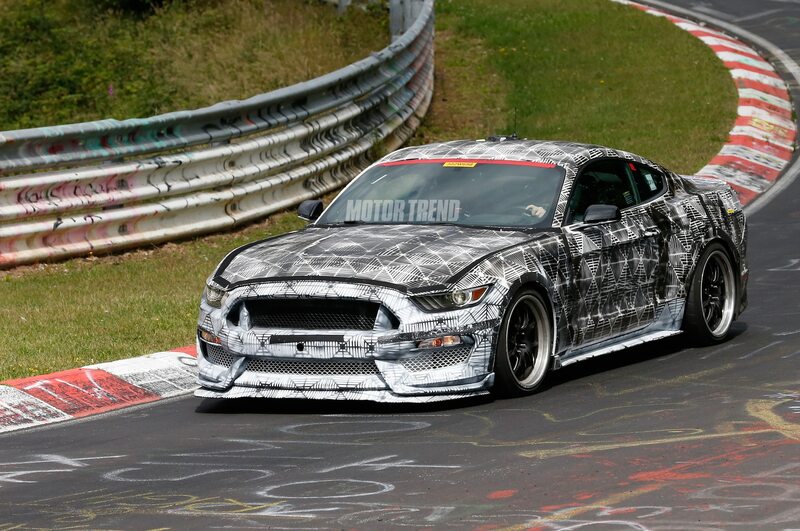 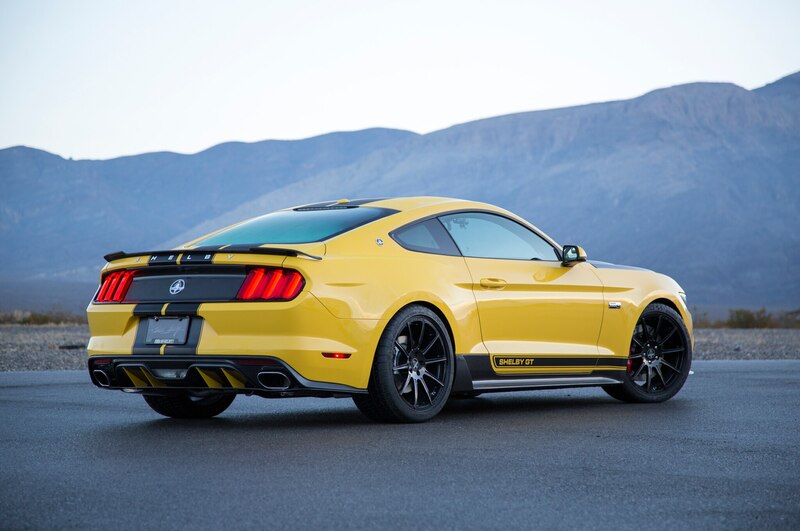 (We’ve yet to test another, somewhat closer competitor — the Ford Shelby GT350R Mustang developed by Ford engineers.) 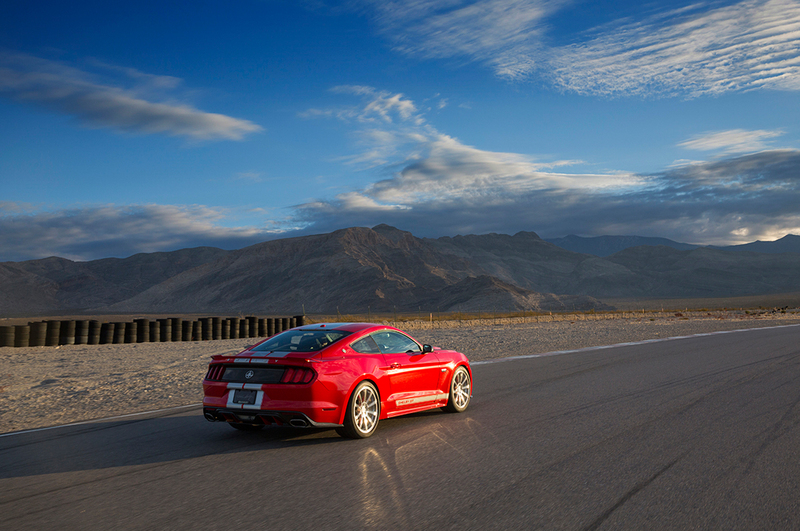 Although we only drove on the circuit, the Shelby GT’s amiability was apparent: It very well could be a daily driver. 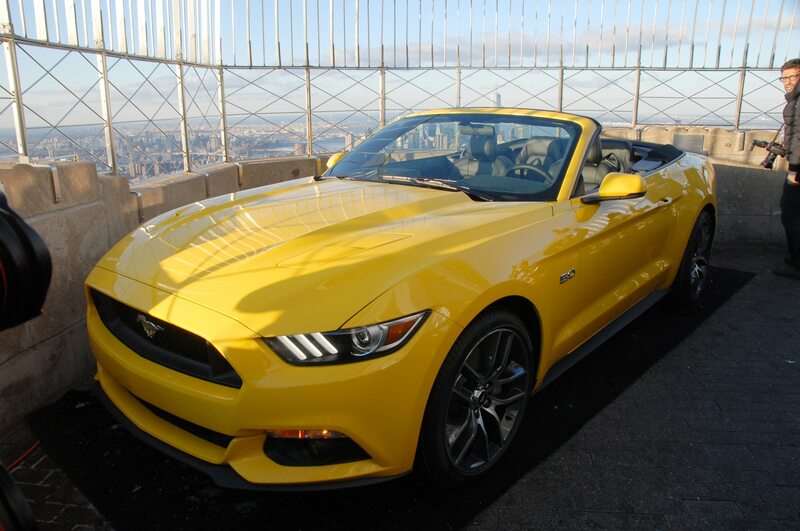 And what a distinctive car for going to the office! 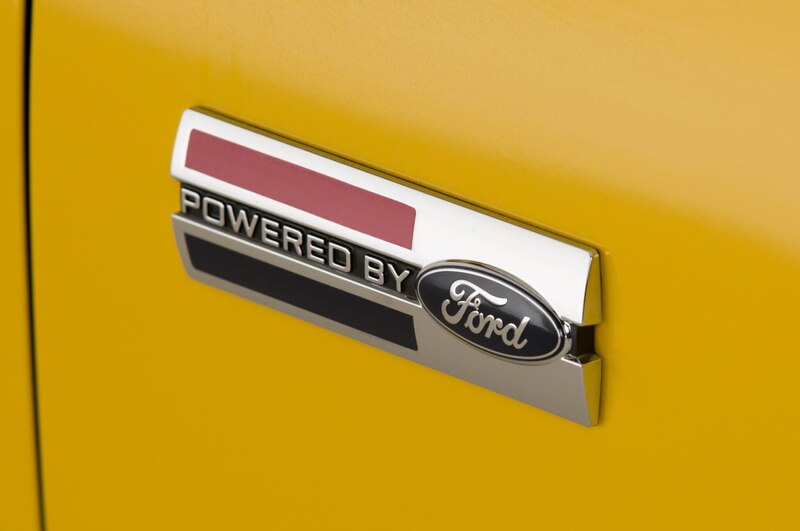 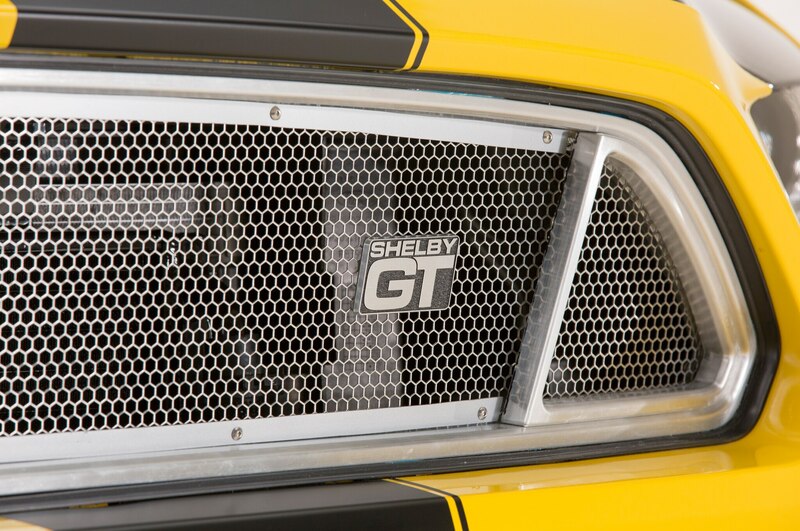 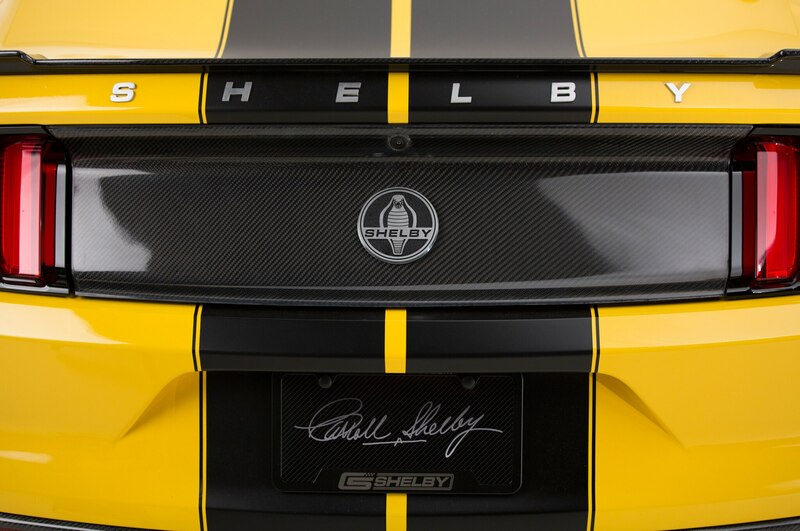 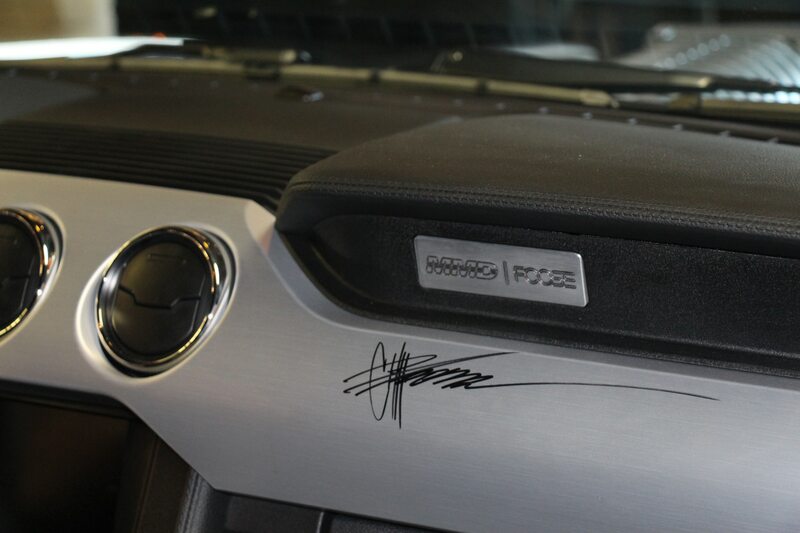 Shelby lettering on the trunklid, “Powered by Ford” fender badges, and a GT label on the billet aluminum grille reveal the unique identity. 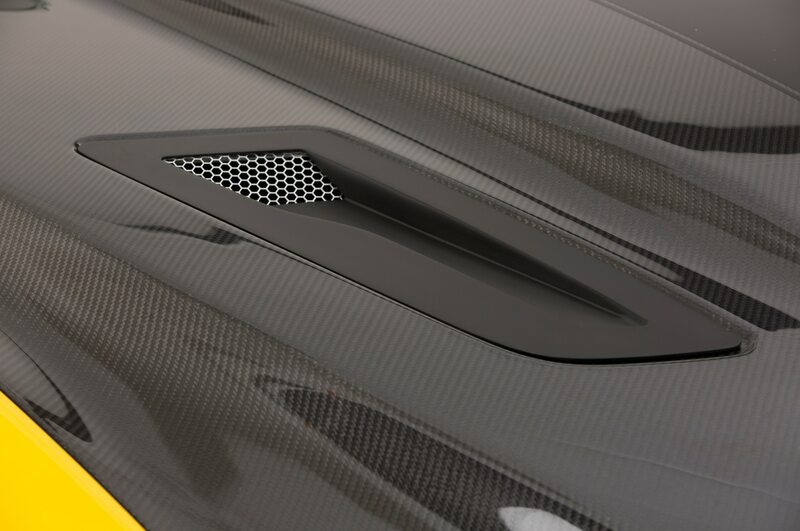 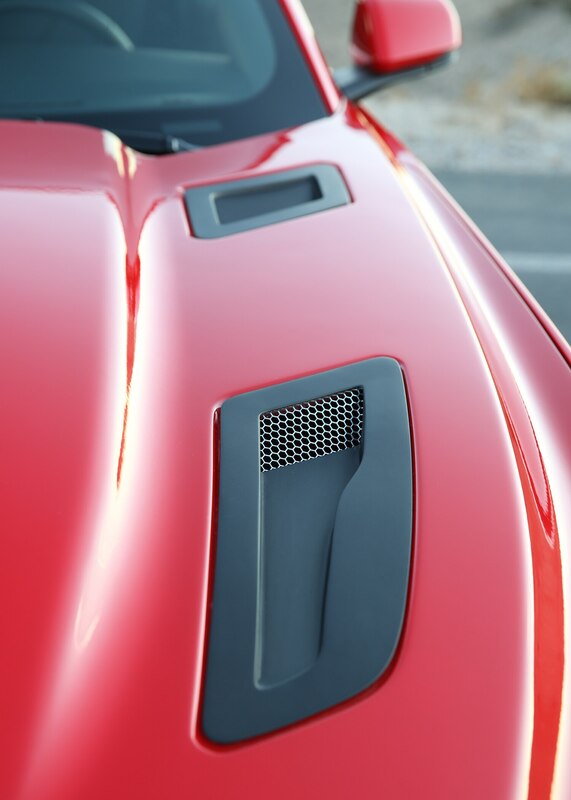 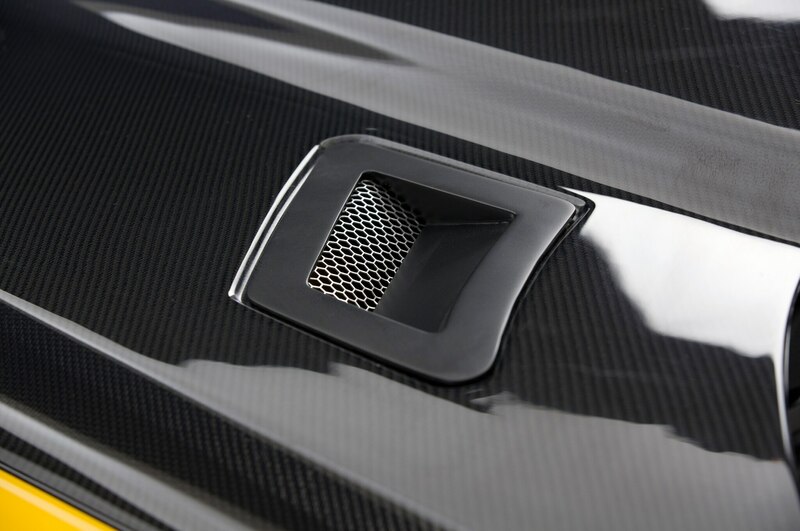 The bulging carbon-fiber hood (with customizable vents); decklid with spoiler; and full surround of splitter, rockers, and diffuser may or may not amplify the statement, depending on whether they’re left in carbon black or painted to match the body. 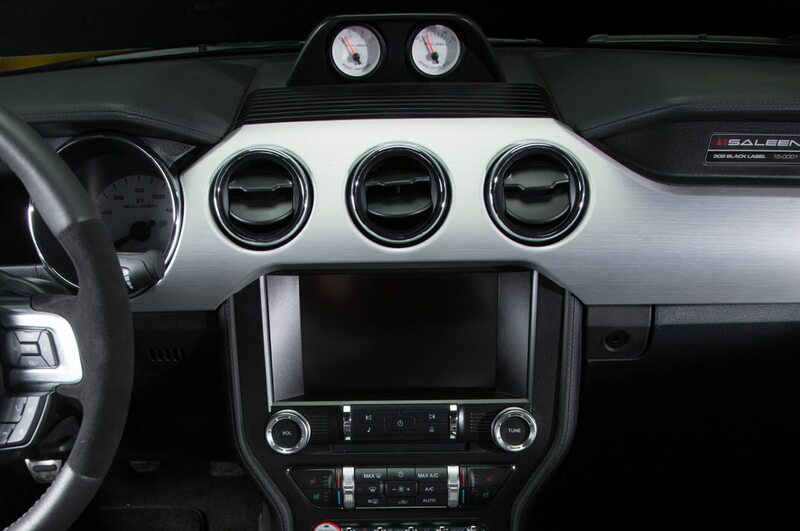 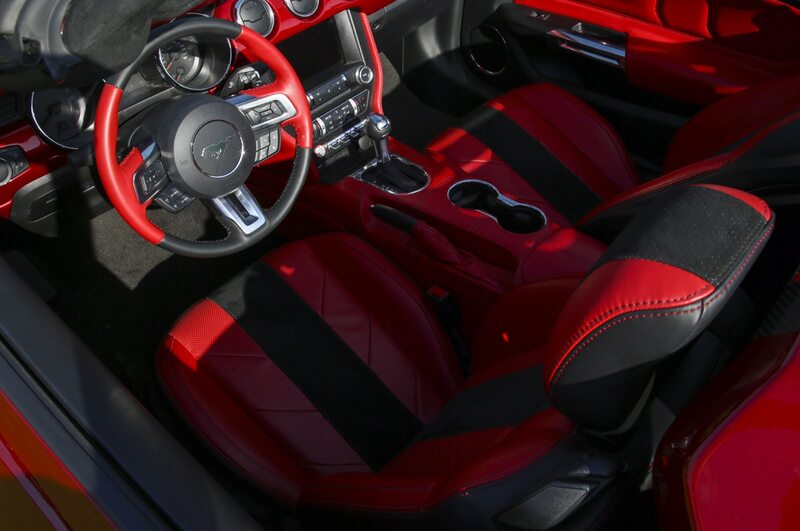 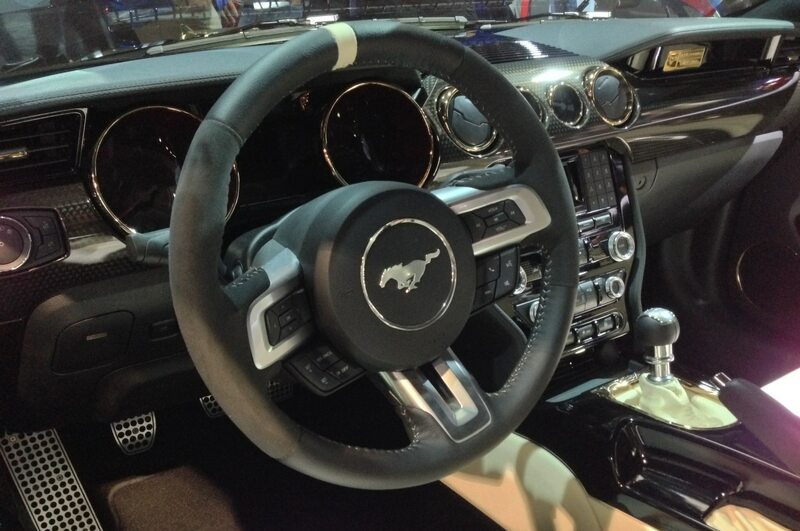 Inside the cabin, headrests emblazoned with the Shelby name and a gauge pod on the upper dash are obvious. 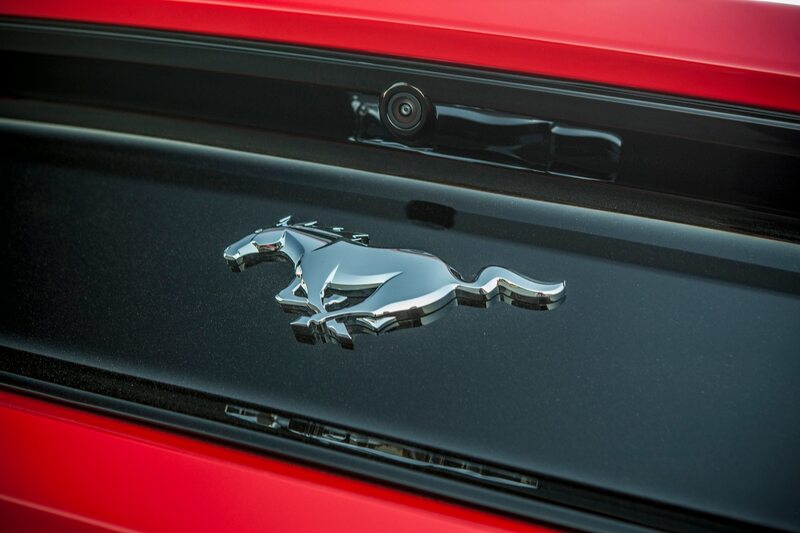 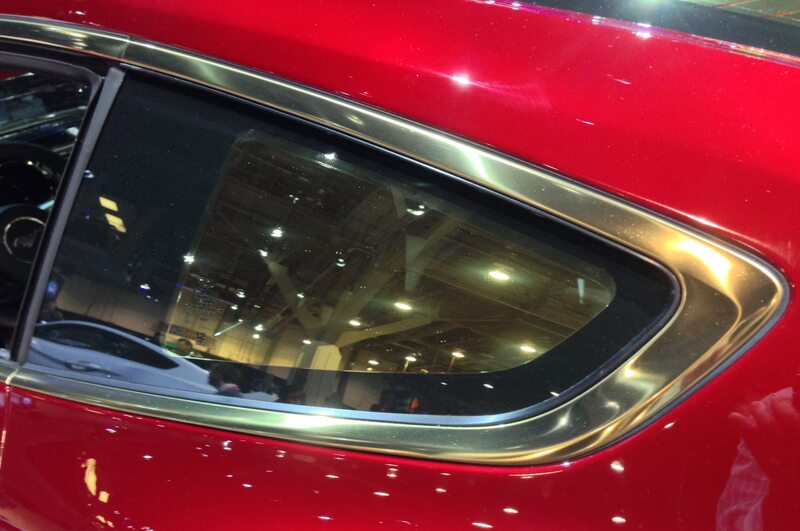 Too bad about the stock plastic door panels, which diminish the spirit. 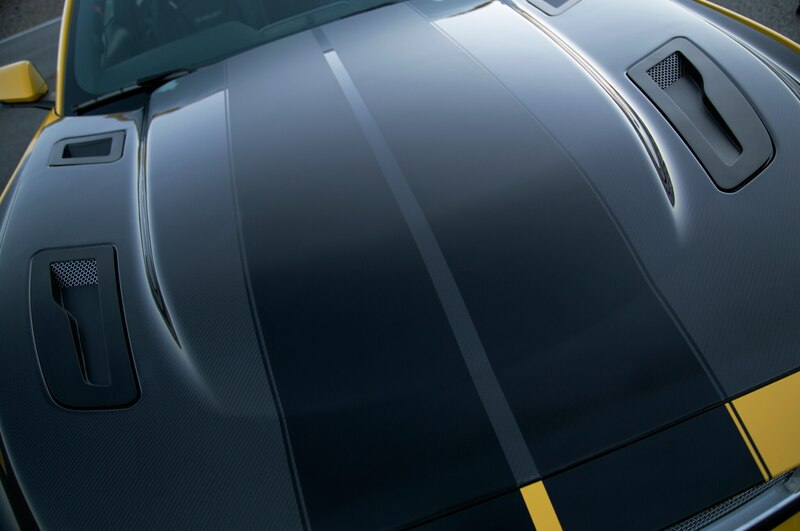 Supporting it all is the fortified suspension. 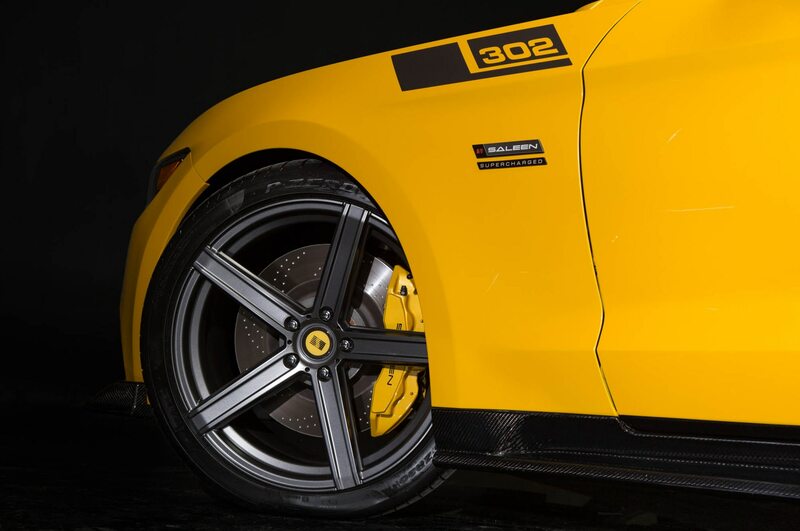 Elegant, forged-alloy Venice Weld wheels pay tribute to Shelby’s commercial beginnings in a shop in L.A.’s Venice neighborhood. 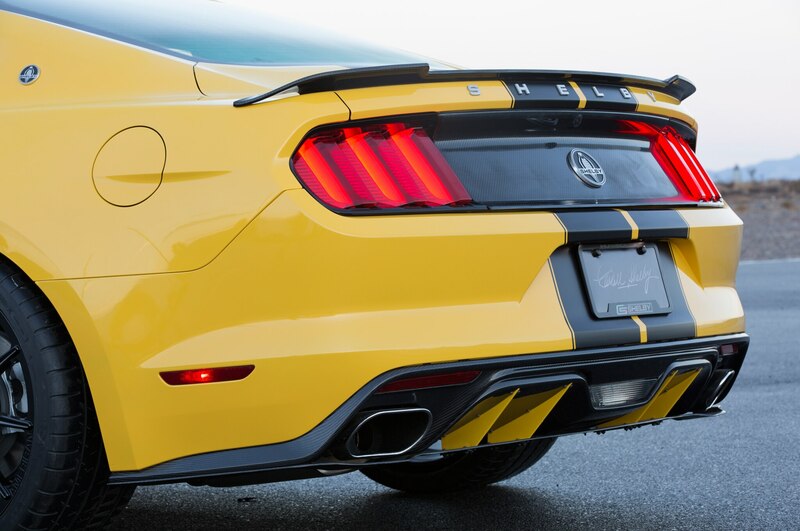 Even greater distinction comes from options that increase engine output beyond 700 hp, upgrade the rear brakes with four-piston calipers, and fully customize interior seating. 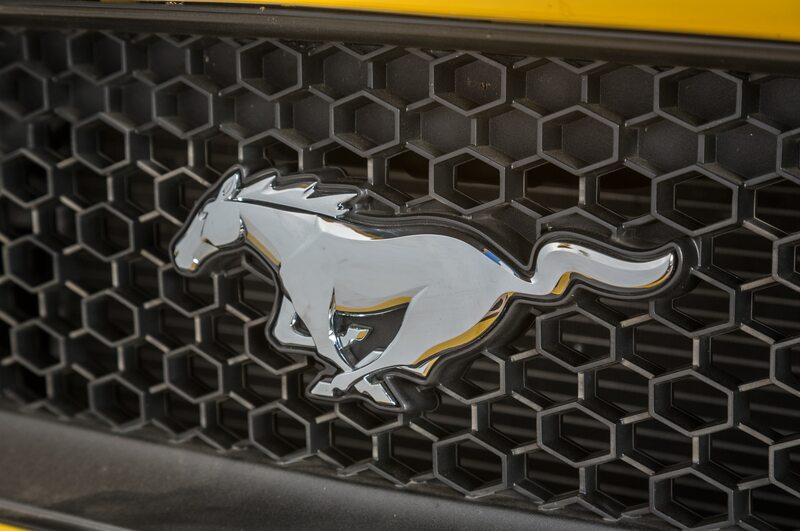 The modular front grille can incorporate foglamps; the subsequently vacant front corners are fitted with carbon-fiber air intakes to additionally cool the front brakes. 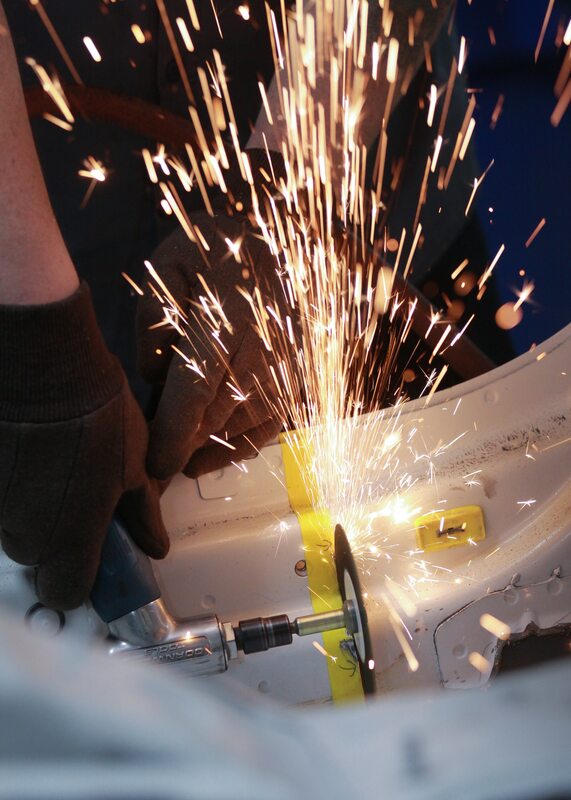 Even more aggressive suspension pieces can be specified. 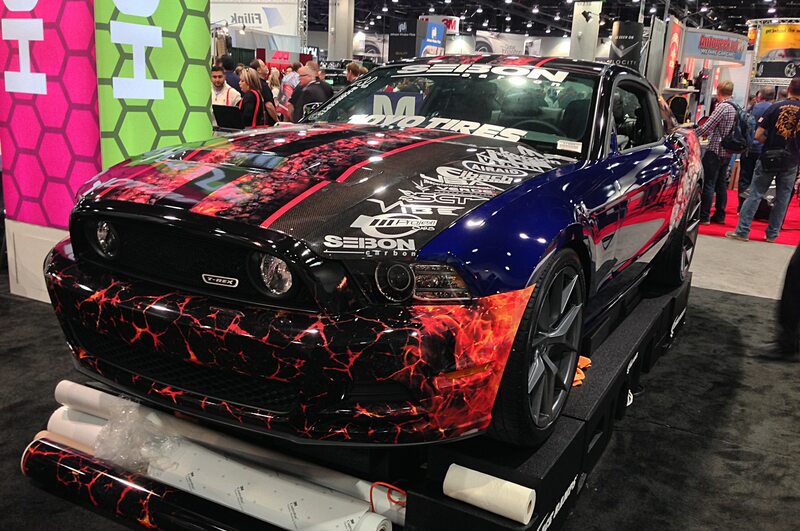 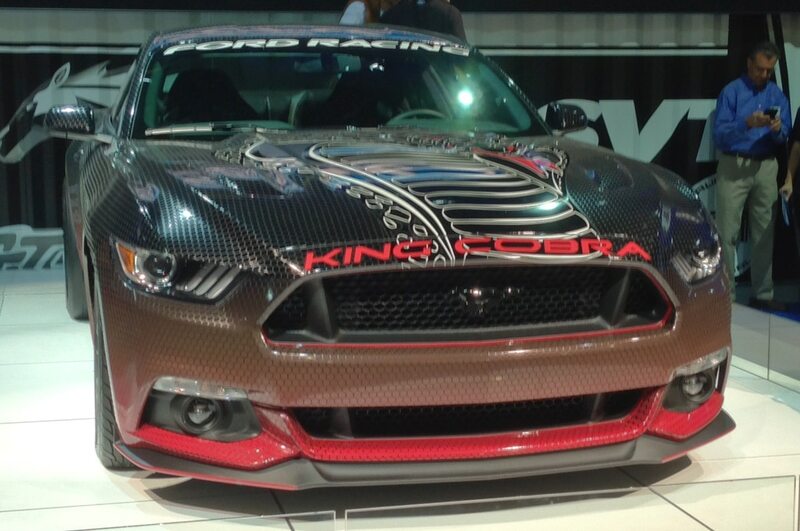 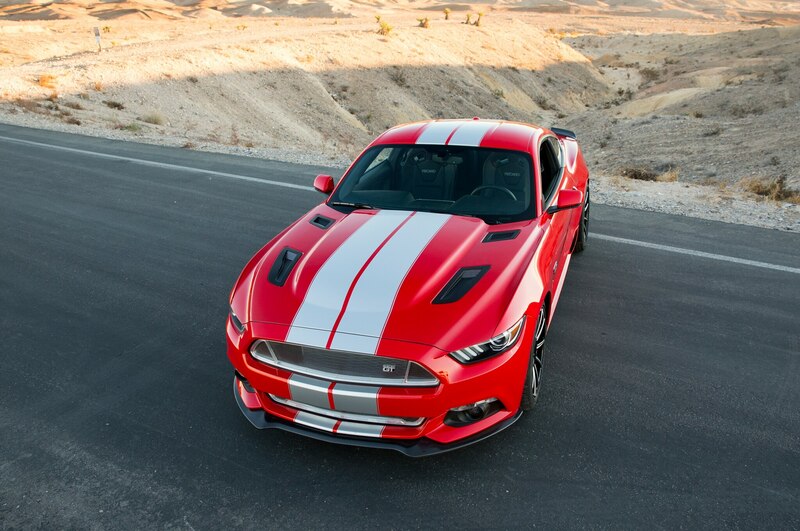 And the plethora of choices in striping and graphics means no two Shelby GTs need look alike. 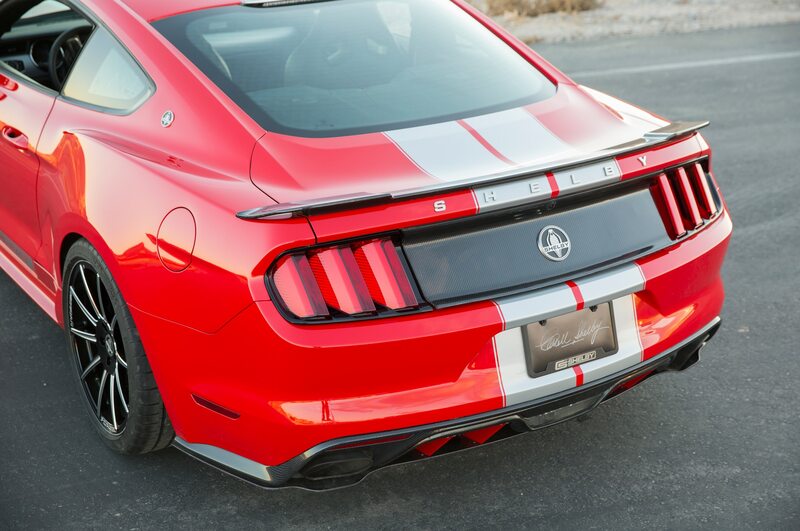 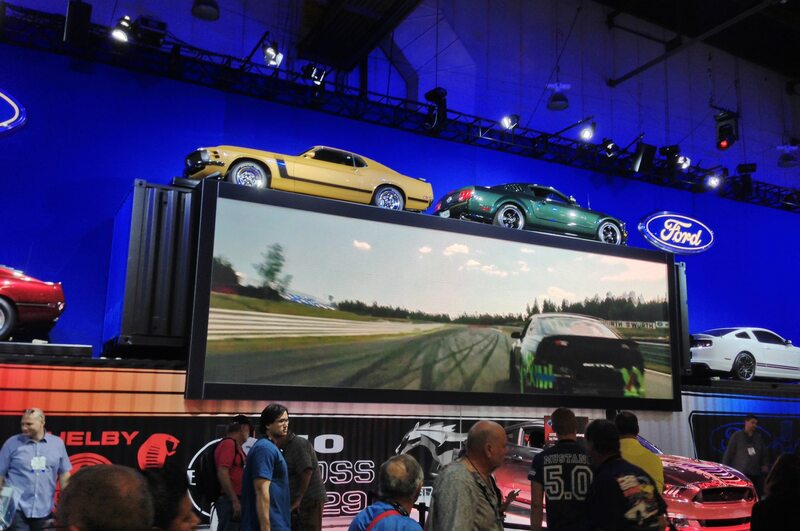 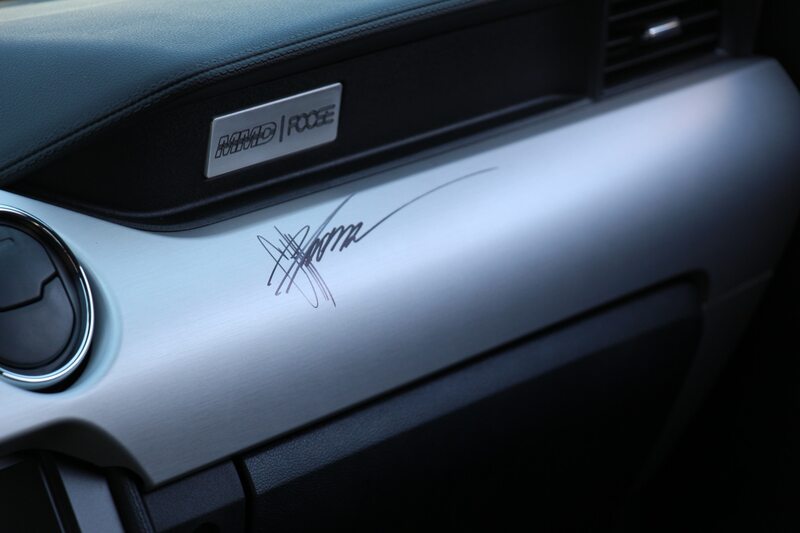 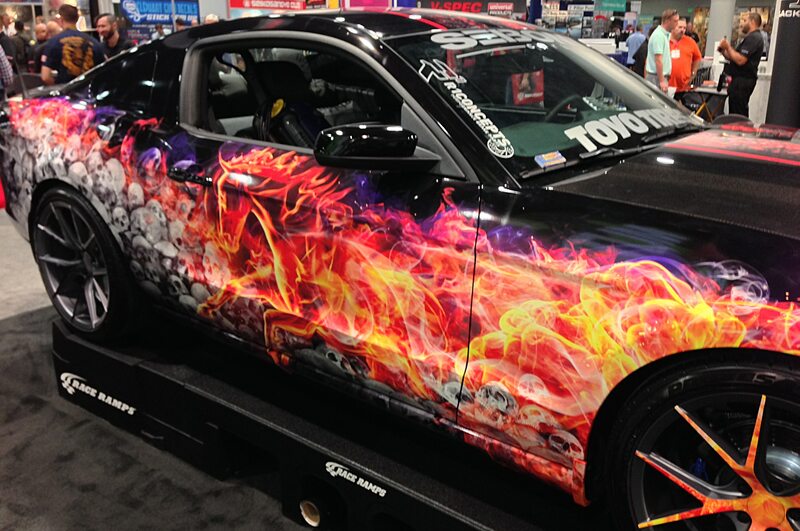 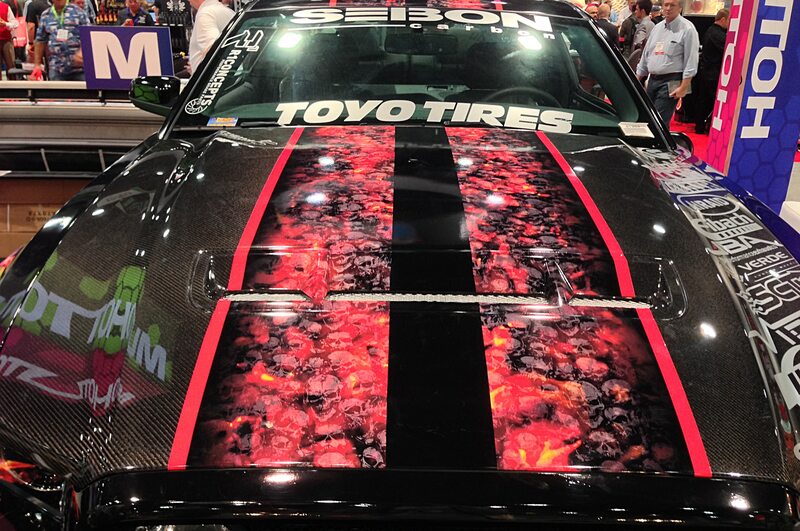 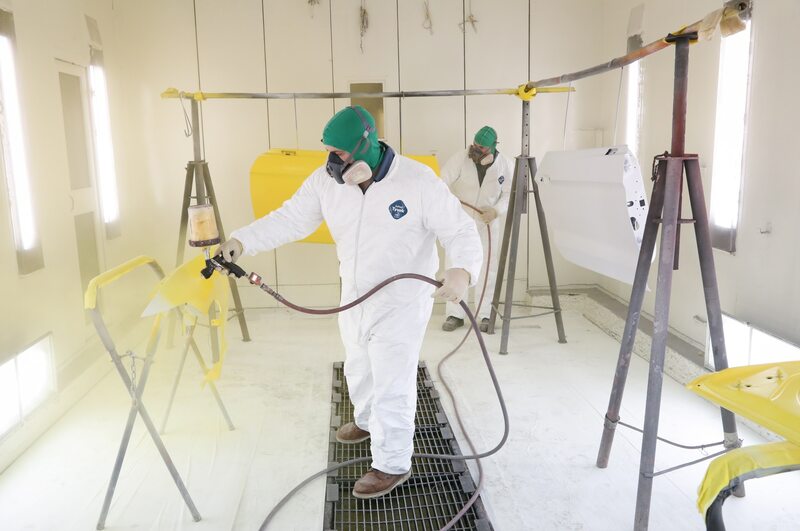 Top it all off with a Las Vegas delivery experience that allows the buyer to add to the factory’s signature wall before having a track experience like ours. 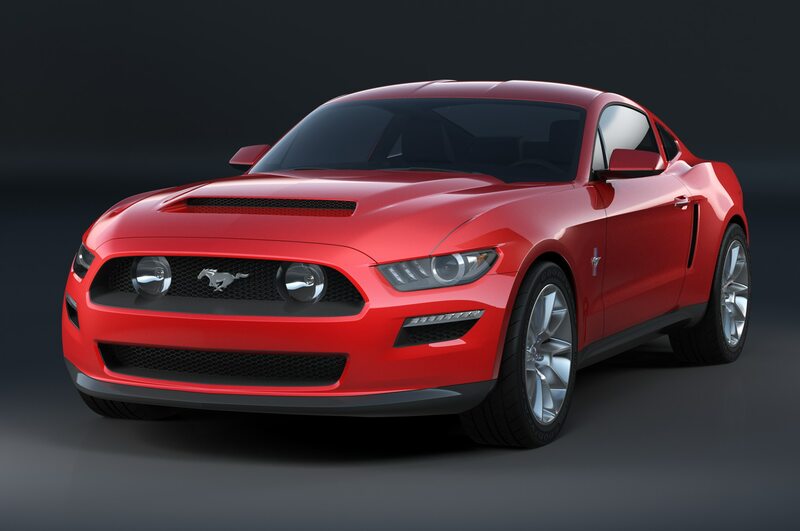 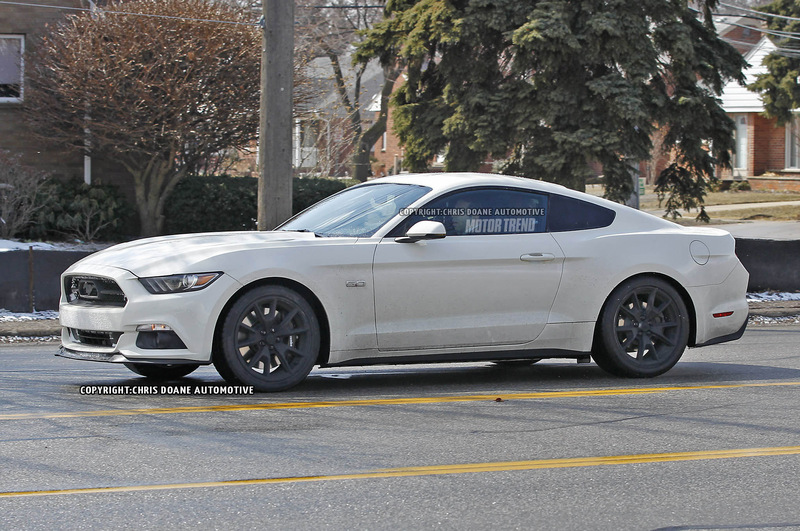 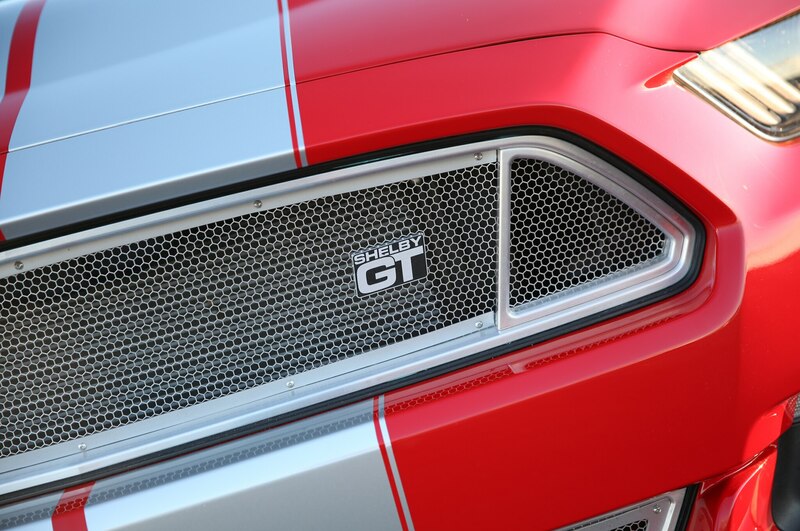 As Belair notes, the 2015 Mustang is marketed globally, so the 2015 Shelby American GT has international potential, too. 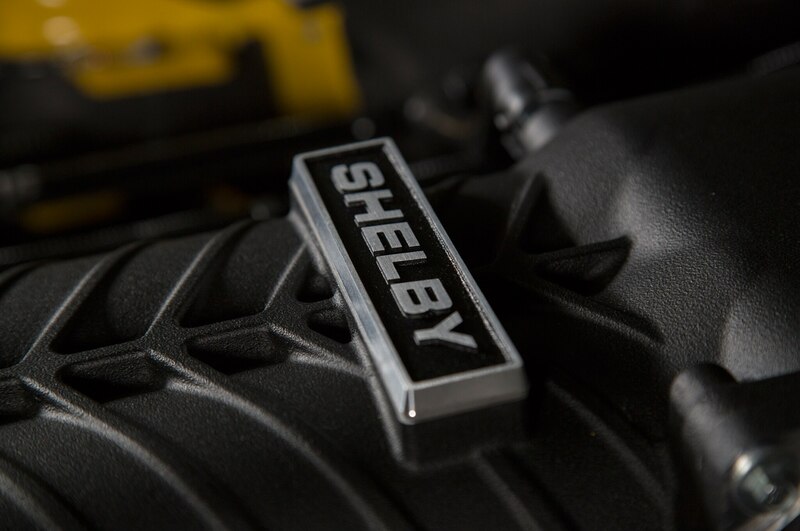 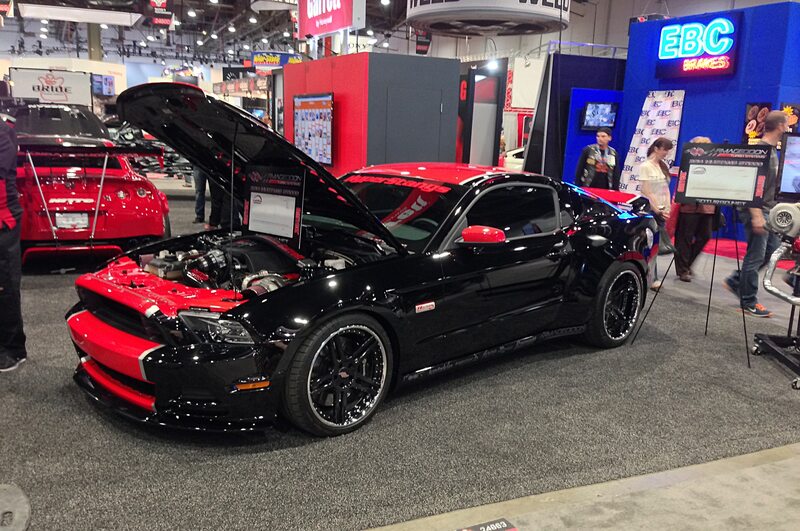 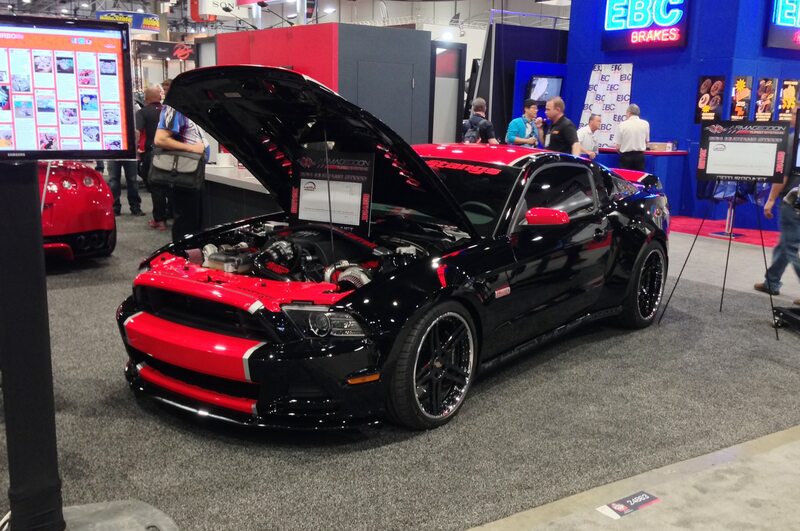 Shelby American is setting up installation points in the United Kingdom, Australia, and elsewhere and will ship parts to meet demand. 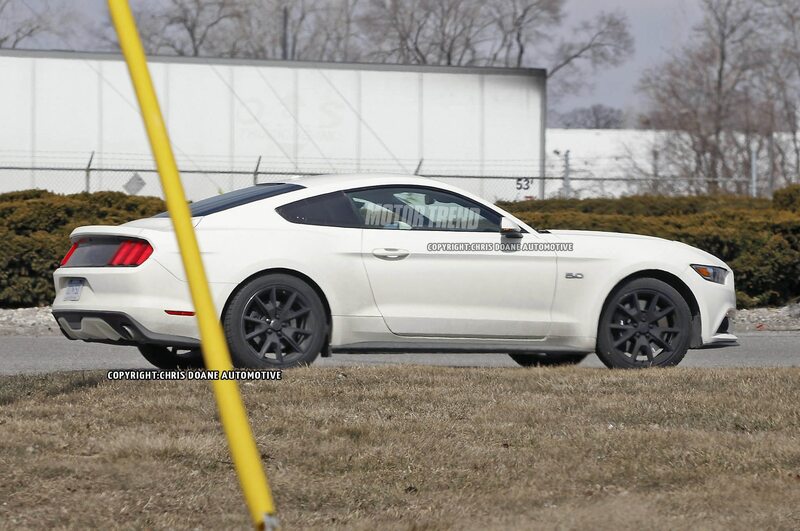 Meantime, in 2015, it expects to build 400 cars at 6405 Ensworth St., where it has been located for about a year. 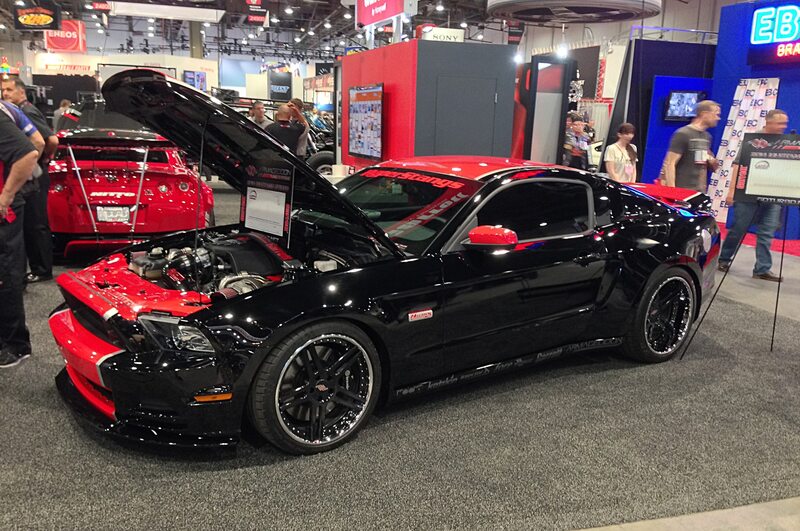 It still seems strange that the Las Vegas Strip traffics in something other than cocktails, showgirls, and jackpots. 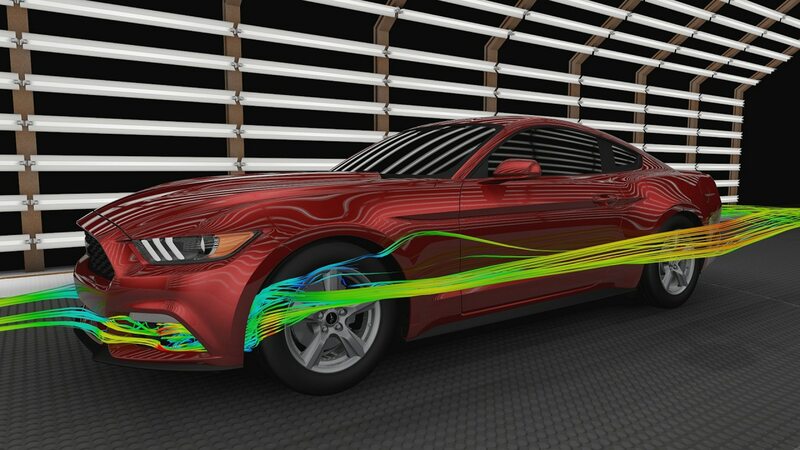 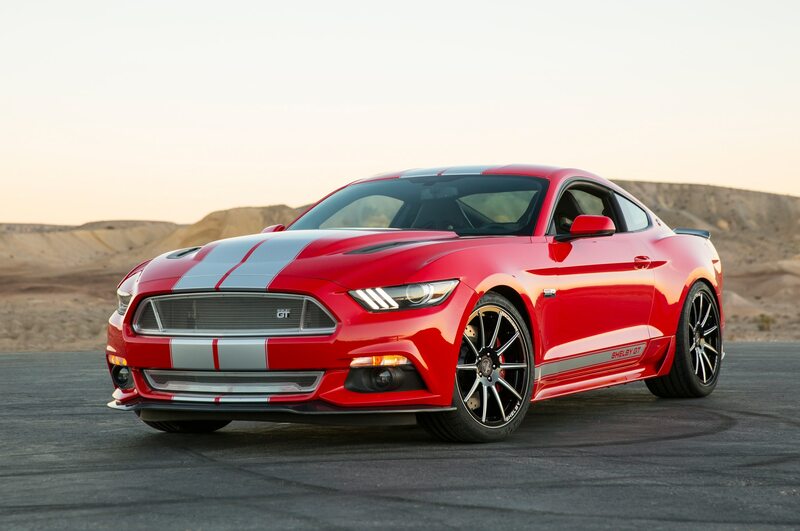 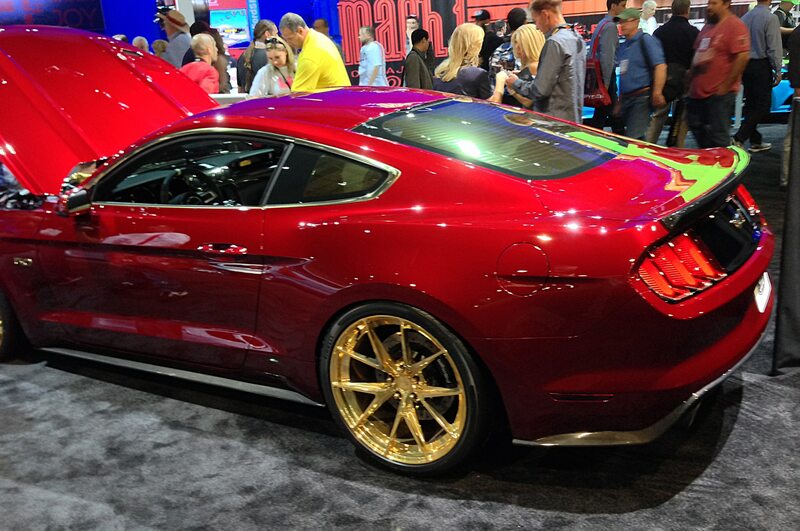 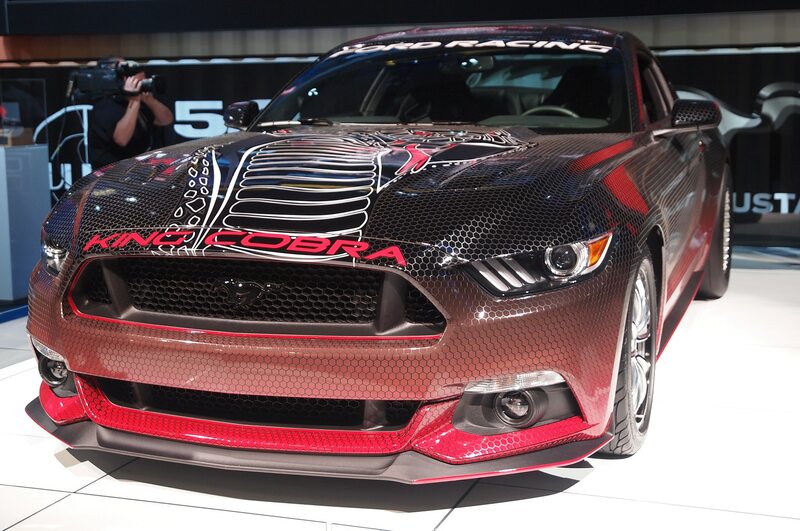 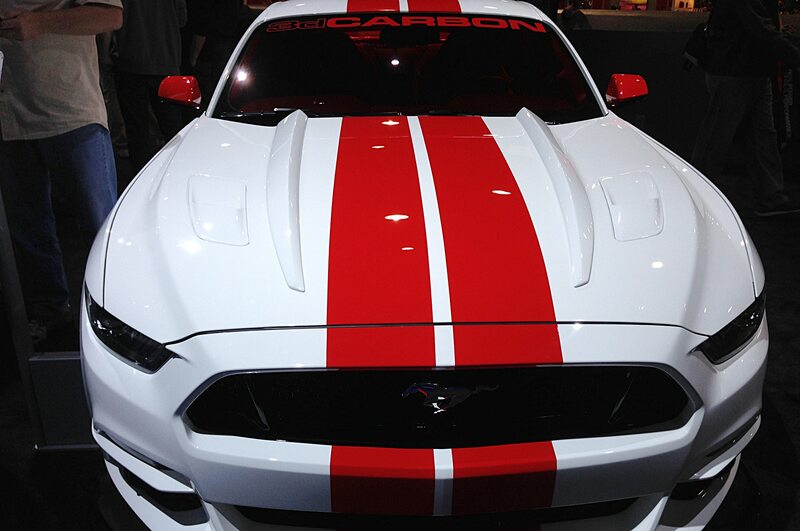 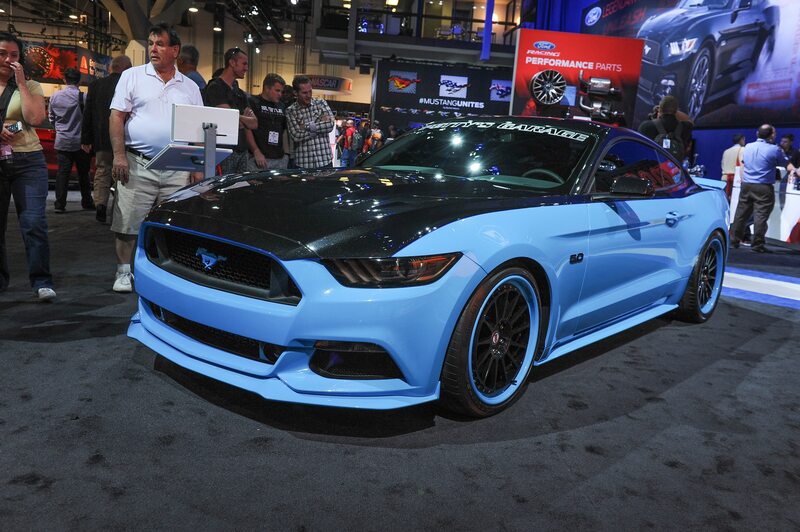 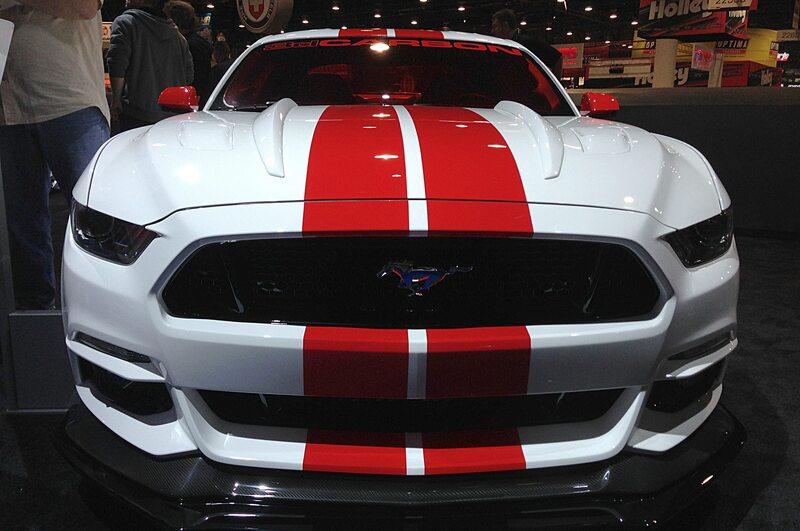 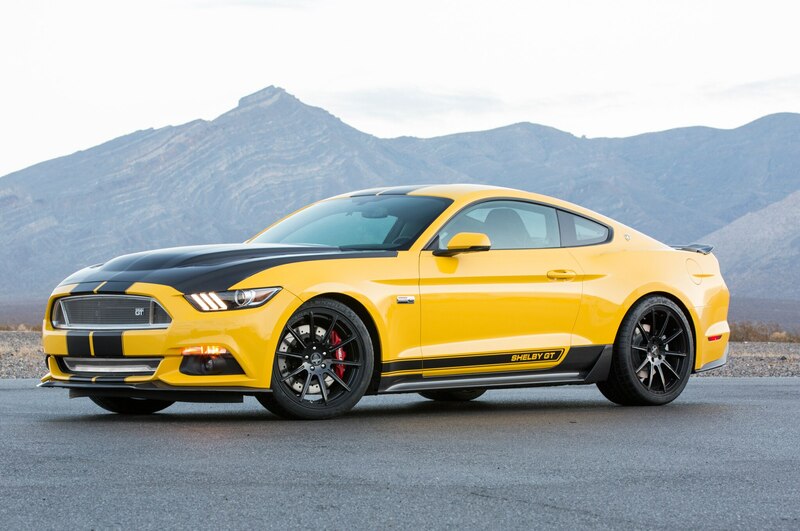 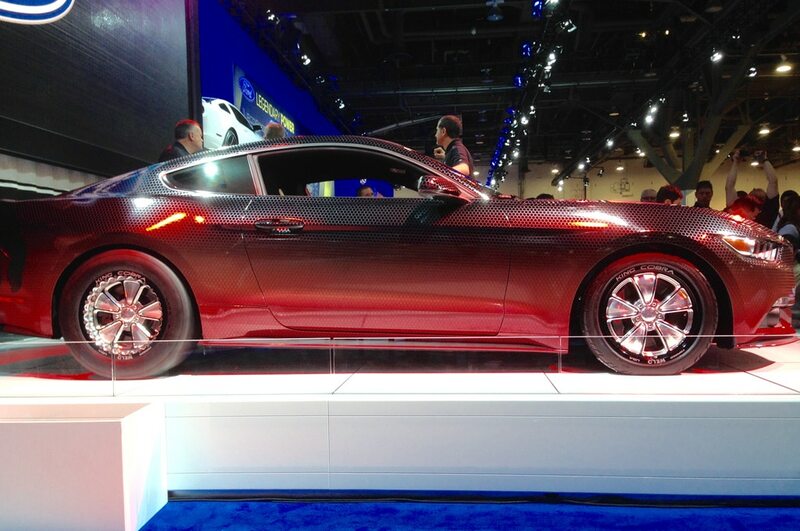 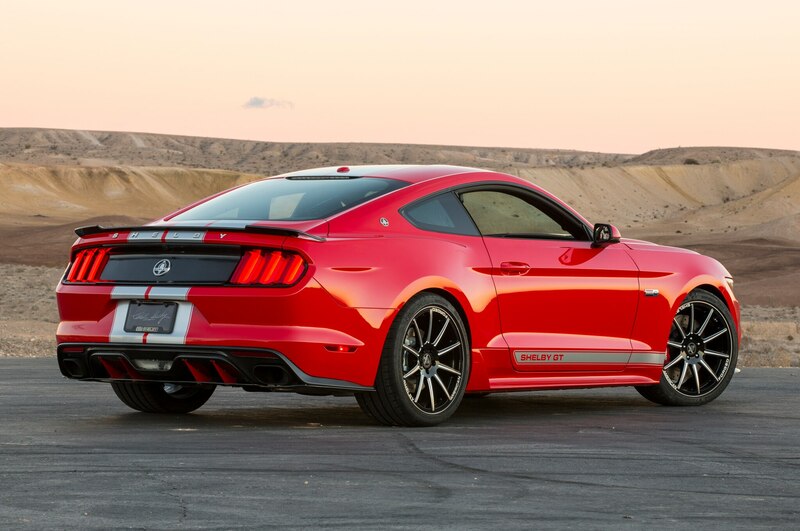 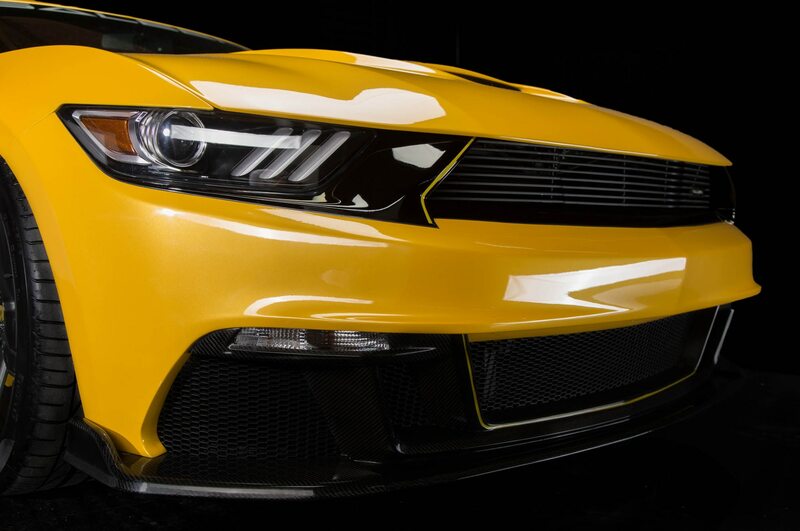 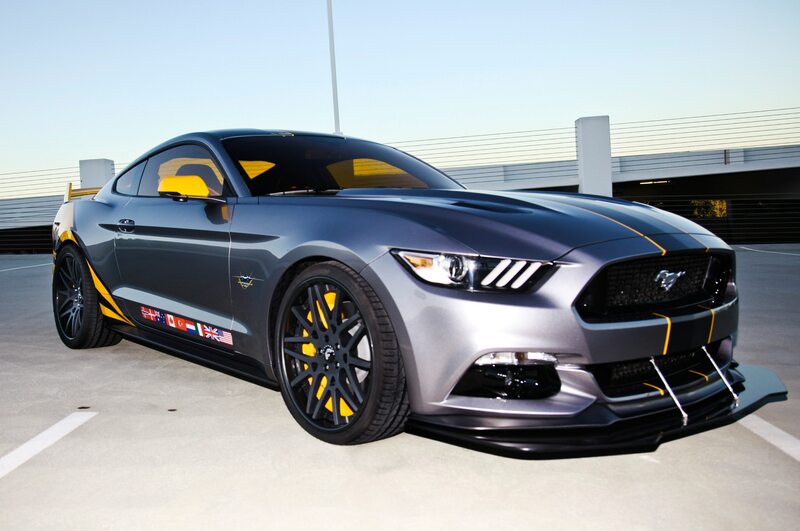 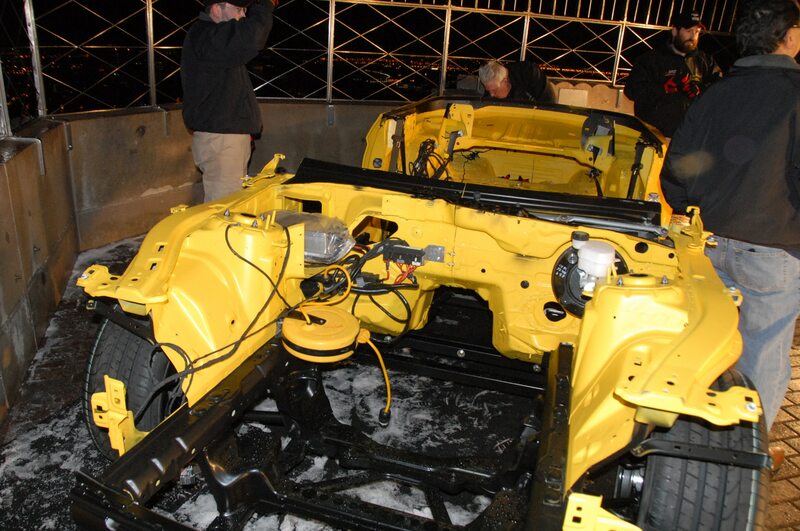 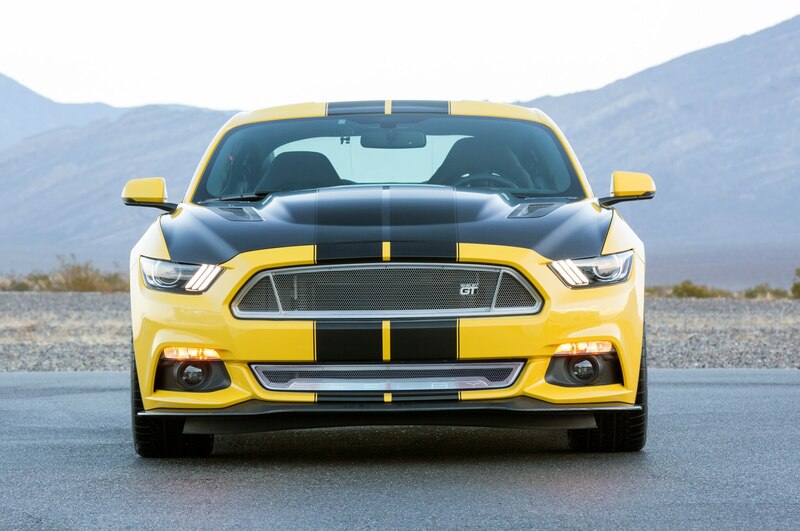 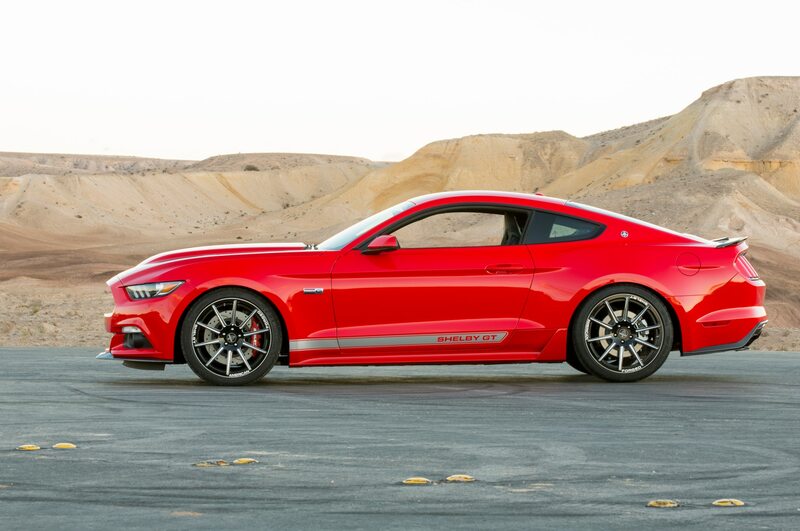 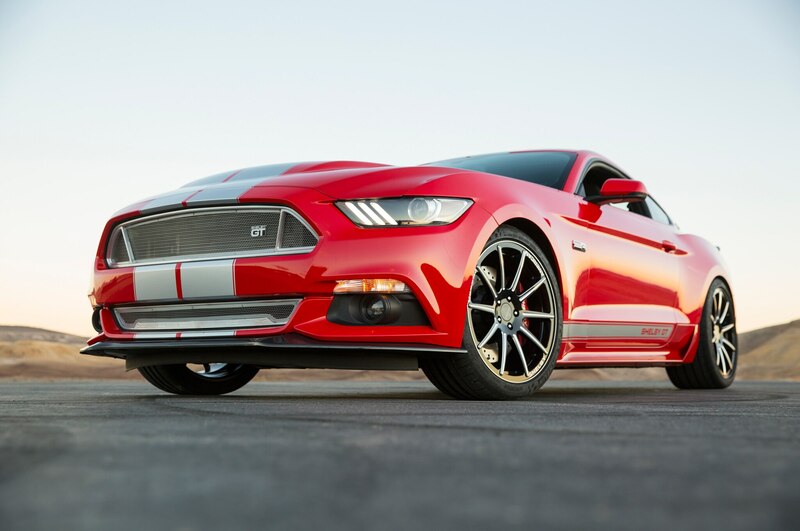 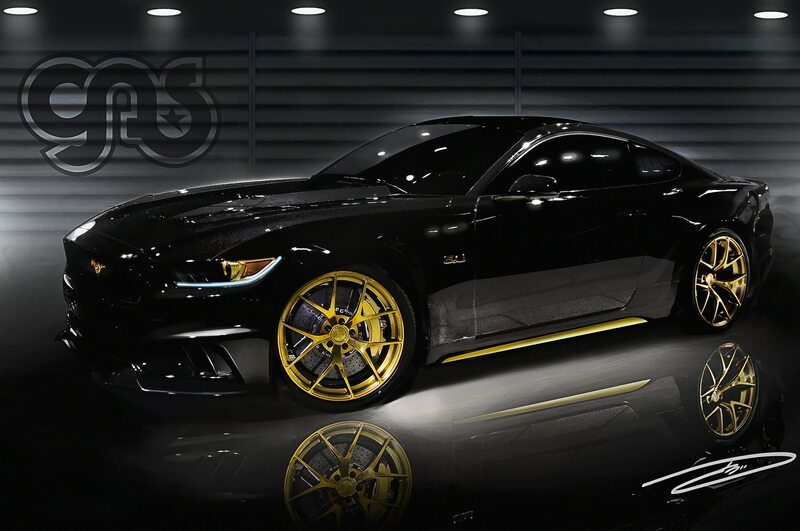 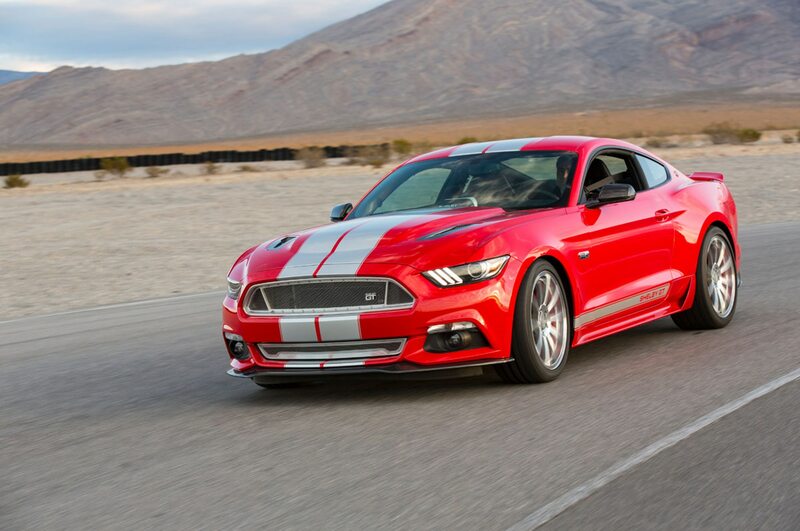 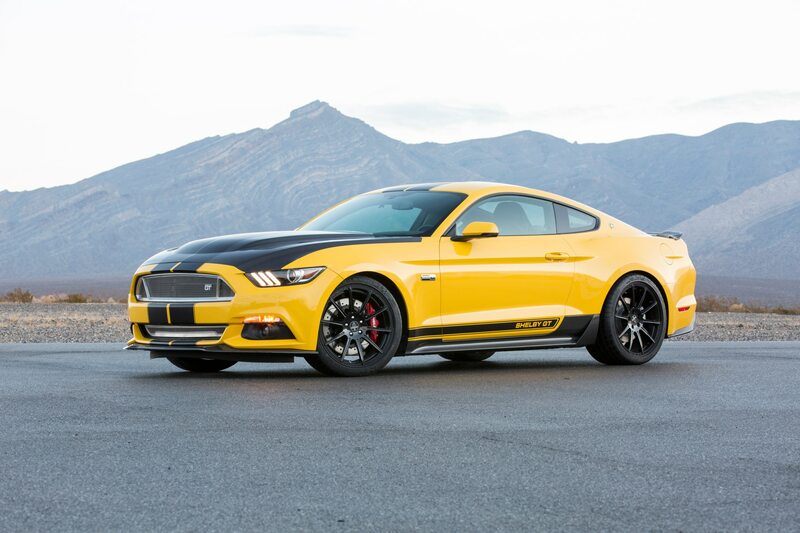 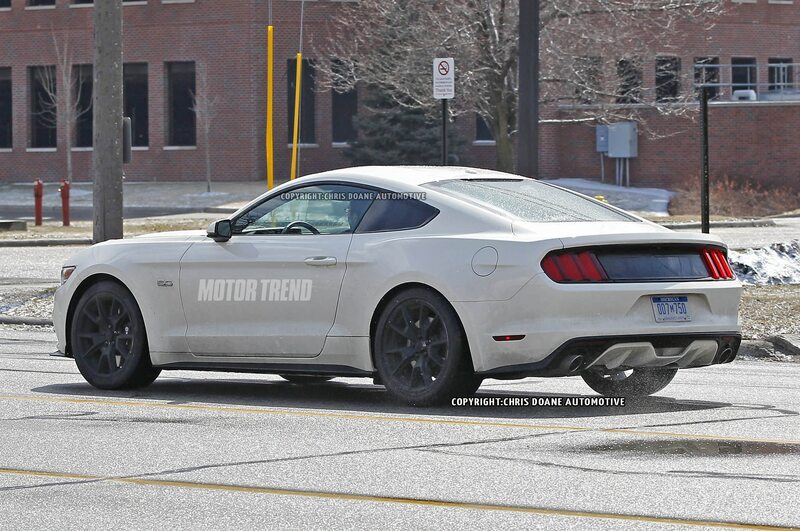 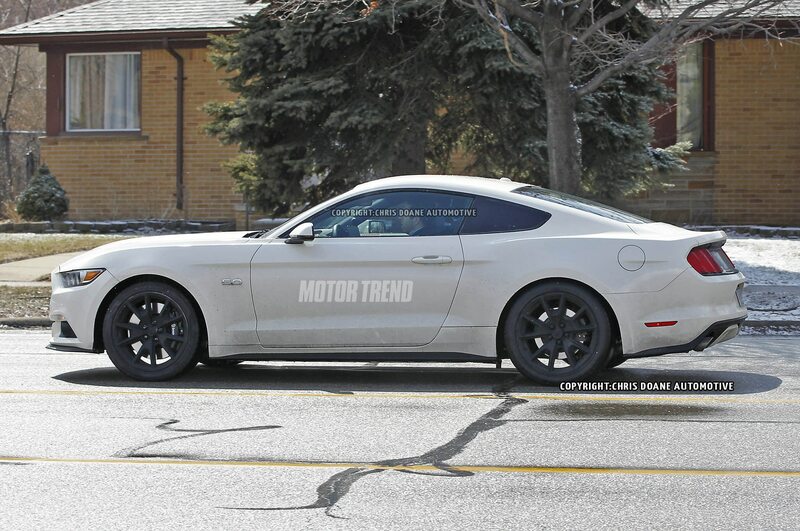 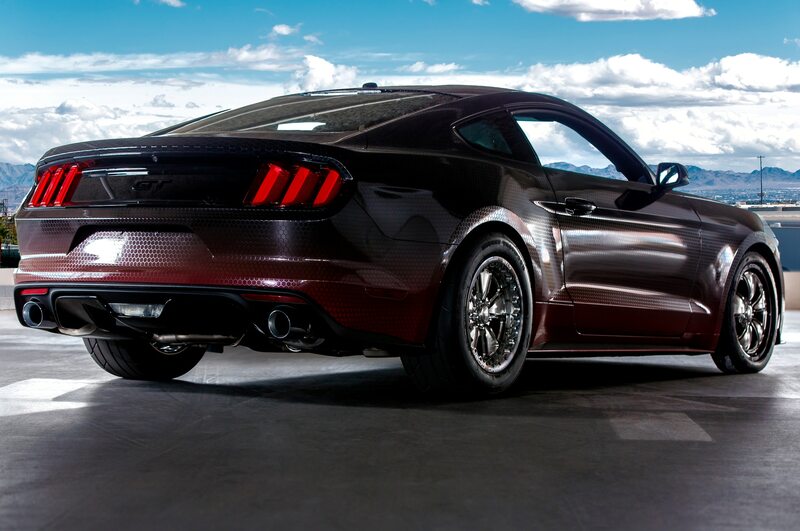 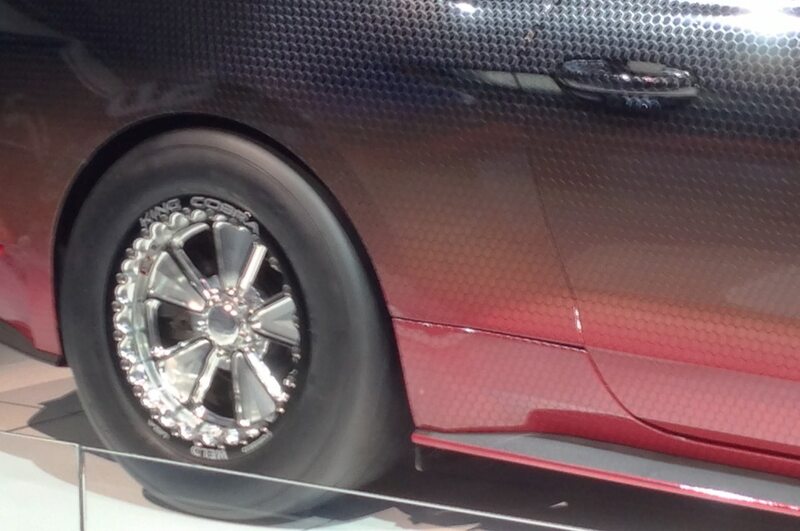 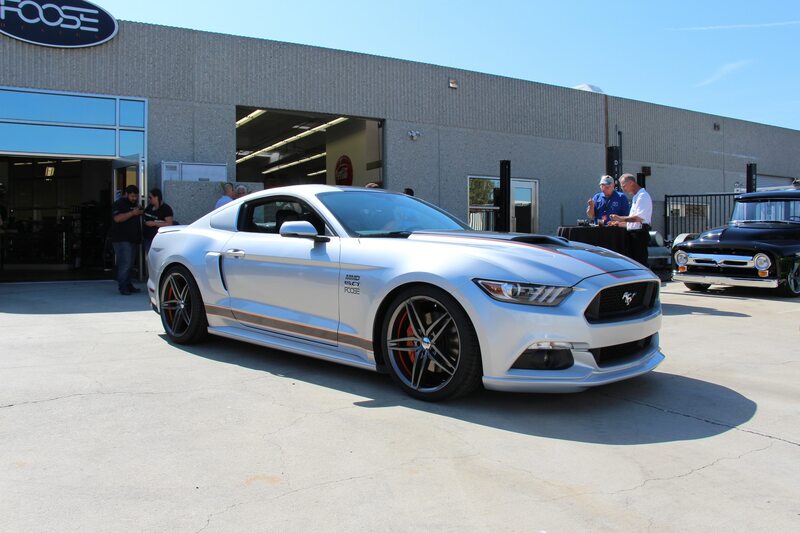 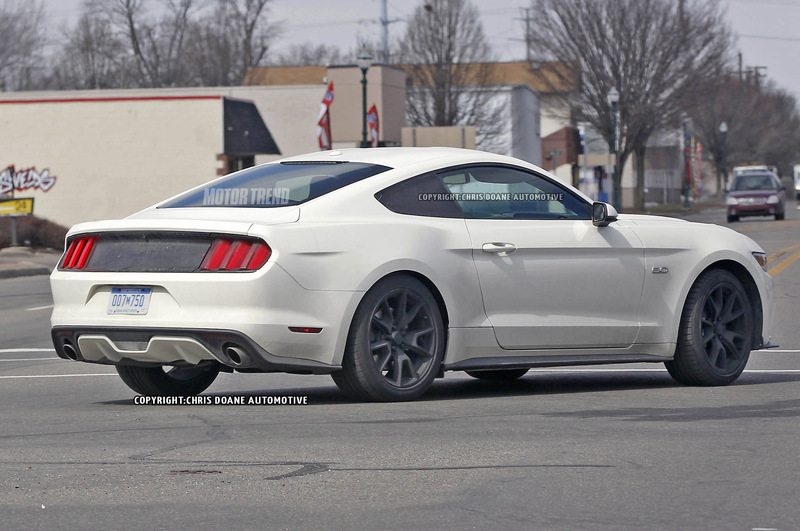 Yet, in coming from this milieu, the 2015 Shelby American GT treatment makes perfect sense. 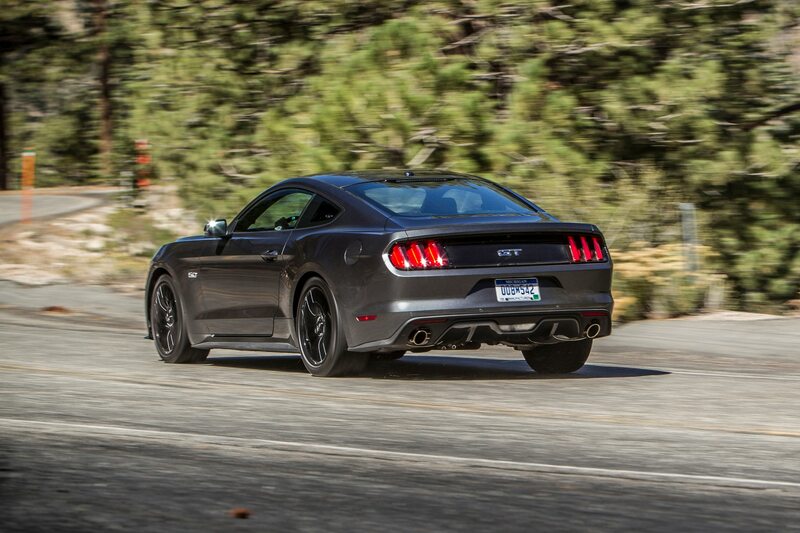 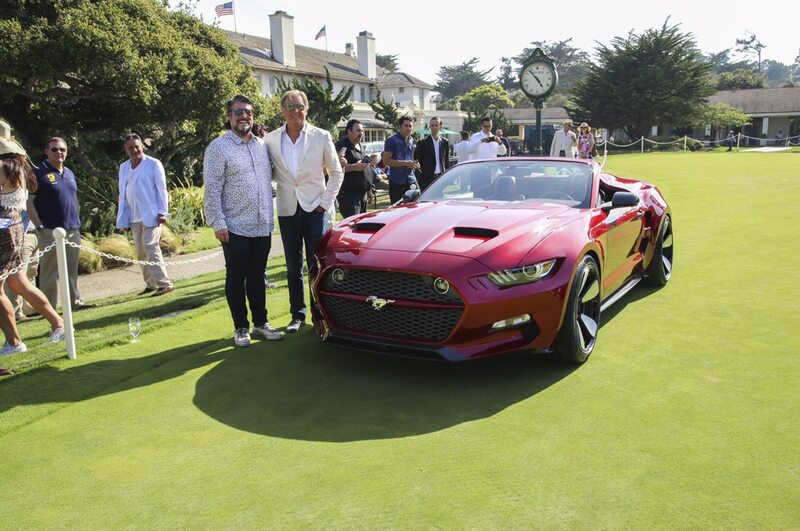 It’s the hangover pill for muscle cars.